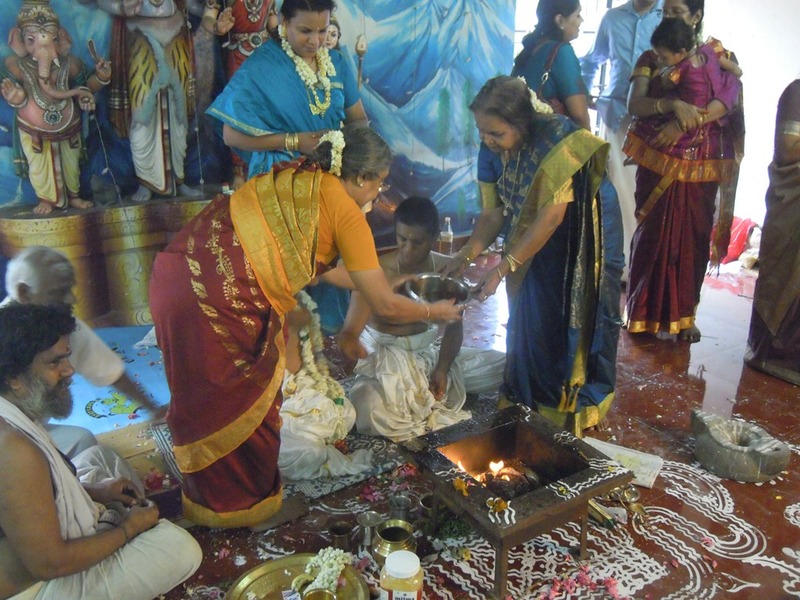 We were invited to a “Thread Ceremony,” an Upanayanam, by our Indian friends Ganesh and Dhanya, who we know from SAT, in Santa Cruz, CA. 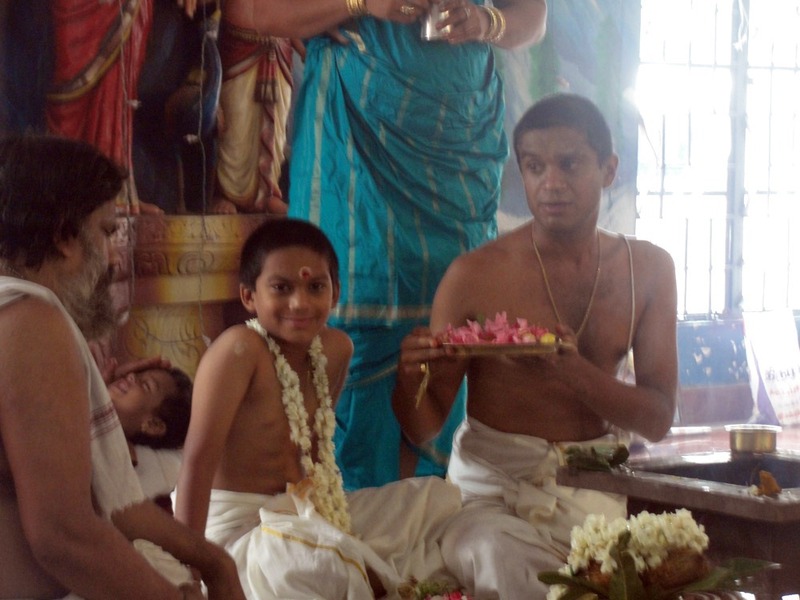 We have known Ganesh for maybe 15 years, and watched his son, Advait, grow from an infant to a child. 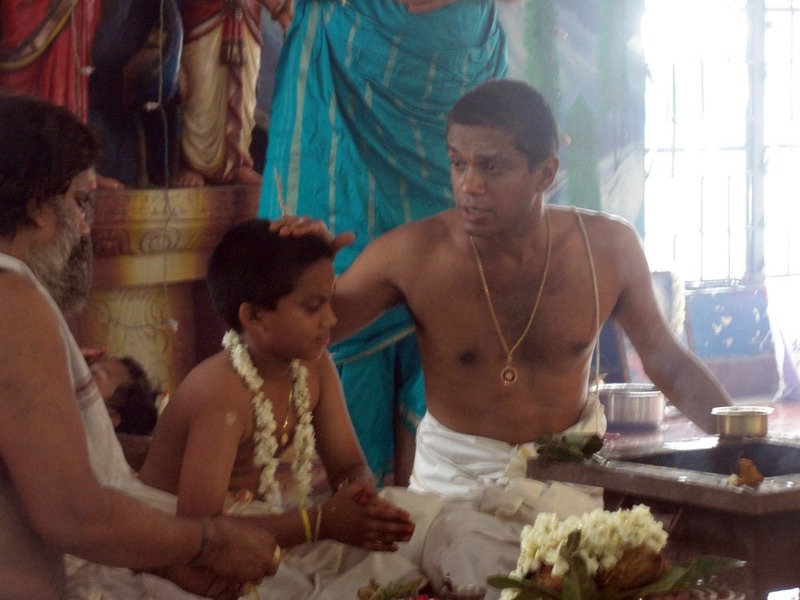 Ganesh is very involved with the SAT temple, and he and Dhanya, always brought Advait with them. So we have known him since he was an infant, crawling on the rug of the satsang hall, and later as a toddler running down the temple stairs behind the meditation hall, laughing, with boisterous steps. 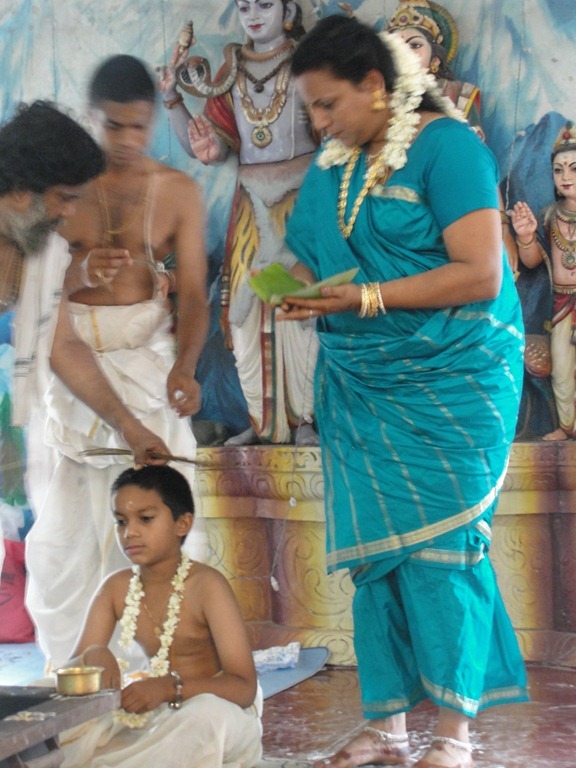 Now the boy is growing up, and his family wants to give him this important coming-of-age ceremony. 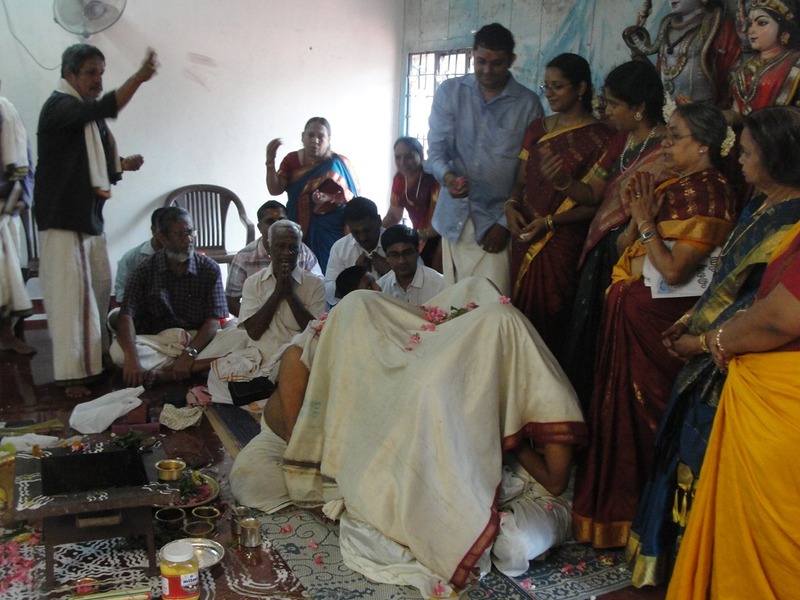 Because this is such an important family ceremony, it was held near the family home in Kerala, so the entire family could participate. We were the only others from SAT who were able to attend. 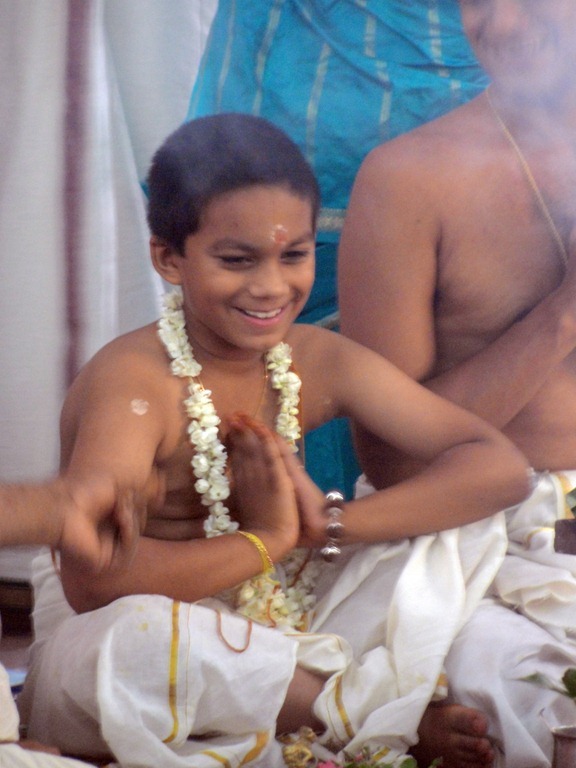 Upanayanam (literally “leaning forward”) marks the entry into a “second life,” and after the performance of this ceremony the boy becomes a Dvija (Sanskrit for “twice-born”). 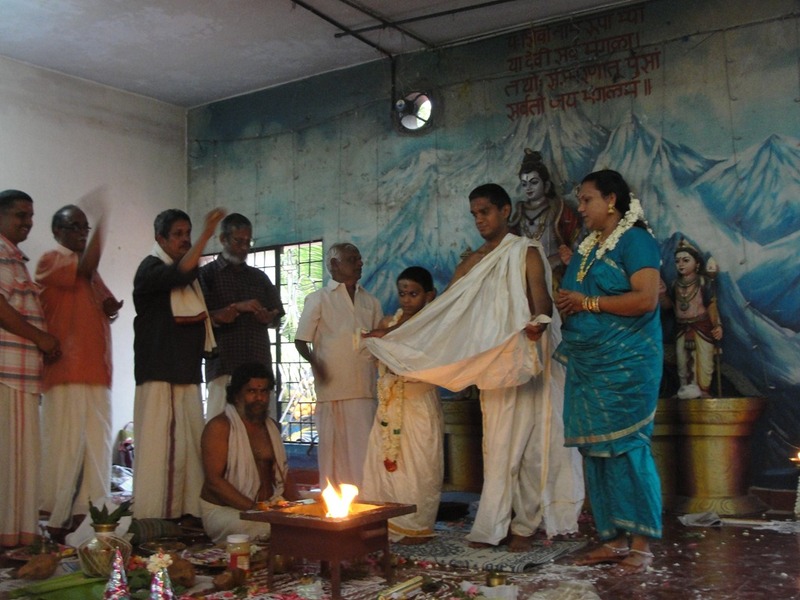 This ceremony is done only for the top three Varnas (ancient social ranks), Brahmins (priests and scholars), Kshatriya (kings, governors and soldiers) and Vaishyas (cattle herders, agriculturists, artisans and merchants), and not for Shudras (laborers and service providers) or untouchables. 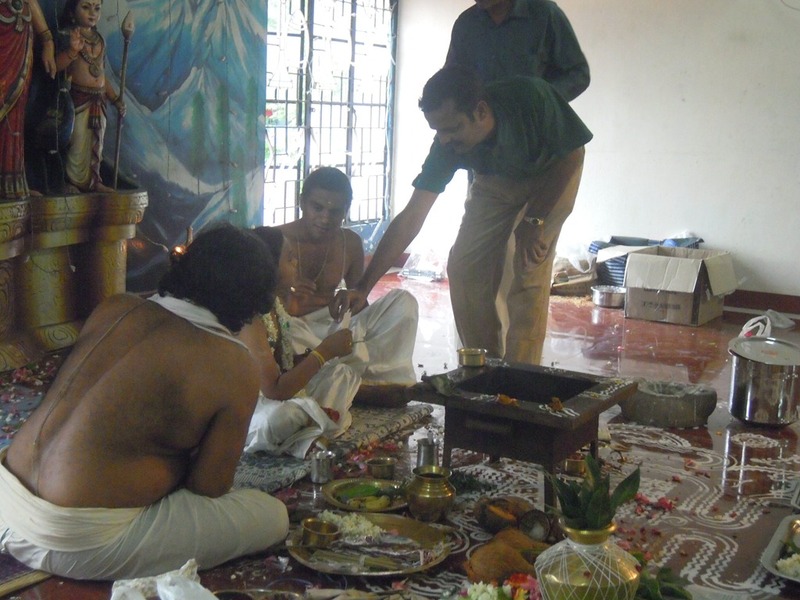 It is a “knowledge ceremony,” used to initiate the process of learning, knowledge, and evolution of adult intelligence. 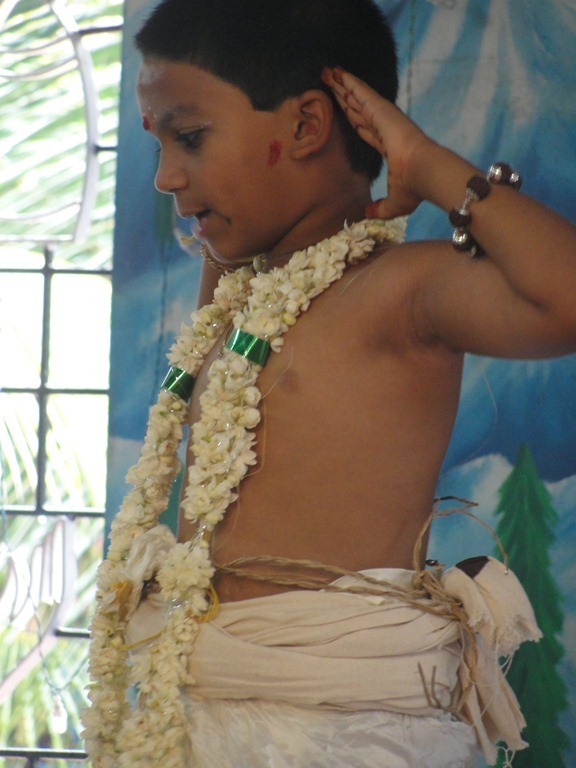 It marks the male child’s entrance into the life of a student (brahmacharin) and his acceptance as a full member of his religious community. “Dvija” means “twice-born”: the first birth is physical, while the second birth is a spiritual one. 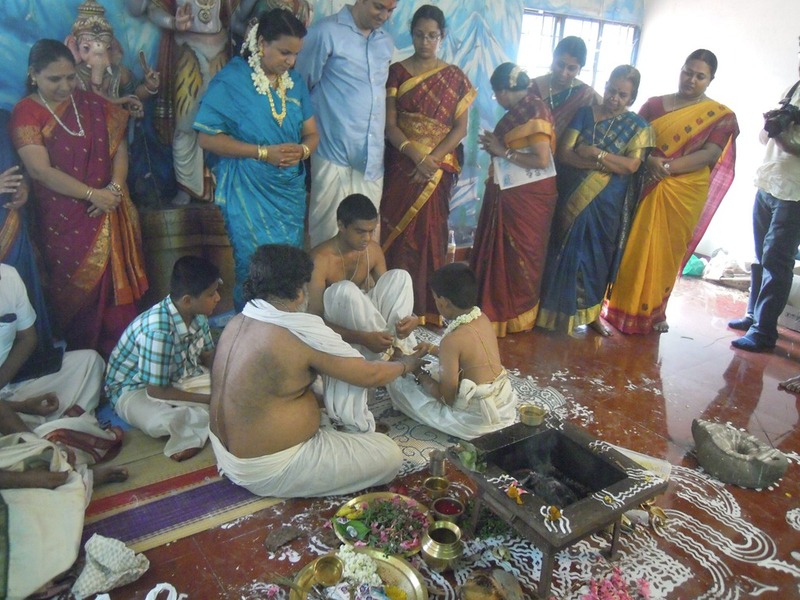 The second “birth” occurs when one takes up the fulfilling of a role in society, at the time of the Upanayanam initiation ceremony. 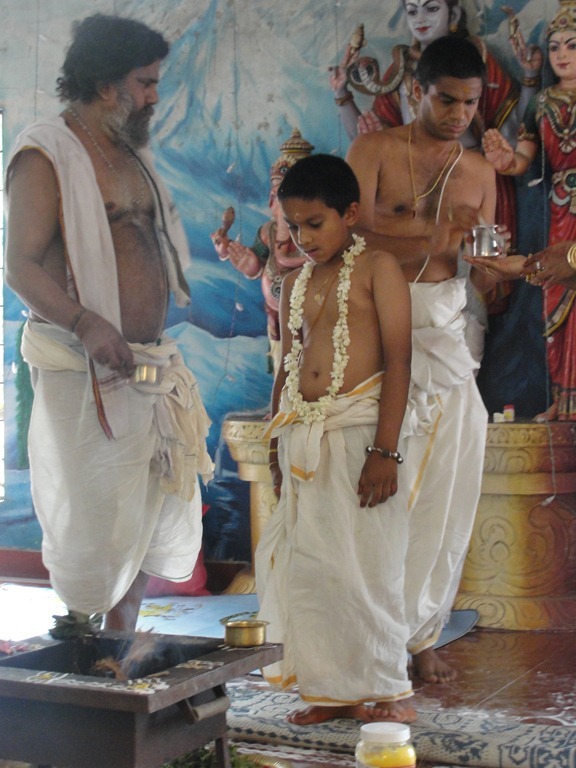 For example, a Brahmin is initiated into the ultimate pursuit of life Brahmopadesam (Preaching/Advising in the matter of the nature of Brahman, the ultimate reality). Traditionally, a Kshtraiya would start learning the use of arms, while a Vaishya would start a trade apprenticeship. 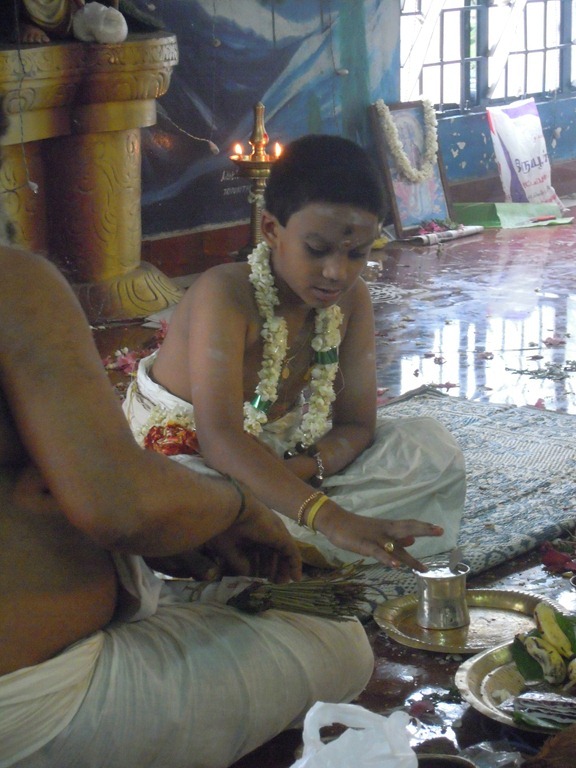 Typically the Upanayanam is done at about age 8 for a Brahmin, 11 for a Kshatriya and 12 for a Vaishya. 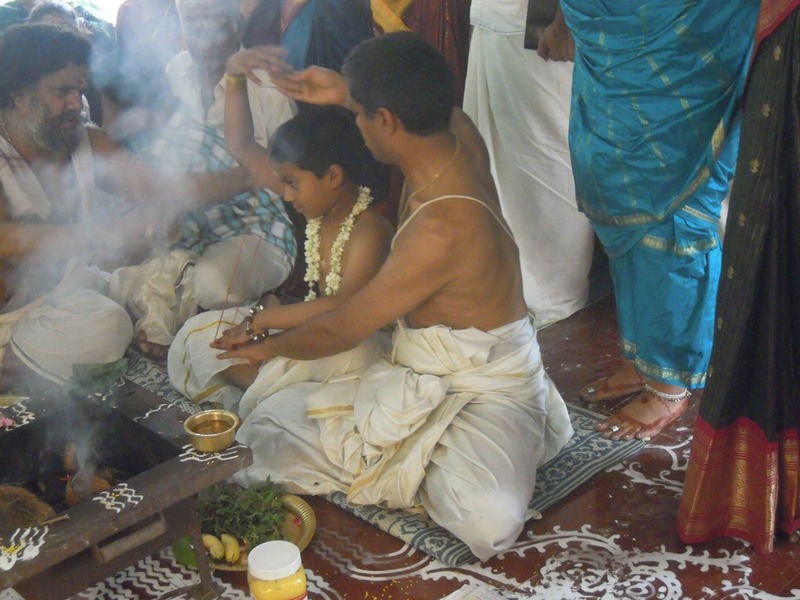 Only the Dvijas were allowed to perform certain sacred rites and rituals in the traditional Brahmanical society. 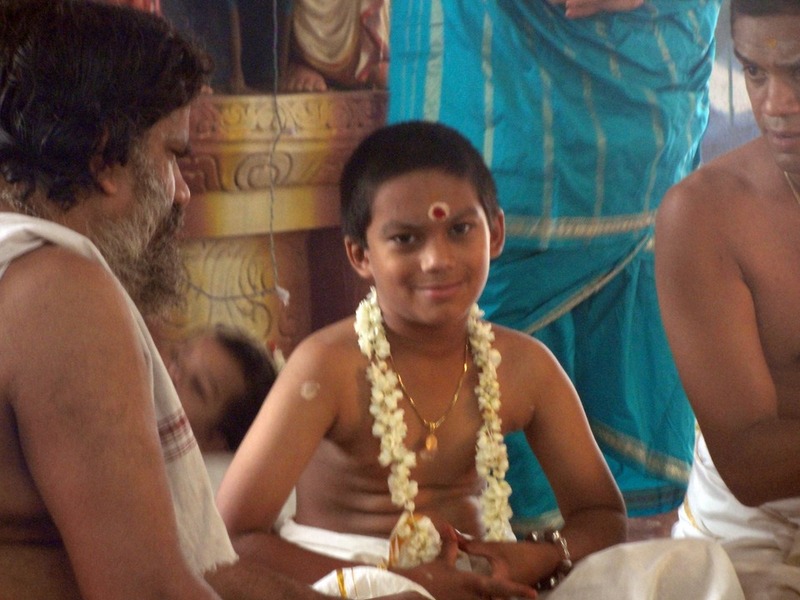 For a Brahmin boy, until the Upanayanam, only the physical personality was taken care of, and not the inner self. The life is said to be similar to that of an animal until this time, with little development of intellect, mind, awareness of family, community etc. When the child reaches the age of 7 or 8, the mind, intellect, etc. develop from that physical stage to a human stage with self-awareness and adult intelligence. It is necessary and critical to regulate and orient the personality in the right direction at this time. 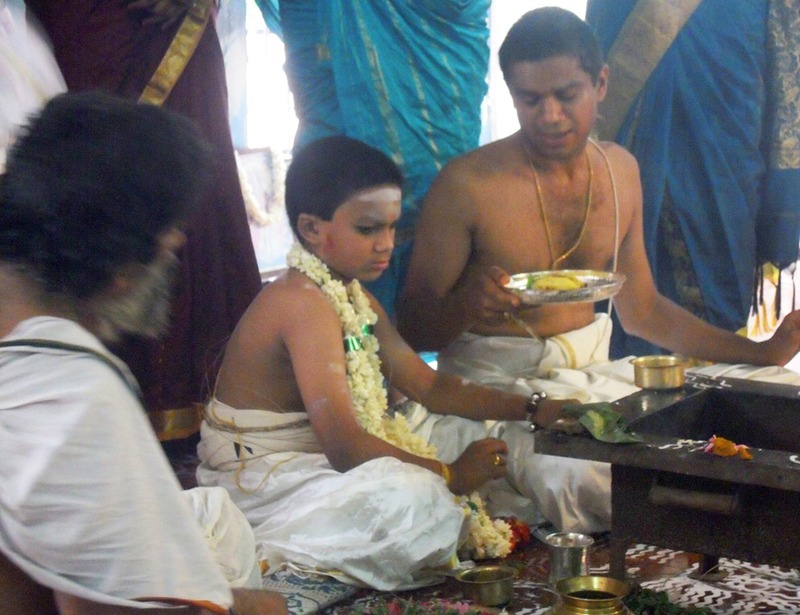 That is the purpose of the Upanayanam. We hired a car to take us from Tiruvannamalai, through Coimbatore, to Ernakulam (adjacent to Cochin), in Kerala. This was a two-day drive. 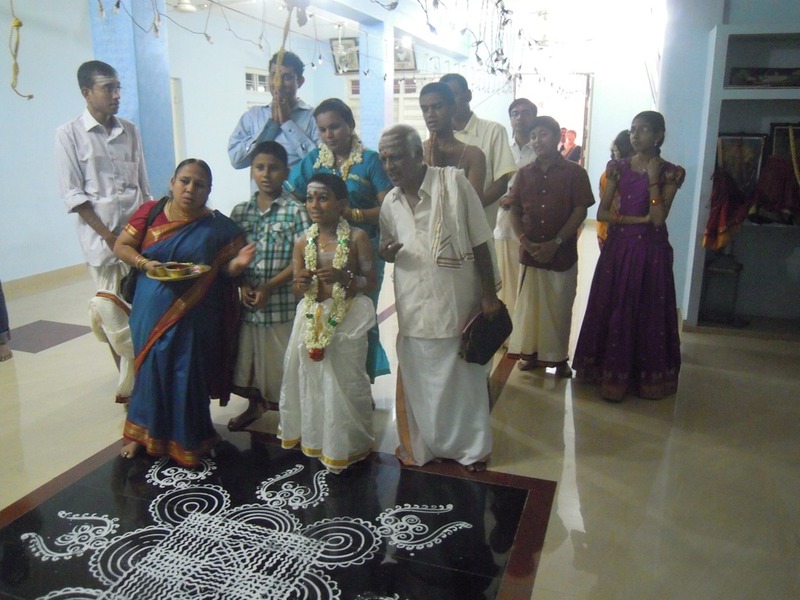 Ganesh and his family had arranged a hotel for our stay. (I discovered when I checked out that he had paid for the room as well. Generous and unexpected). After we rested, our driver took us to the hall where tonight’s event was taking place. This is the night before the main initiation ceremony, and they have set up a classical music (singing) concert. 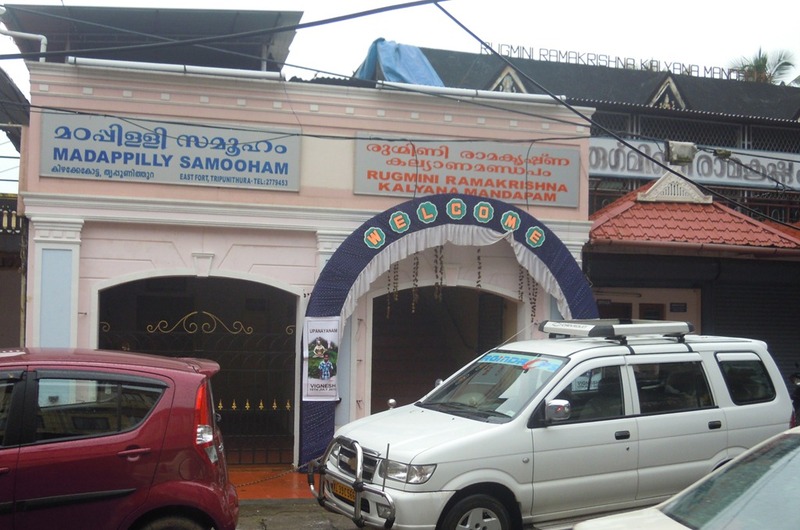 The small building is the Madappilly Samoohan hall. 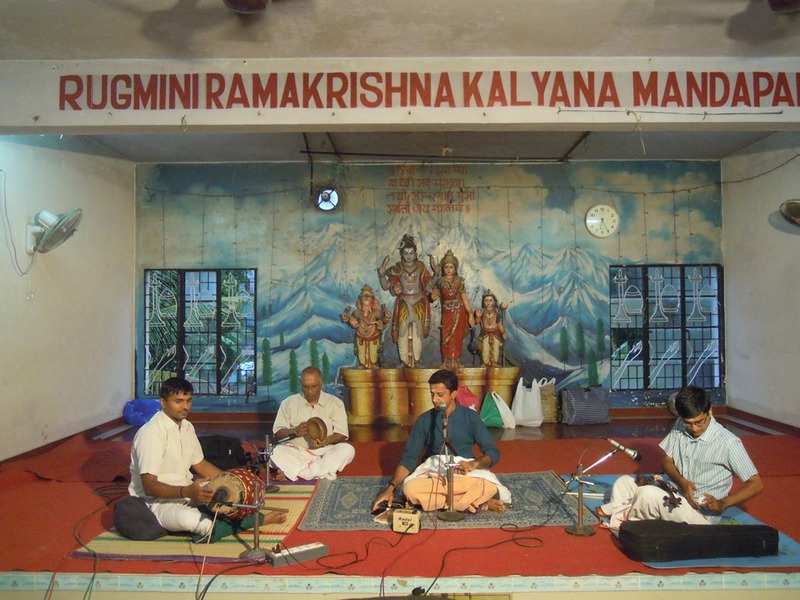 The other sign says Rugmini Ramakrishna Kalyana Mandapam. 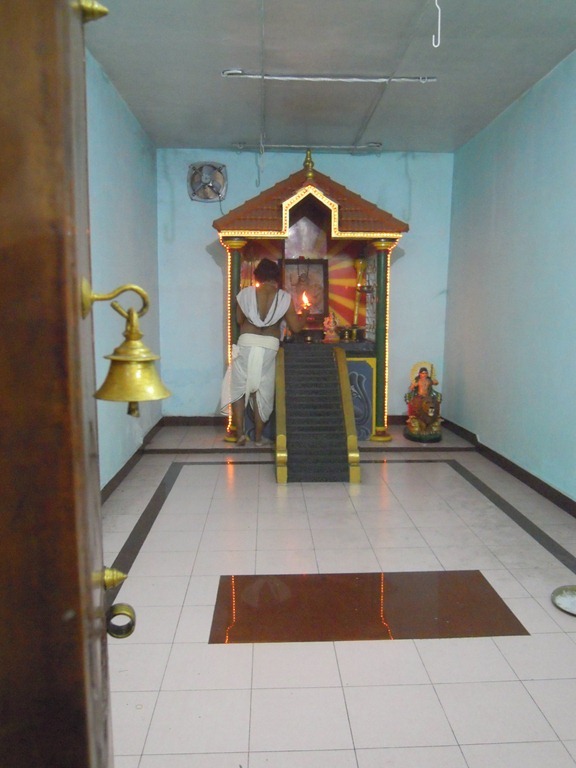 This is the upstairs hall where the concert will he held tonight and the Upanayanam tomorrow. A blue arched “Welcome” sign adorns the door. 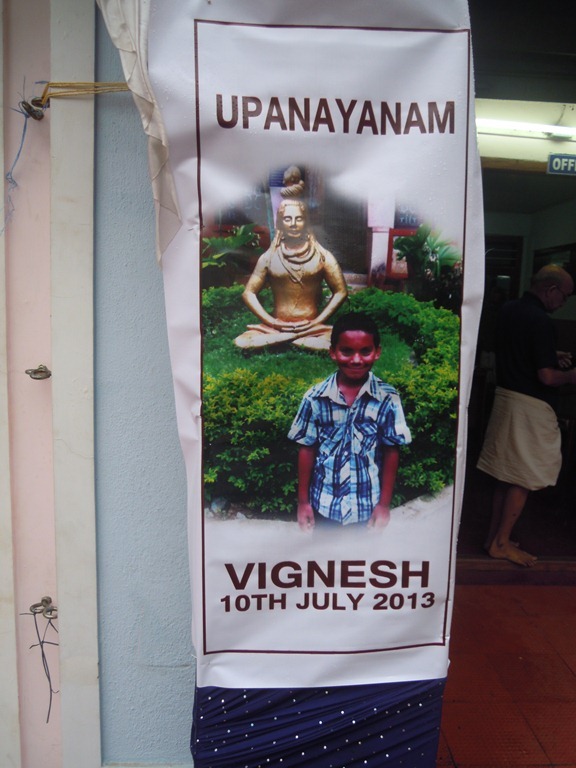 On it are these signs, announcing the Upanayanam for Advait (whose other name is Vignesh). Upstairs in the mandapam, the musicians are setting up–two drums, a singer and Ganesh’s younger brother, Mahesh, playing the violin. 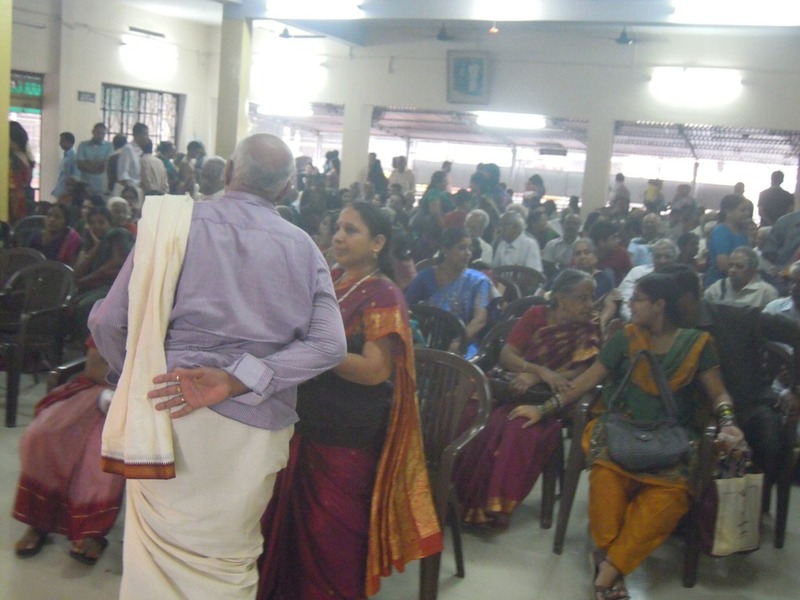 The music is South Indian Carnatic music. 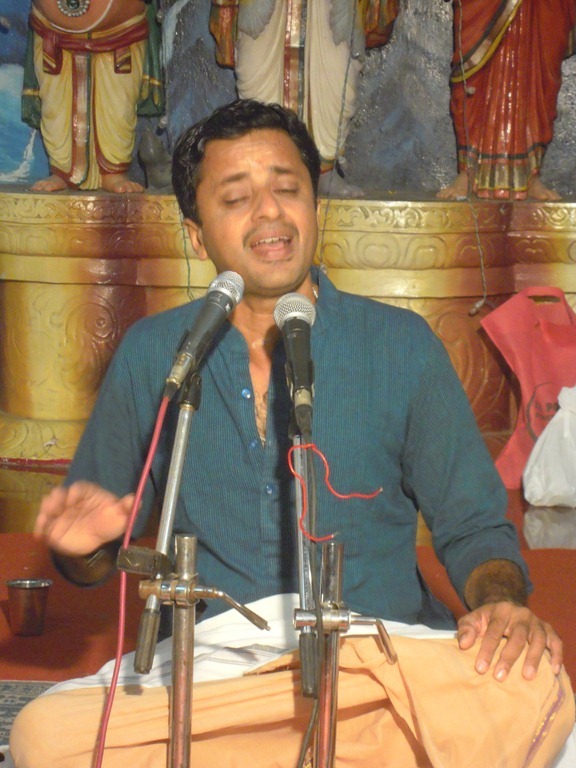 The singer is Sri Geetha Krishnan. 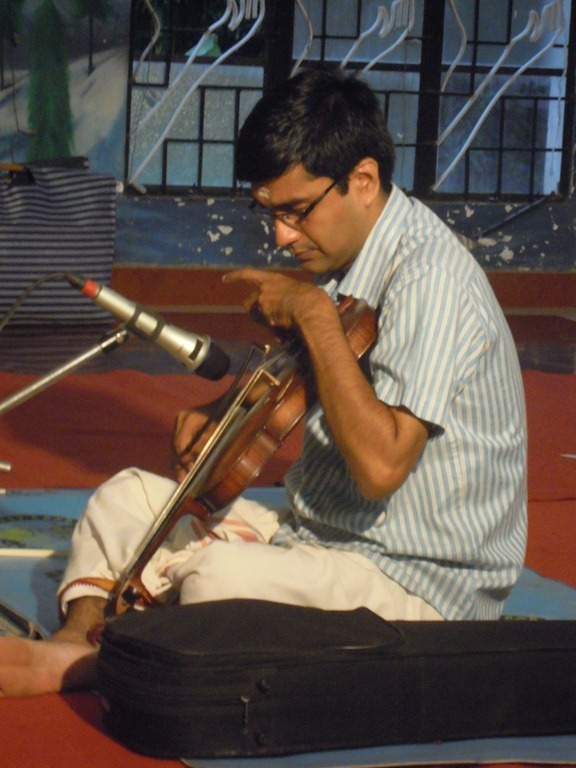 The style of violin play is uniquely Indian. 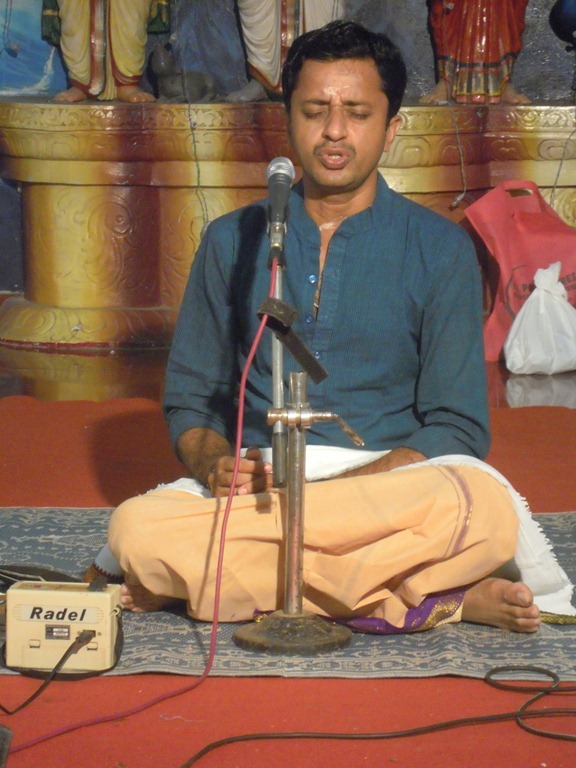 The position of the instrument is between the shoulder and the feet, on the floor. Most notes are played without any vibrato, but vibrato is used when called for; vibrato in an India fashion, not the conventional western form. The singer is a professional musician. You can see that he really gets into the performance. All the family kids of the generation are here tonight. 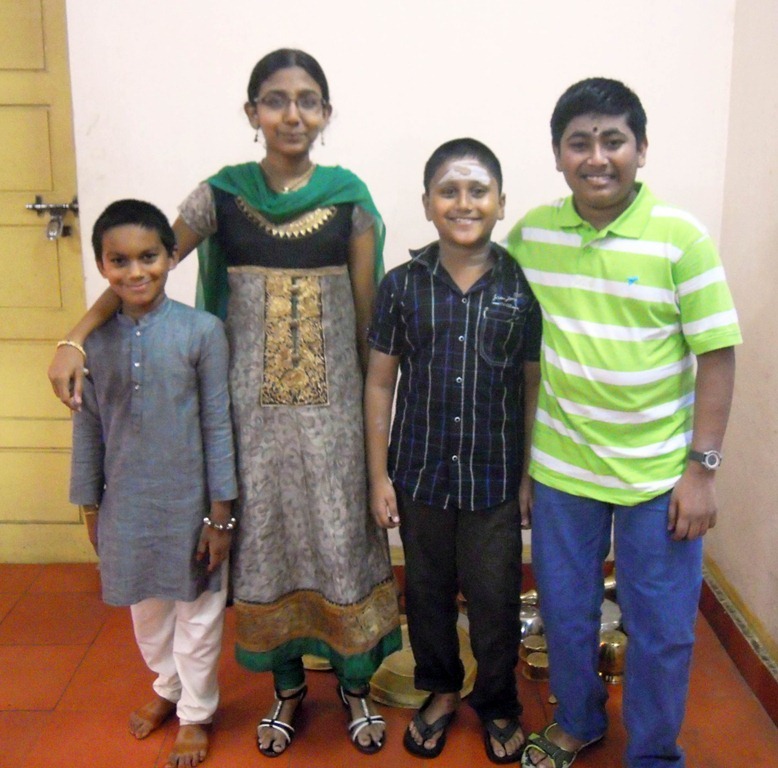 Advait is the youngest and smallest, standing to the left. Next is Lakshmi, then Sriram, last is Aditya. Advait’s mother, Dhanya, talks to Carol. She is also a Tamil from Kerala. She and Ganesh married (arranged, naturally), and she moved to the USA maybe 10 years ago. We remember when Ganesh left for India and came back with his new wife. 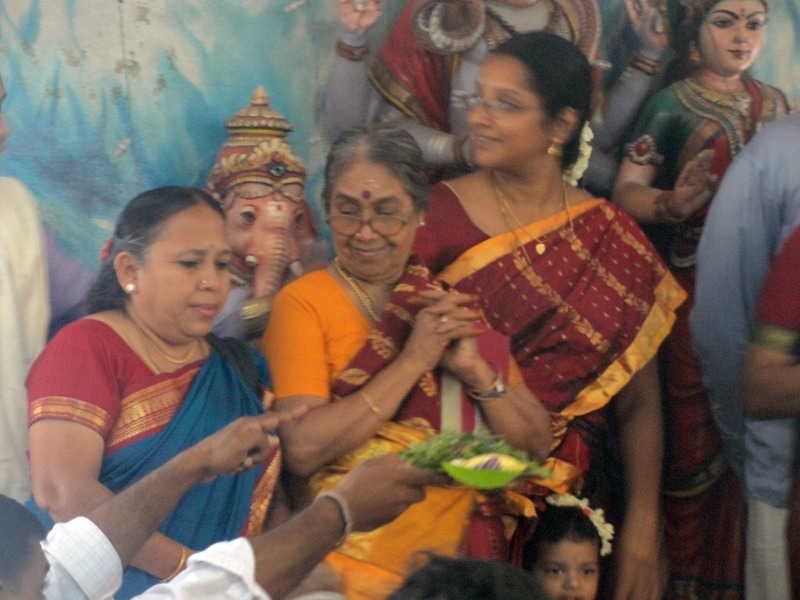 The lady in the center below is Advait’s grandmother, Ganesh’s mother, Visalam. 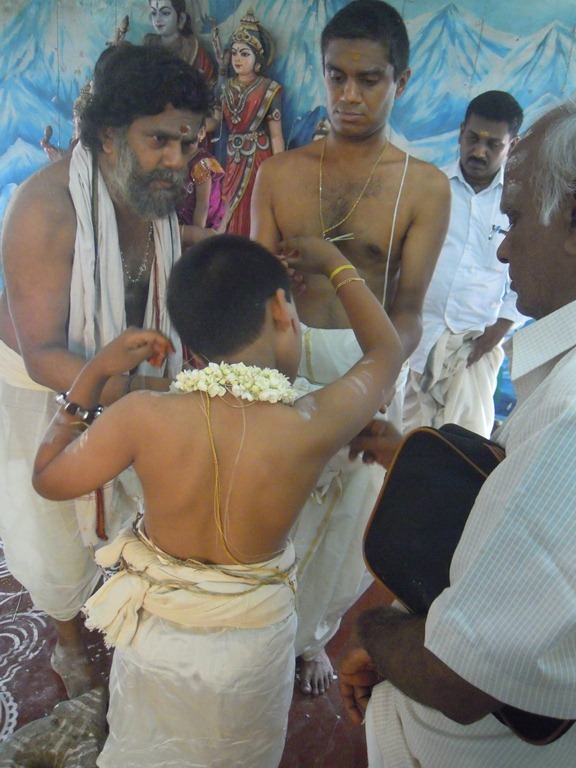 In white near her is the Grandfather/Father, Sadasivan. 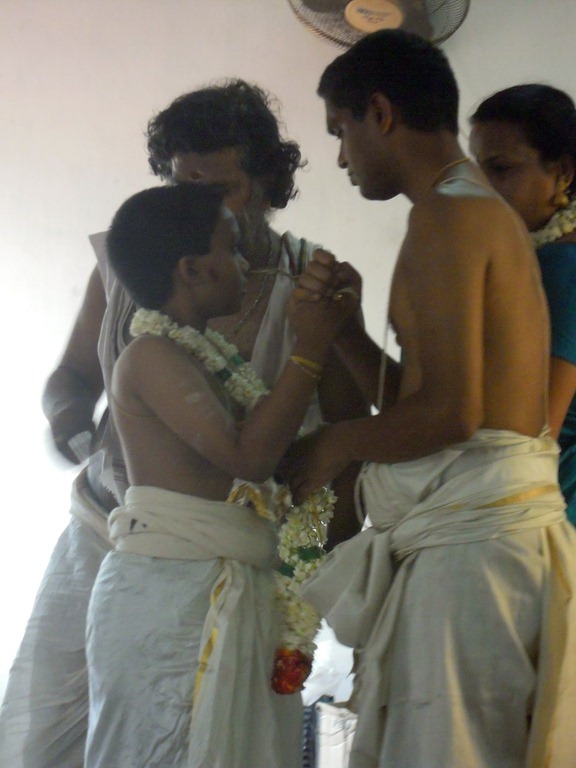 As mother and father of the father of the boy, they have a most important part to play in the coming Upanayanam. Mainly family members are in the hall tonight. 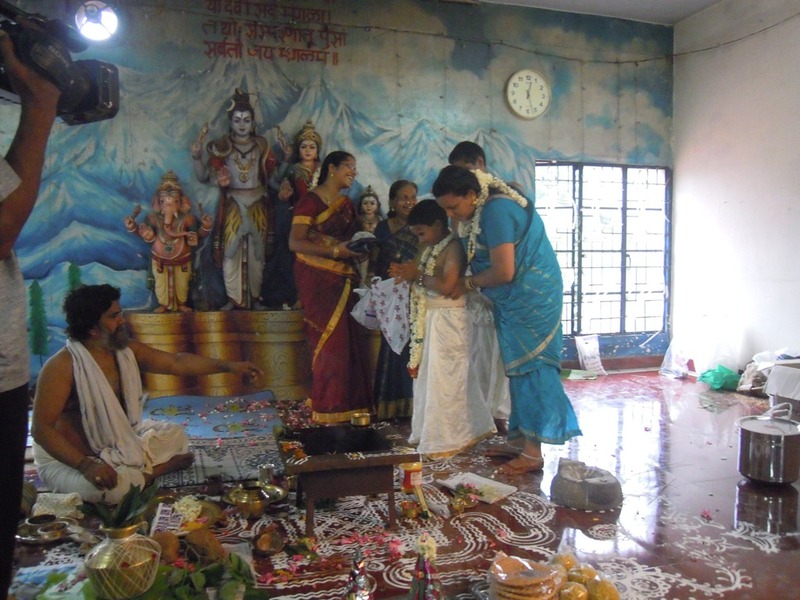 Celebrations like this are the main time that all of the family gets together, both Ganesh’s and Dhanya’s, so they are particularly important family events. Many family members have been working for months to arrange this celebration, especially, I think, the oldest brother of Ganesh. 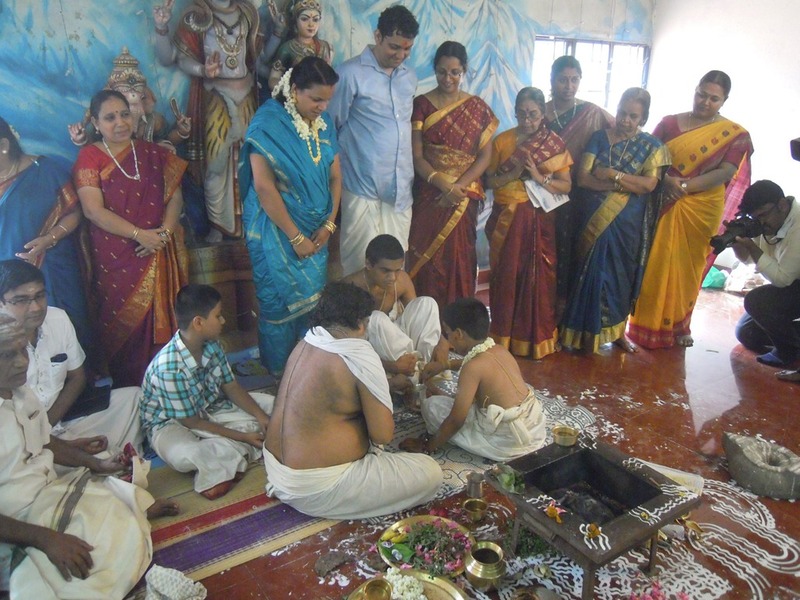 As an example of some of the planning that needs to be done is to figure out exactly who in the family will be attending, and exactly how he or she will be involved in the ceremony. Each family member must have some part to play. This is a given. The singer is still very much into the music. 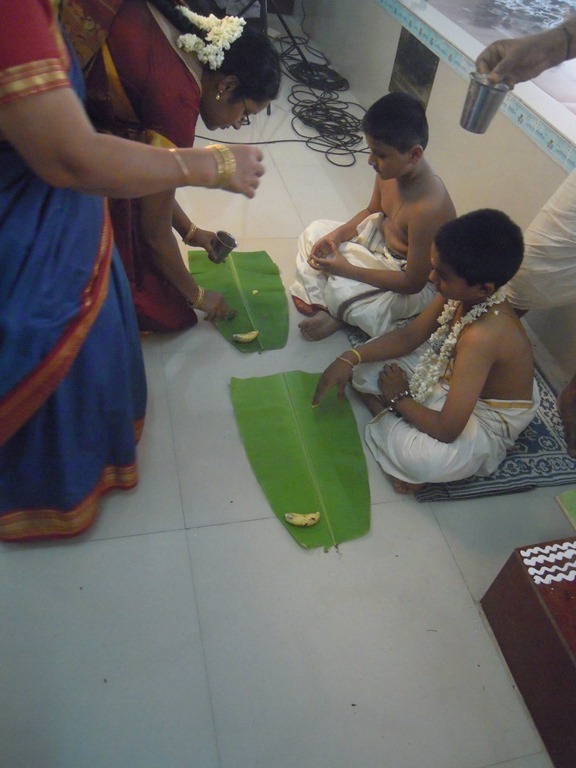 After the concert, a typical South Indian meal was served on a banana leaf; rice, sambar and a few more items. For most of these functions, Indian hospitality requires that you be given food. Naturally the next day began with breakfast. Idlies, vadas, dosas, sambar, coconut chutney. Below are Ganesh’s two brothers. 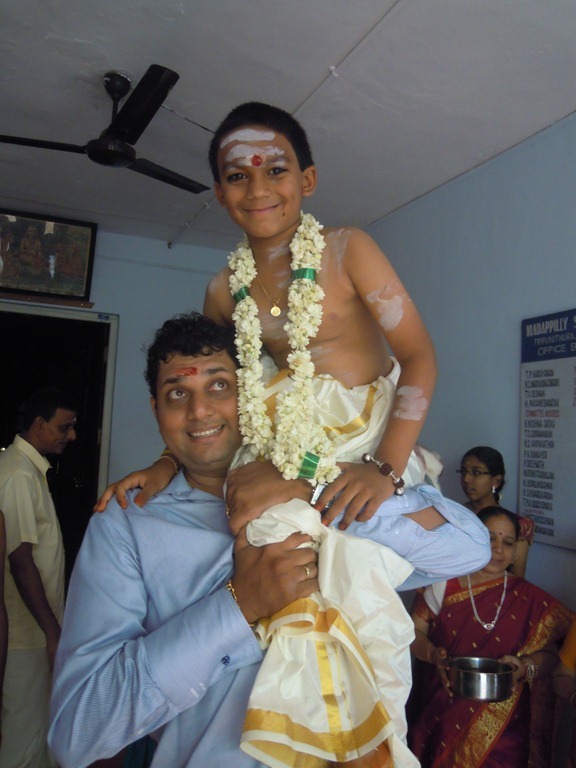 The older one, Jayaram, is to the left. 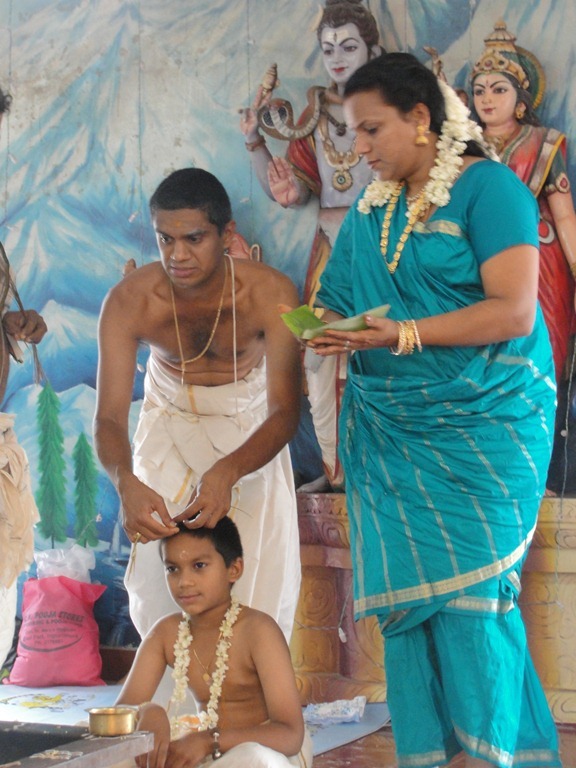 In the Indian family the oldest son has a special place; he is the primary male of his generation, has the most family responsibility, including care of the parents as they age and die. He even has the critical role during the cremation of their bodies. 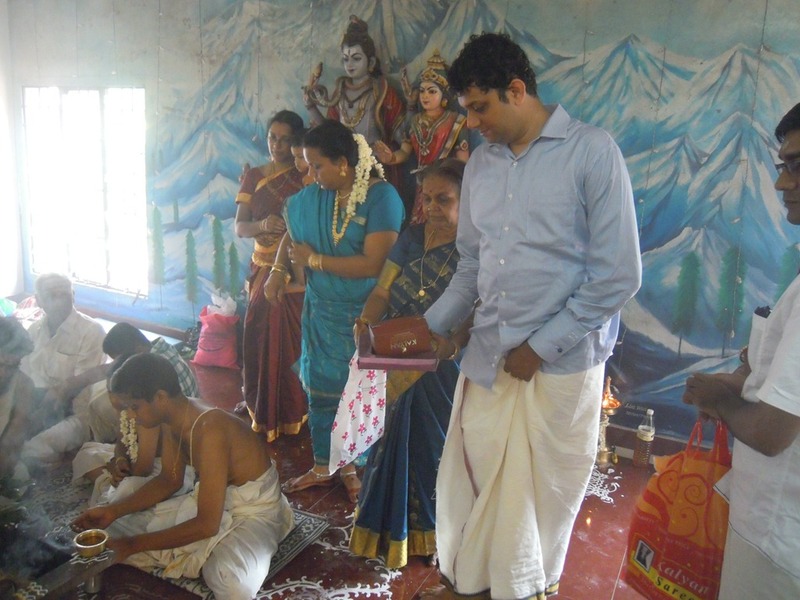 Of the brothers, it is Ganesh who lives and works outside of India, in Silicon Valley as a software engineer. 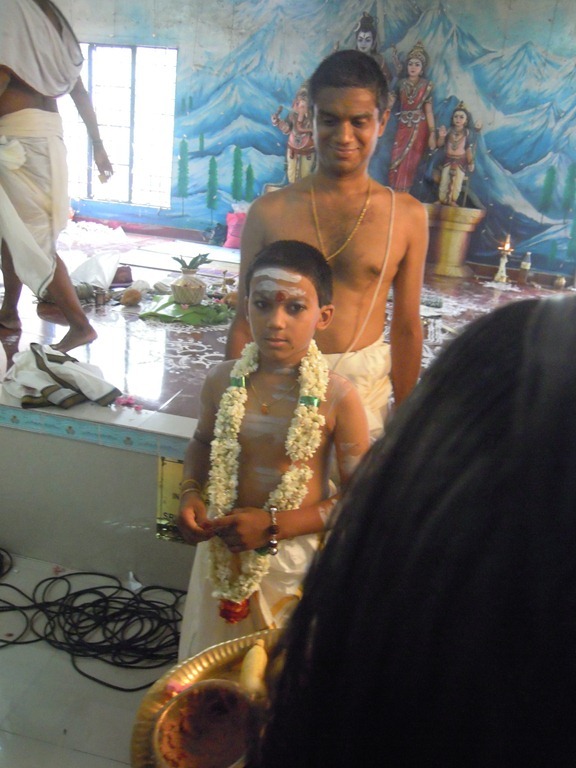 The younger one, to the right, is Mahesh. He played the violin last night. 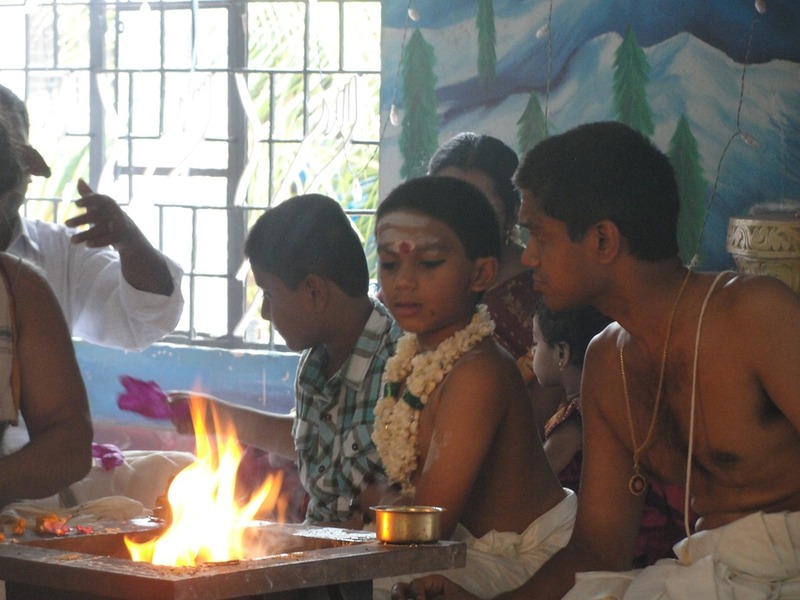 Today’s Upanayanam is centered on the fire pit – the vedi. 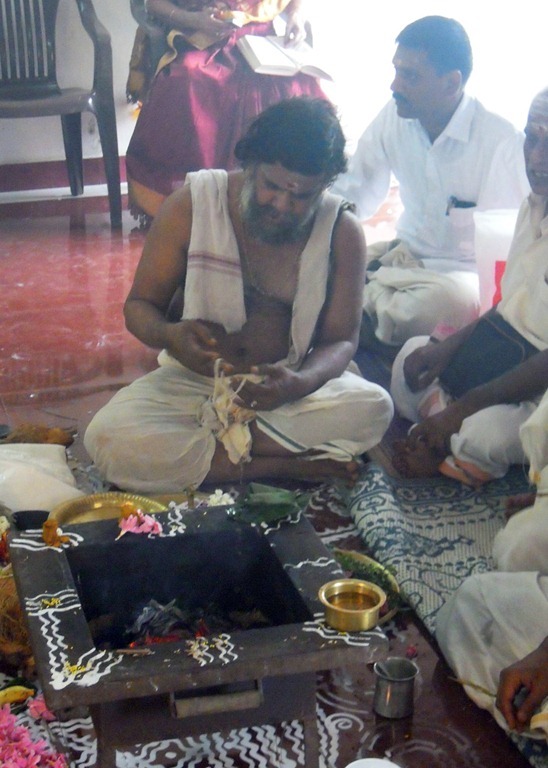 These ancient sacrifices to the holy flame (the god Agni) are called homa/homam or havan. These are interchangeable with the word Yajna. 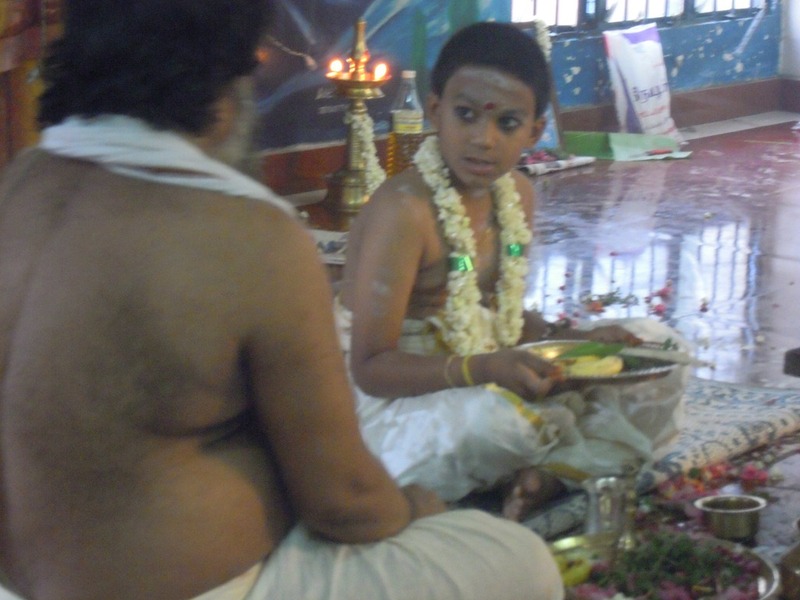 Since the Upanayanam is centered on the vedi, I think it must be very old. 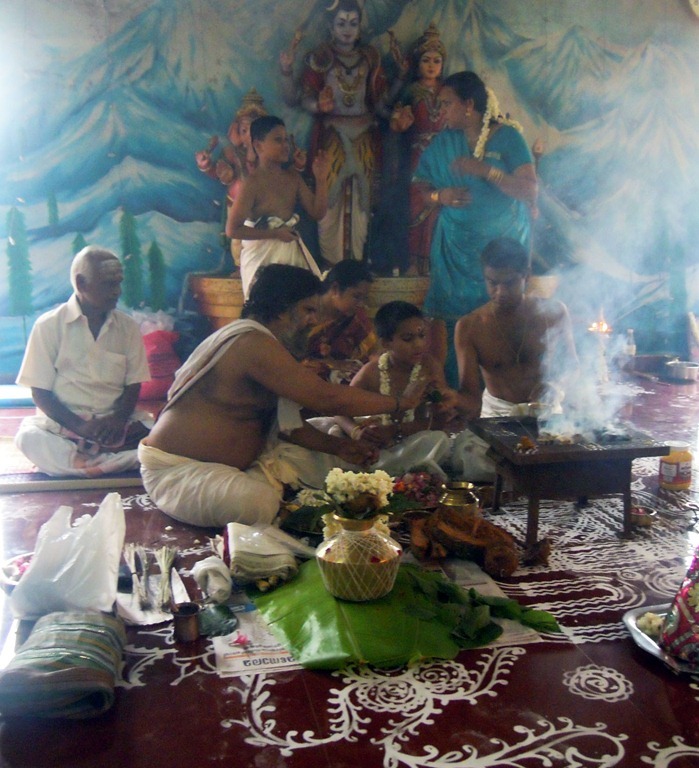 In fact, these Yajnas were a central part of Hindu worship dating from ancient Vedic times (at least 3500 years ago, probably much older, some say as old as 12,000 years), and extensively written of in the four Vedas, which continue to be the source of most mantras chanted in the performance of these rites. 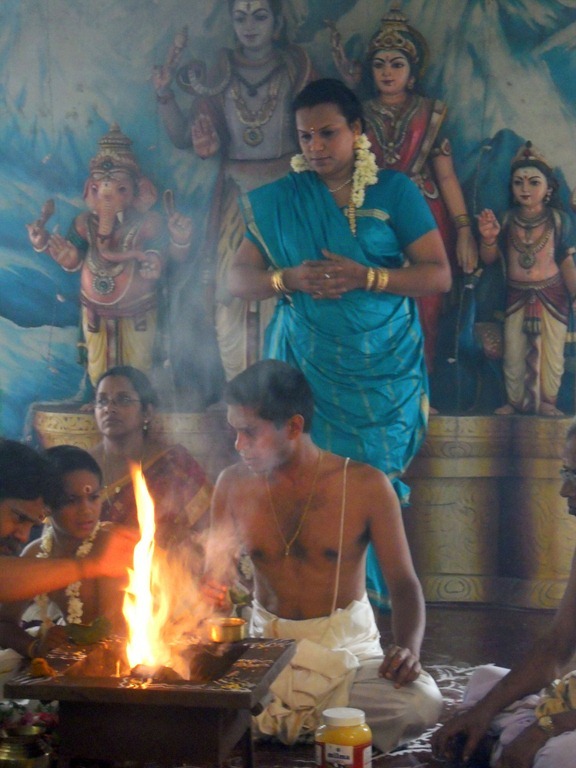 An essential element is the ritual fire, the vedi – the divine God of Fire, Agni – into which oblations and offerings are poured; everything offered to the fire (Agni) is believed to reach God. 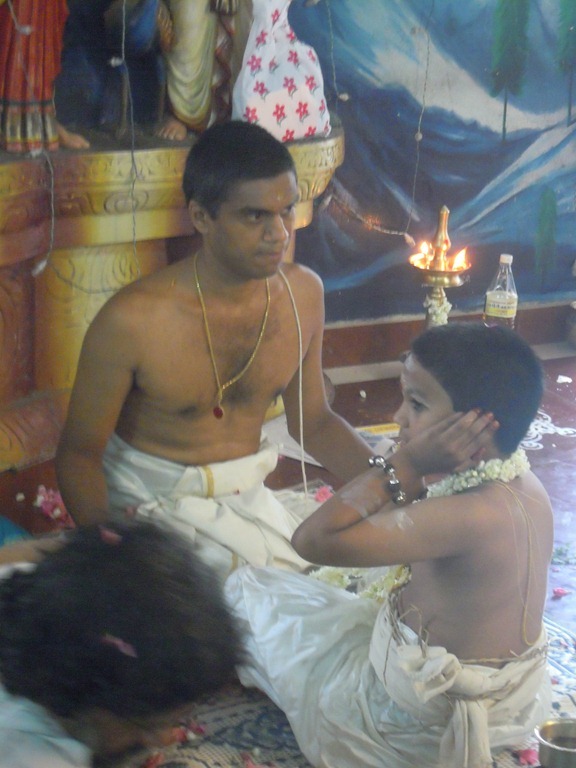 The version of the Upanayanam being done today is Tamil Brahman – Iyer. 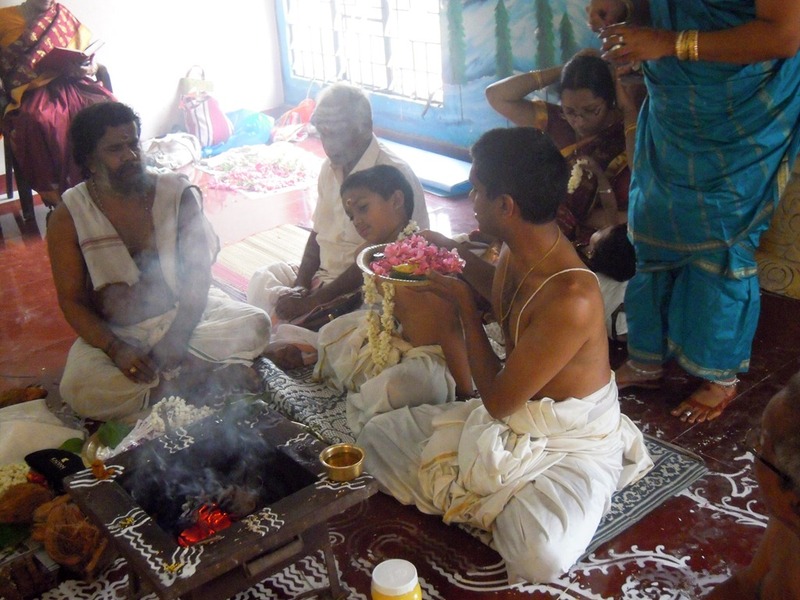 Different groups, different families, may perform some parts of these rituals in their own way, but I think the main elements are set in the Vedas. This day is really the culmination of a ceremony that started about one week earlier in the family household. 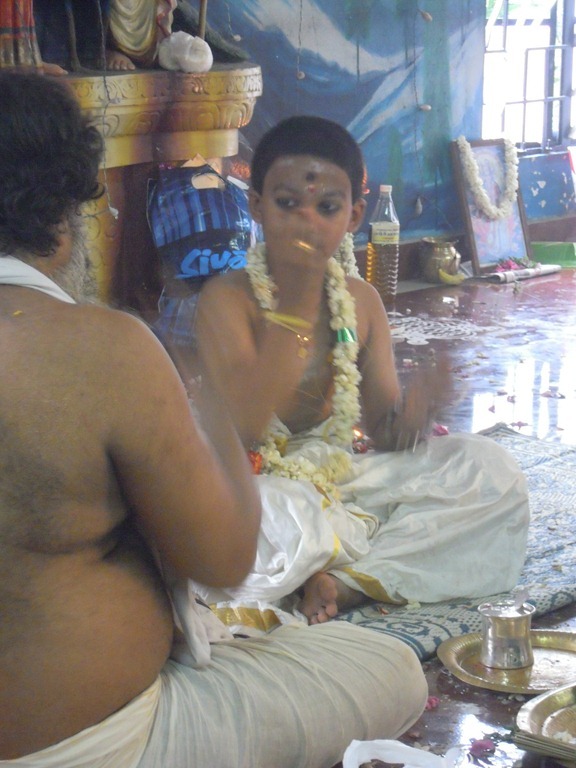 Ganesh said that he and Advait had started a week before this day. 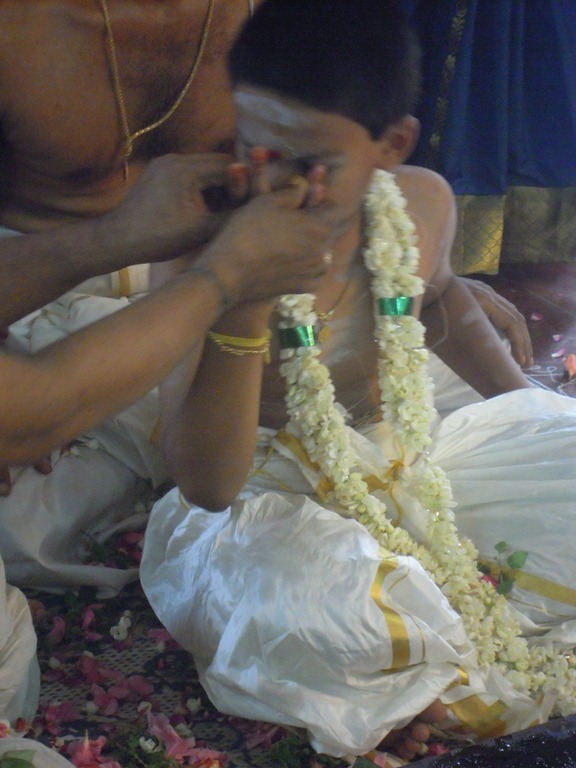 Puja to the Upavita (Sacred Thread) which he would wear on the day of the function. 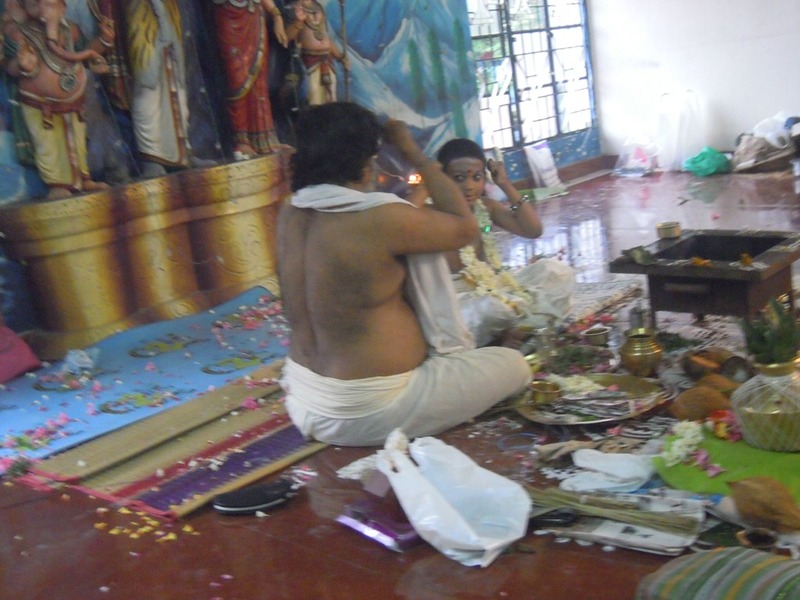 Invite 12 Brahmins (each representative of a name of Visnu Kesava, Narayana, Madhava, Govinda, Visnu, Madhusudana, Trivakrama, Vamana, Sridhara, Hrisikesha, Padmanabha, Damodara) give them daanam, feed them. 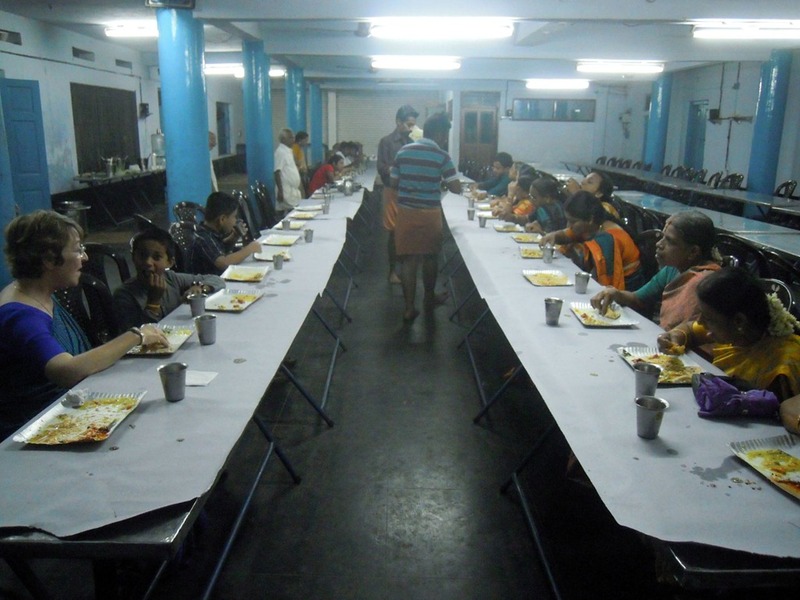 Daanam (also called Annadanam, Poor Feeding) to needy people. 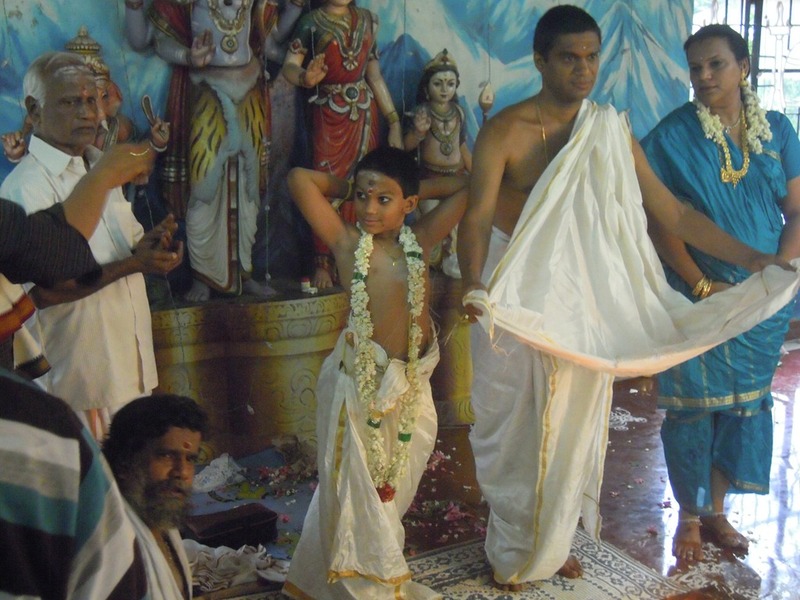 Take up portions in Srimad Bhagavatam pertinent to Upanayanam of Sri Krishna and Vamana murty (Vamina is a Vishnu avatar, shown either as a dwarf or a giant. When shown small in stature the sculptures may depict him as a deformed dwarf, or as a brahmachari (monastic student), dressed in the deer skin, loin cloth, and sacred thread, and with the tufted hair of the student. 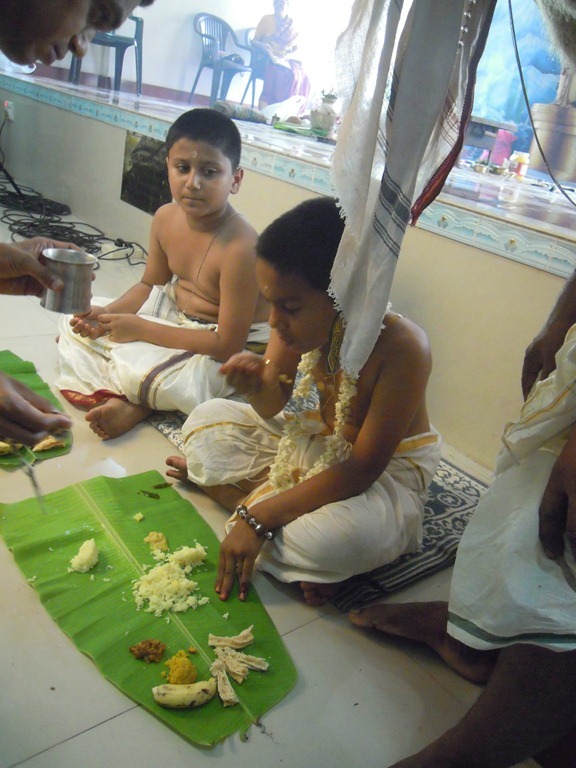 Advait and Ganesh spent time understanding the different steps of the main function and the mantras that would be chanted. Advait was highly encouraged to keep his mind very peaceful. 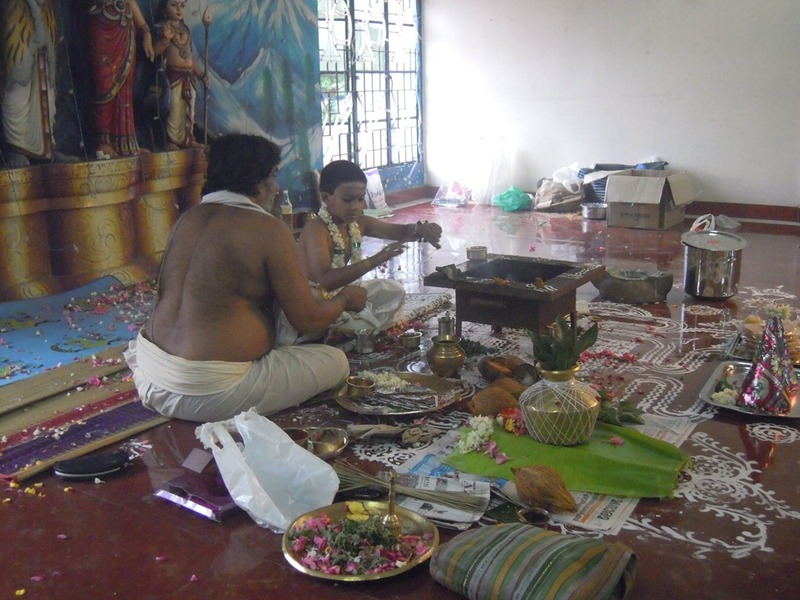 upa (near) – nayanam (naya is the root, meaning lead) – lead one near to the Vedas or Guru or Supreme Brahman. upa (near) – nayanam (eyes) – Making one aware that there is another eye besides the physical eyes, i.e the eye of Knowledge. They have to open that to realize the Self. 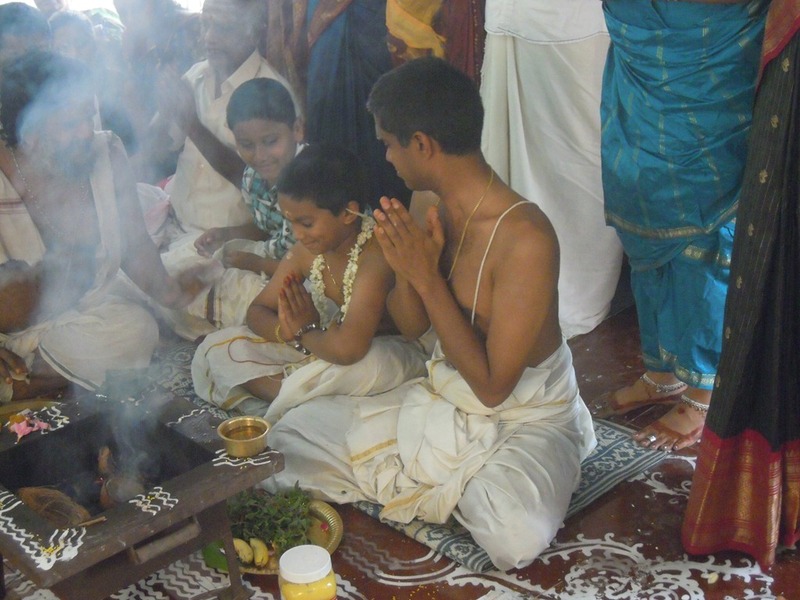 The Upanayanam has ancient roots, with many elements – mantras, homas and poojas – that are prescribed in ancient Hindu tests. I think certainly it is older than 3500 years. 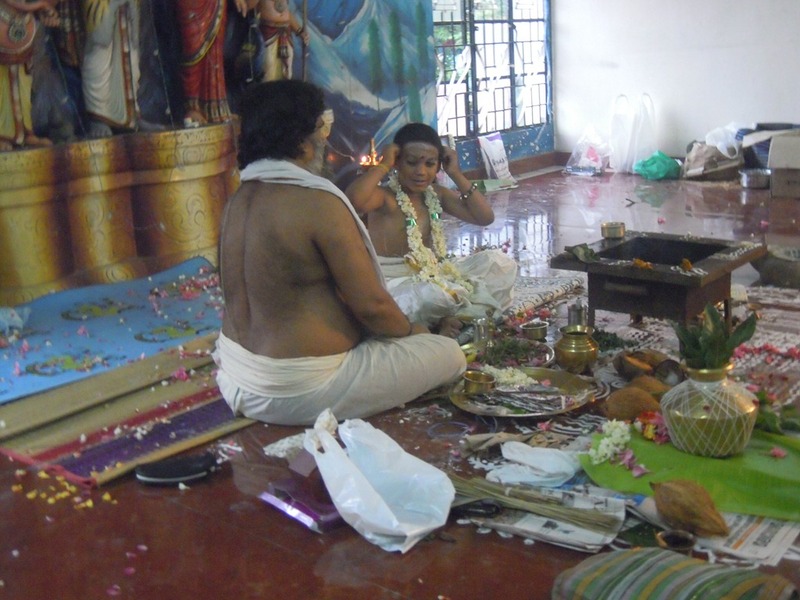 The extensive rites also means that this key day of the ceremony is pretty long. Our photographs of the event were taken over about four hours. 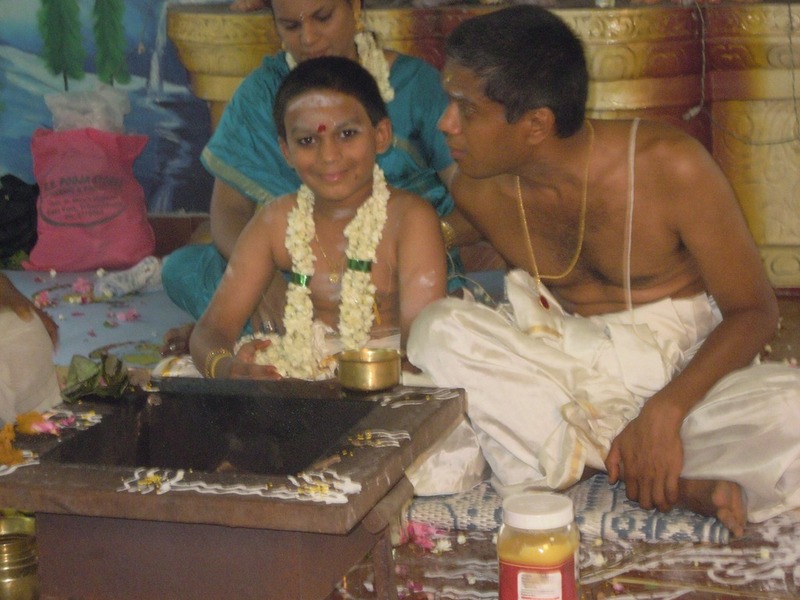 Of rite-of-passage ceremonies we have attended, the Upanayanam is the longest, with the exception of a marriage. 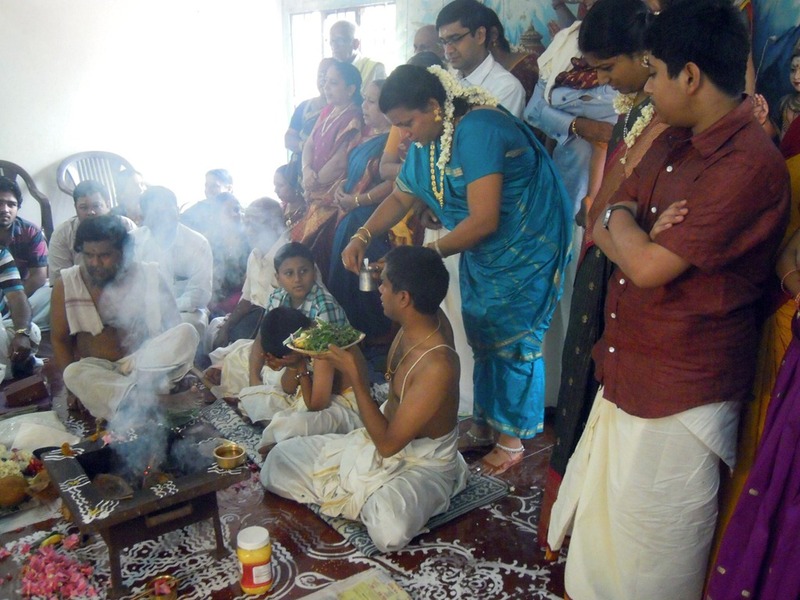 The first part of most Indian ceremonies is the invocation. This calls to the gods and asks them to be present and join in, and for the permission and blessings to these efforts. 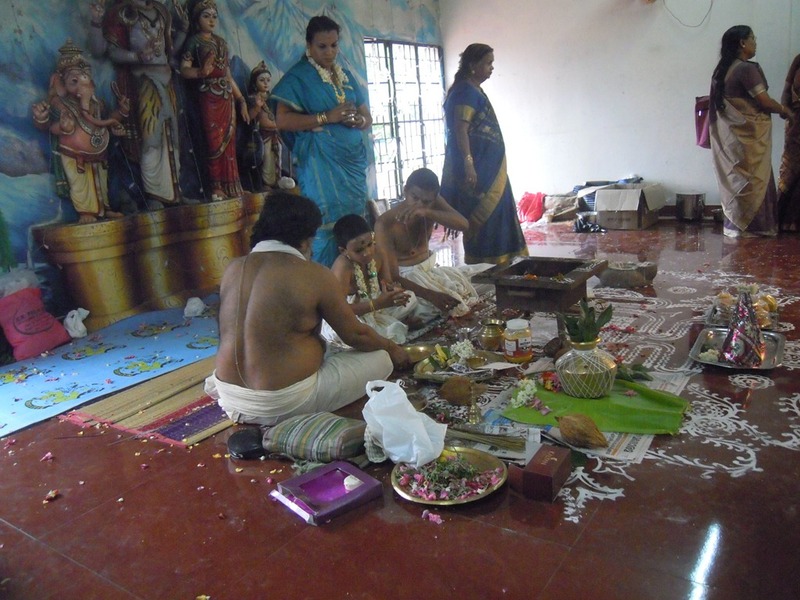 Invoked for this ceremony are Ganesha, for successful completion of the ceremony, and the ancestors. 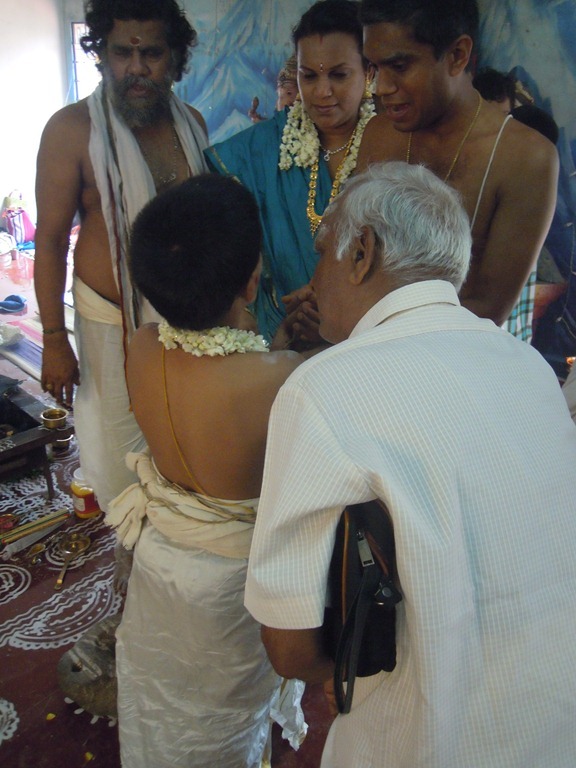 During this part of the ceremony permission will also be sought from the elders to perform this ceremony. 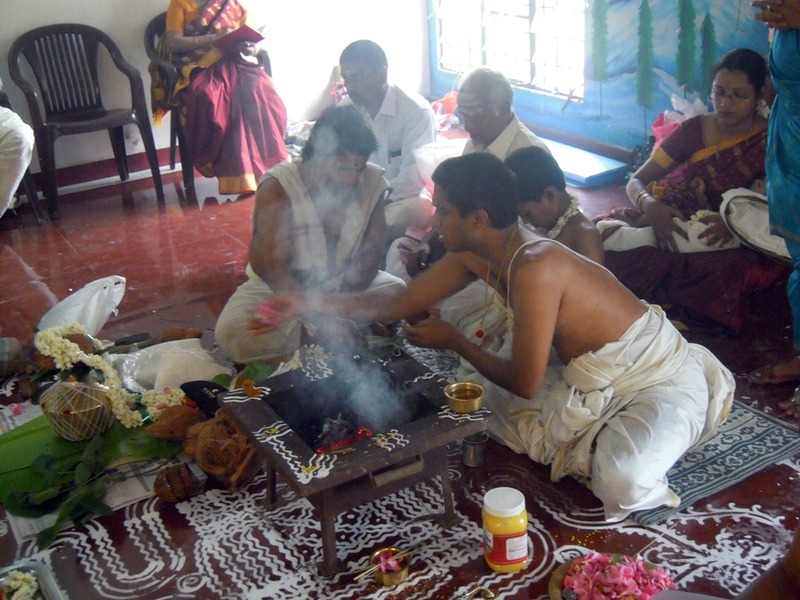 Then there will be a pooja to Ganesha, a Punyaaham (Purification function) and Graha Preethi Dhanam (for removal of all dhosha – impurities). We arrive about 9:30. The public last day of ceremony has already started. 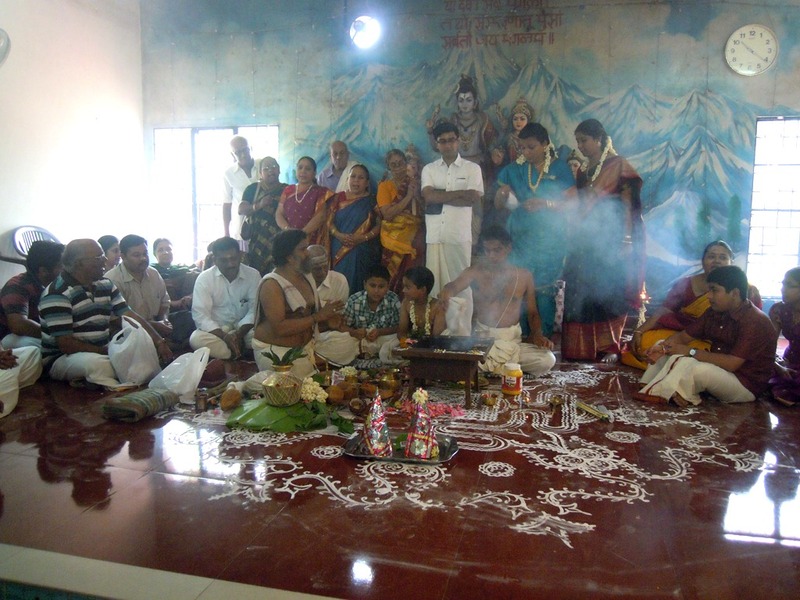 The participants are sitting on a raised stage with Siva, Parvati, Nandi and Murugan standing behind them. 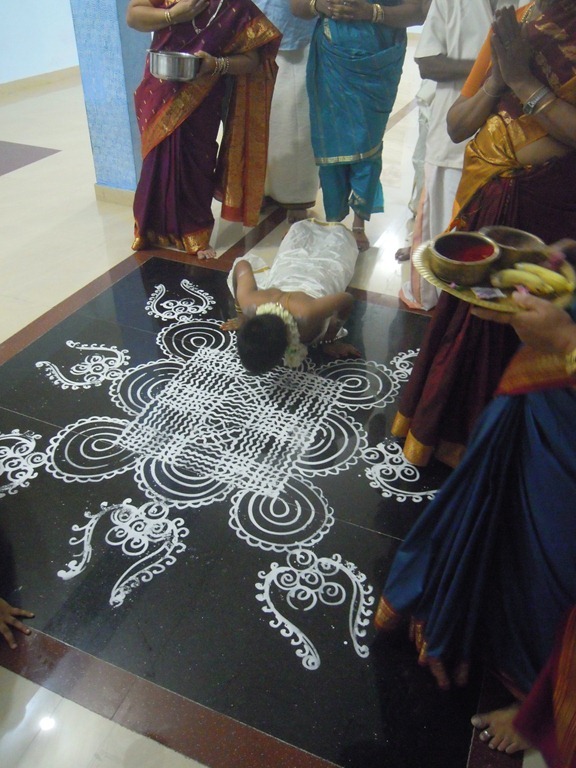 On the floor is an elaborate rice flour design – a kolam – laid onto the floor by women of the family. In the center is the sacrificial fire, the vedi. Ganesh, Advait, and the Brahmin Priest sit by the fire pit. 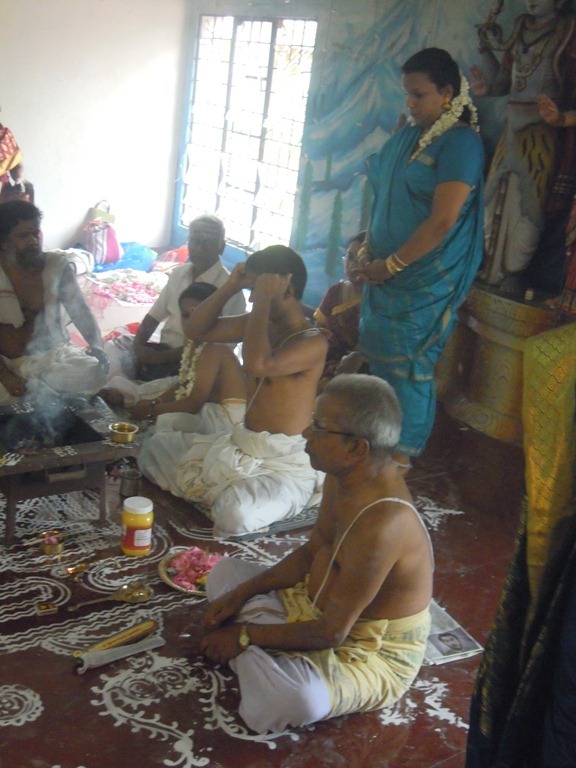 Ganesh’s father sits to the left. 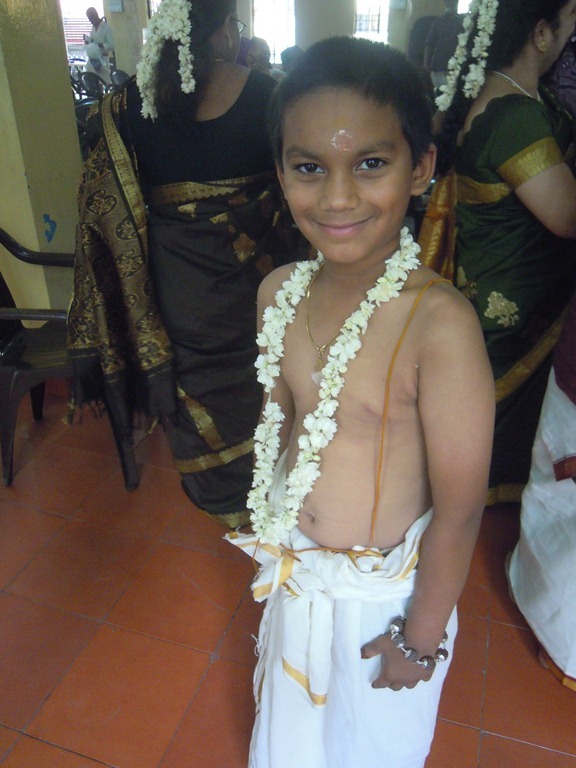 Dhanya stands behind them, with a Sriram, a male cousin of Advait. 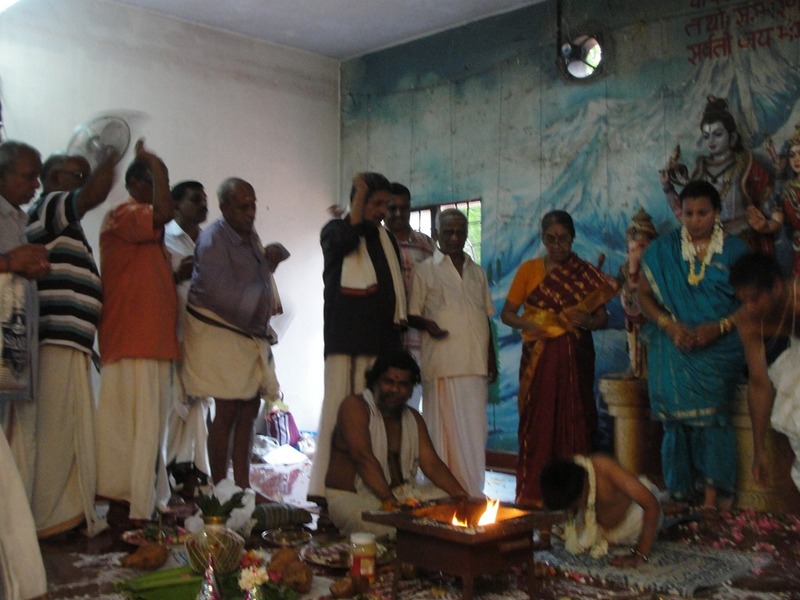 Already the Purna Kumbha (the “pot of fullness,” metal pot filled with water, etc., with a coconut sitting atop a crown of mango leaves, the temporary presiding god for this ceremony) has been set up, and pooja offered to it. 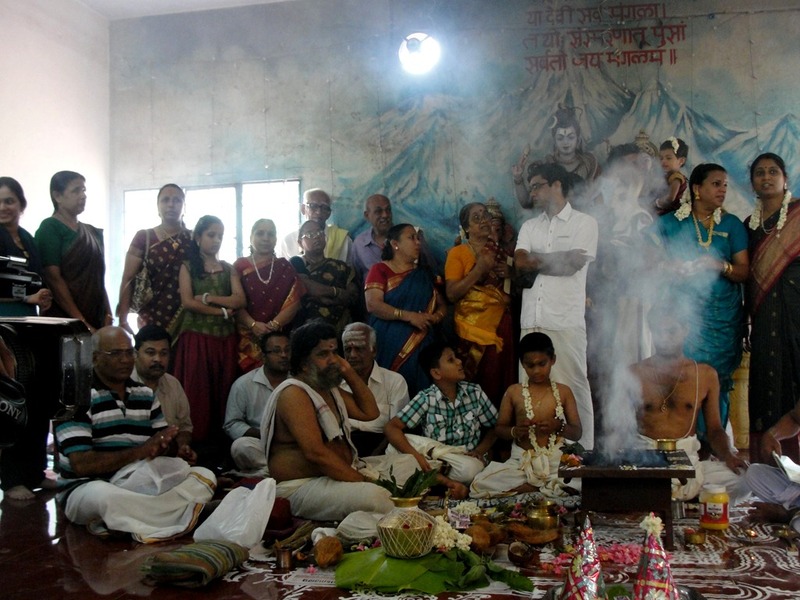 The Ganapati (Ganesha) Pooja is first, then is the Kalasha Pooja (Varuna Pooja). Varuna is the supreme keeper of law and cosmic order. It is from Varuna that the GayatrI mantra comes. Teaching this mantra to the boy, now twice born, late in the ceremony, is really its culmination. Mom stands behind her son. Some offerings involve her, some not. 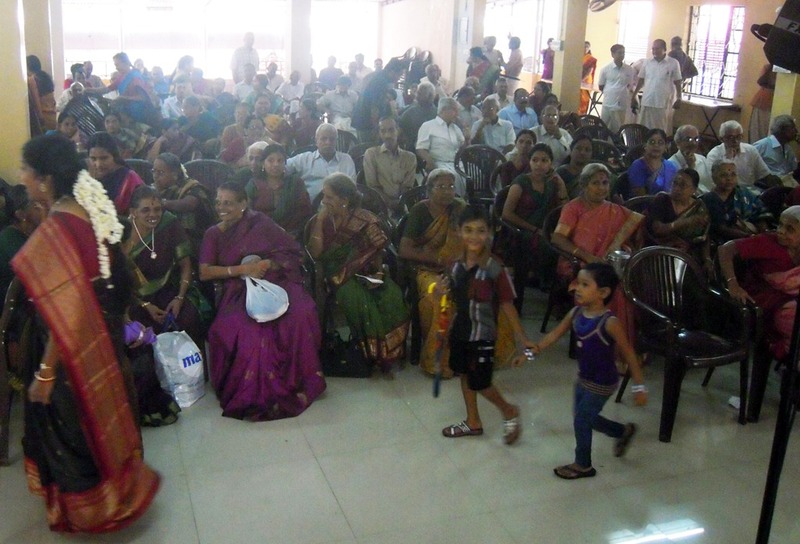 Grandfather Sadasivan is here during all this, near to Advait. Here he is pictured talking to Sriram. Advait is used to having his photo taken, and he mugs for the camera whenever if he sees it. 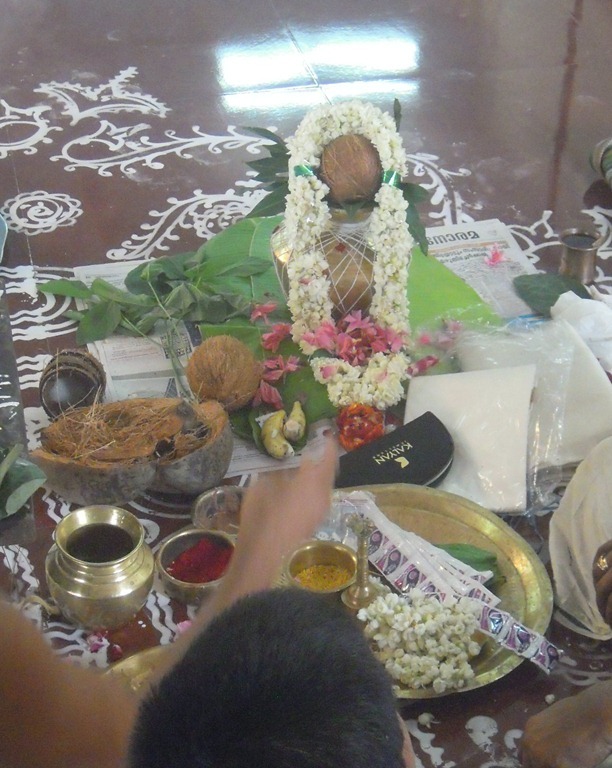 The pooja plate given to Ganesh by the priest. 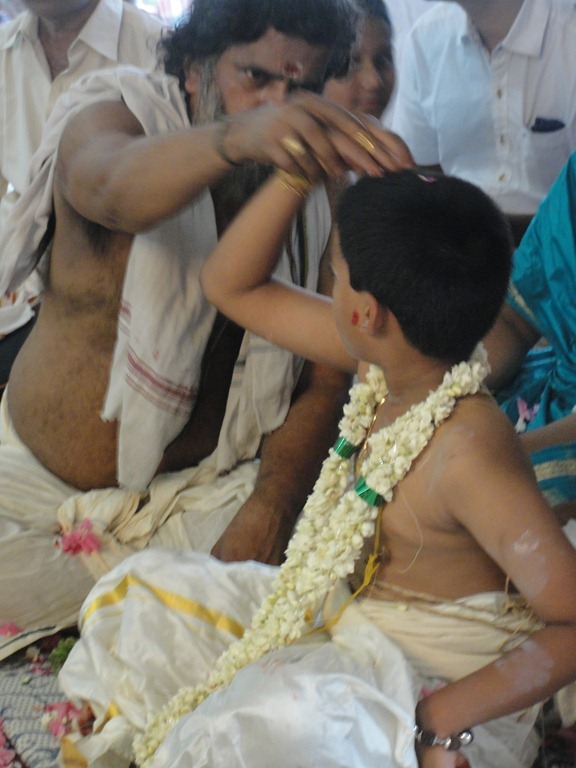 During this part of the ceremony, Ganesh has his hand on Advait’s head much of the time. 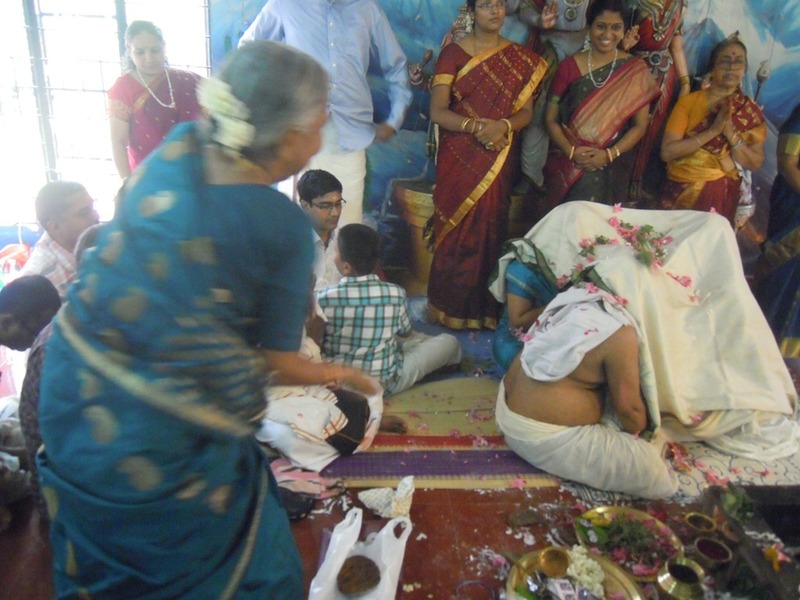 The ceremonial actions seem to come from the priest to Ganesh, who does them. 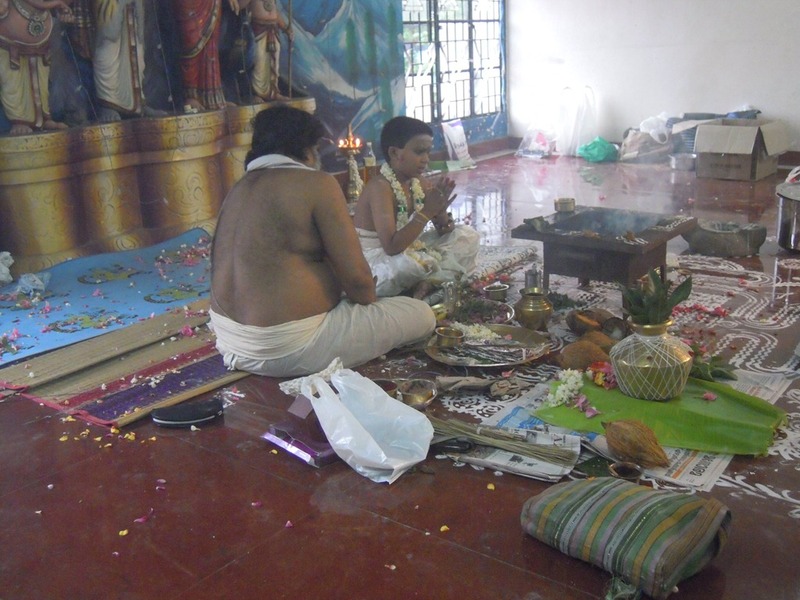 I think this may be the Sankalpam, where Advait make his resolution to follow the required practices of a Brahmin. 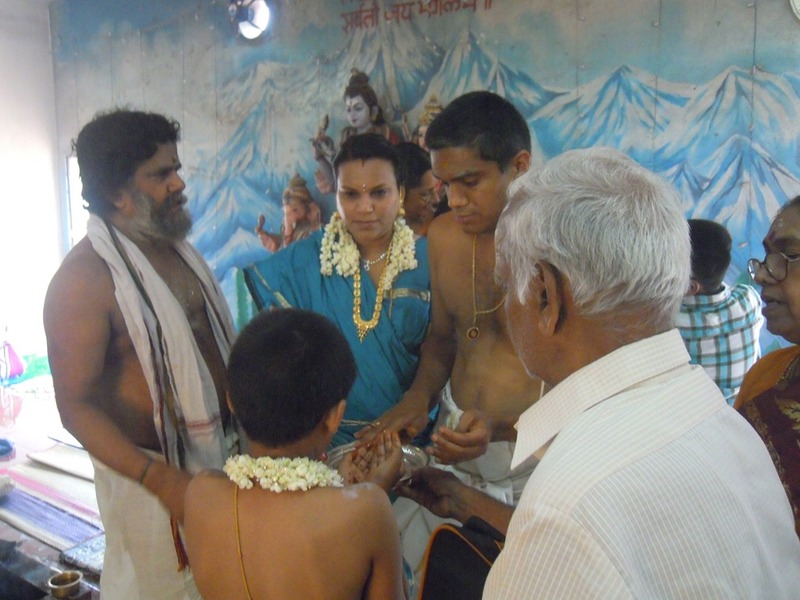 The priest gives Advait a piece of banana. 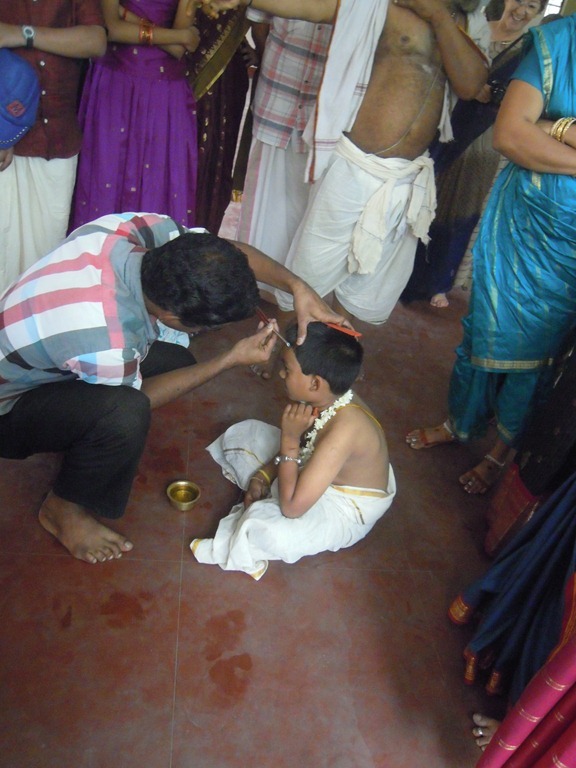 Ganesh places his hand on Advait’s head. I don’t know what this signifies, but it seems a protective gesture. Ganesh is wearing a ring make from sacred grass. 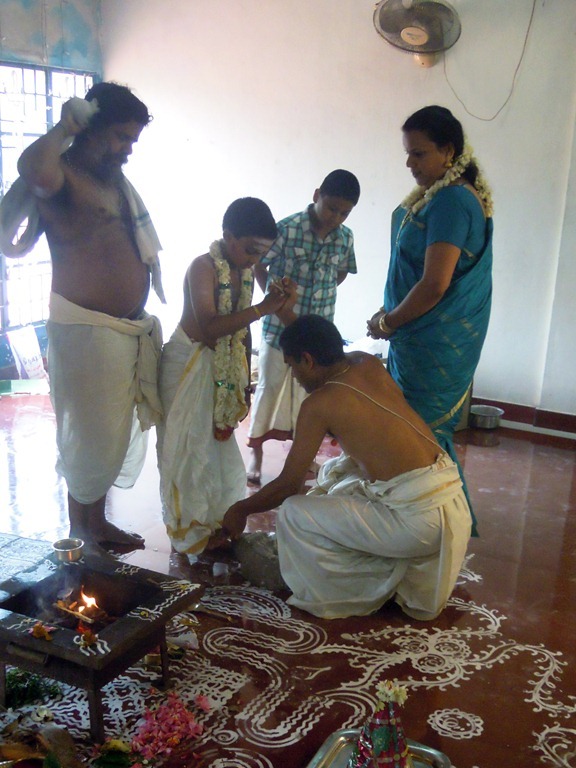 These are common in Hindu ceremonies. I think the grass is Dharbha (or Durva or Durba) grass, and its use dates back to Vedic times. The grass is believed to have a purifying effect on participants. Advait eats the piece of banana. 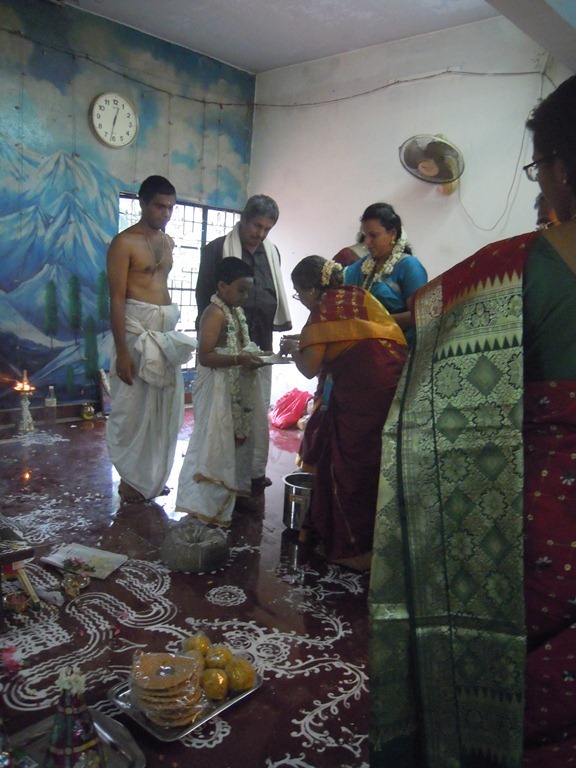 A flower pooja plate is passed to Dhanya, who adds a bit of holy water. The head-knocking gestures are familiar from Ganesha worship, where they are done to activate nadis (channels of spiritual energy). 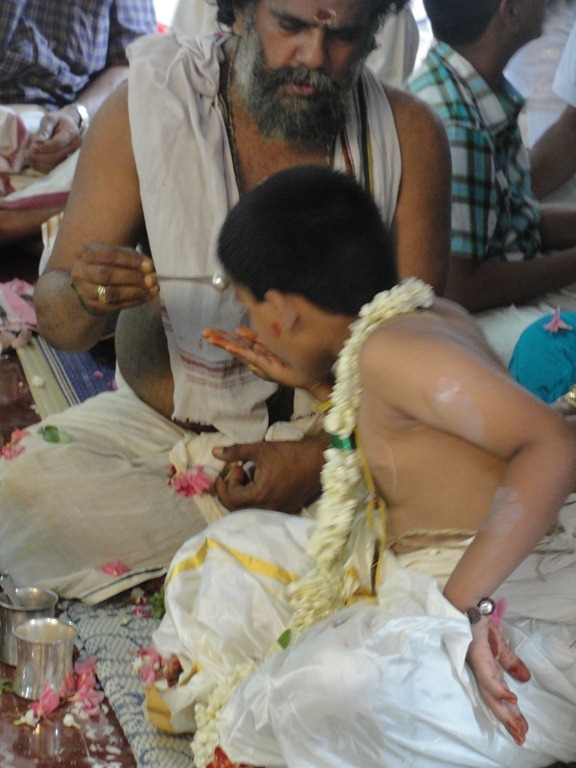 Flowers being offered to the Poorna Kumbha by Ganesh. 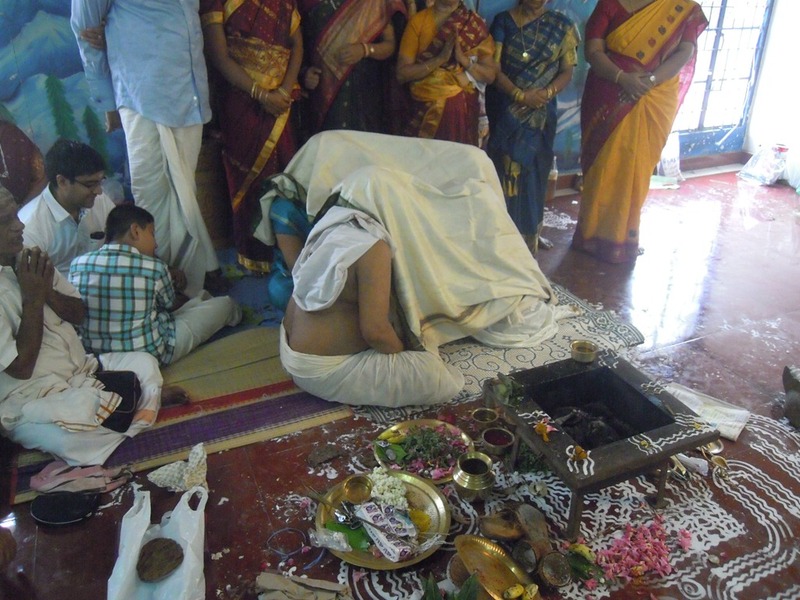 Here is a good view of the Poorna Kumbha, and items offered to it. 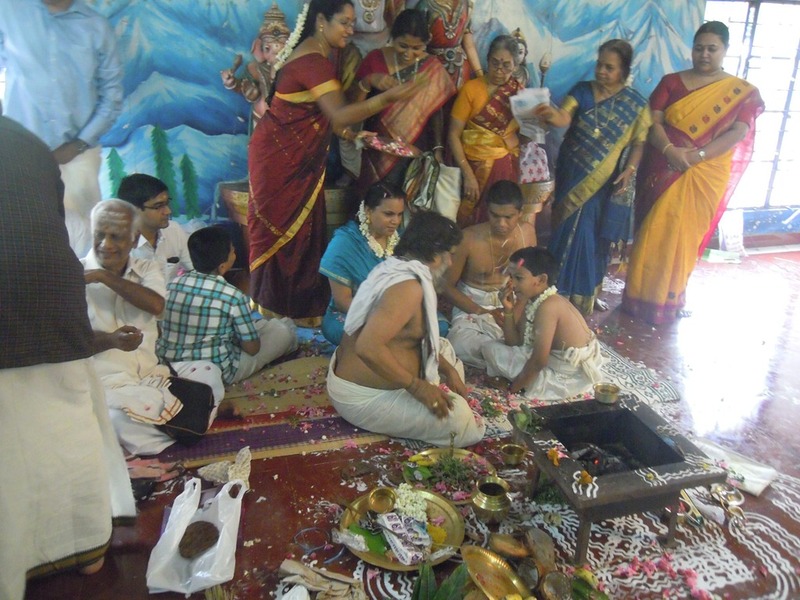 The priest empties the pooja plate full of flowers in front of the fire pit. 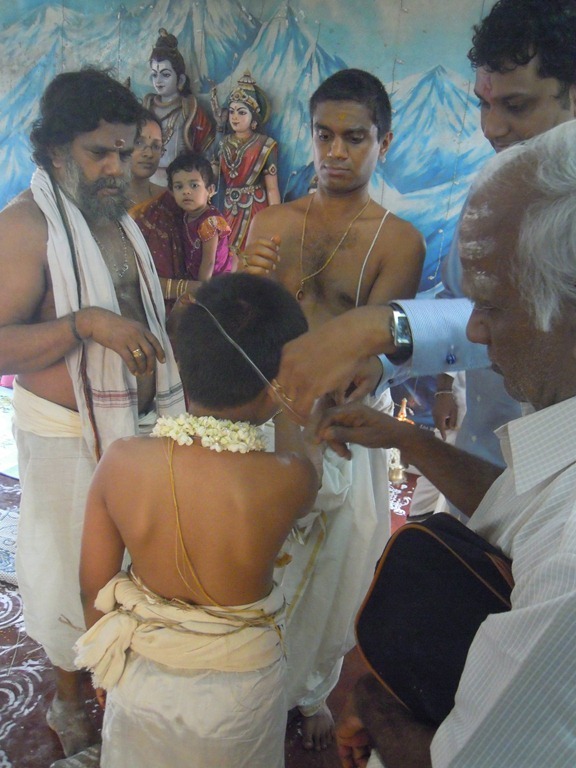 The hallmark of the Upanayana ceremony is the wearing of the Upavita, or Yajñopavītam, (Sacred Thread) on the body. 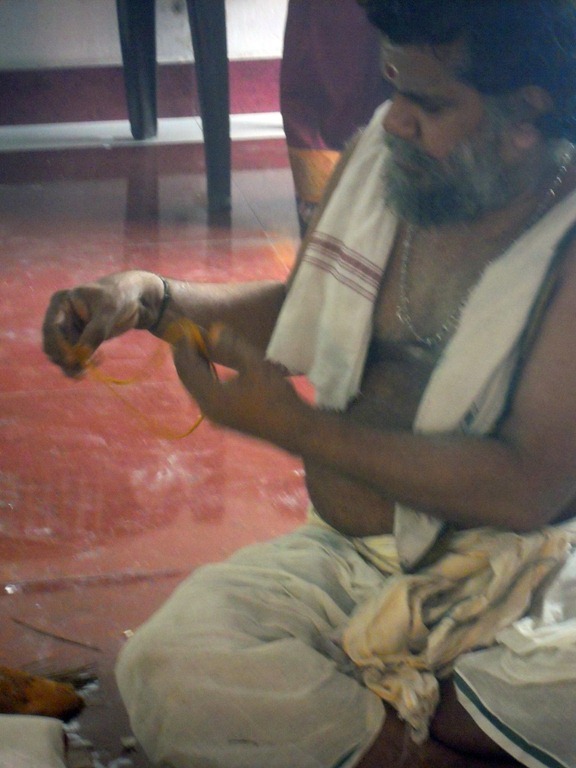 The thread is made of cotton and circular, being tied end-to-end (only one knot is used, called Brahma-granthi, which symbolizes Brahma, Vishnu and Siva); it is normally supported on the left shoulder and wrapped around the body, falling underneath the right arm. The length of the thread is generally 96 times the breadth of four fingers of a man, which is believed to be equal to his height. Each of the four fingers represents one of the four states that the soul of a man experiences: waking, dreaming, dreamless sleep and knowledge of the absolute. The knot in the middle represents the formless Brahman, the pure Being-Consciousness-Bliss which pervades all. 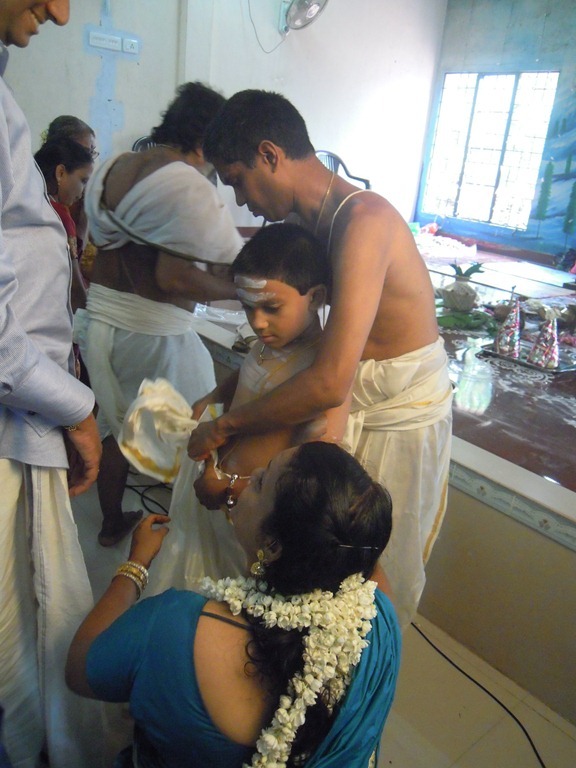 The sacred thread is supposed to be worn for the rest of one’s life after the ceremony has been performed. 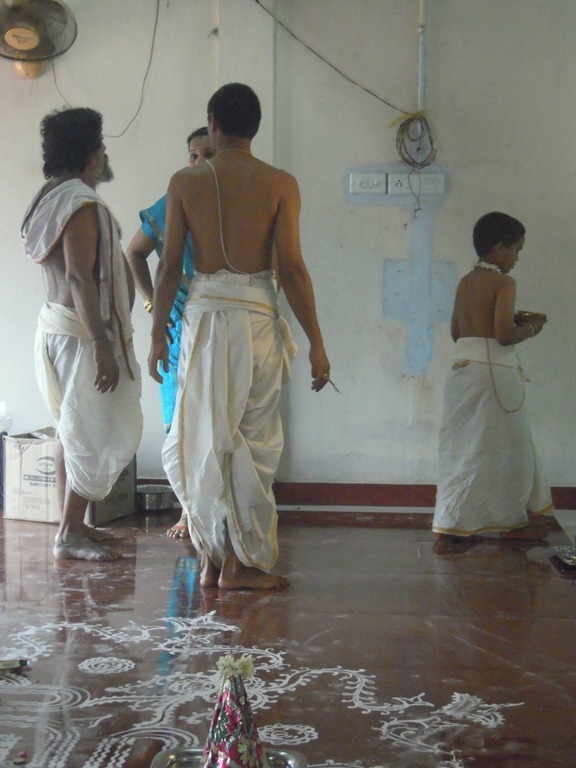 A new thread is worn and the old thread discarded every year; the change-over ceremony is held on a specific date calculated as per the Hindu lunar calendar. 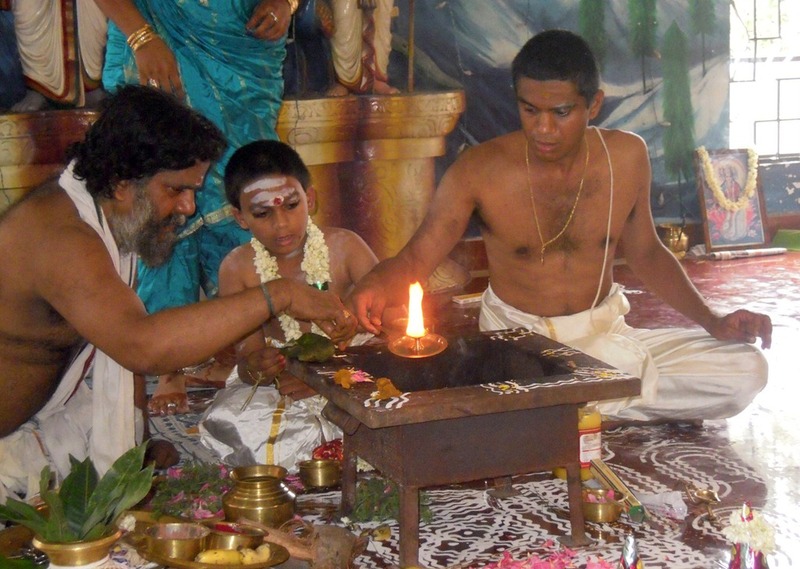 Among Brahmins, this date varies depending on which of four Vedic Shakhas one belongs to. Goddess Savitri (Goddess of deed). The sacred Yajñopavītam reminds a Brahmachari to lead a regulated life with purity in his thought, word and deed. the debt to the sages/scholars (rishi rin), i.e. those who discovered knowledge, both spiritual and secular, over the ages, which now enriches the wearer’s life. Ganesh and his family also took the interpretation that 3 strands represent three guna-s and the wearer is the one who transcends them, as stated in Ribhu Gita 3:35. 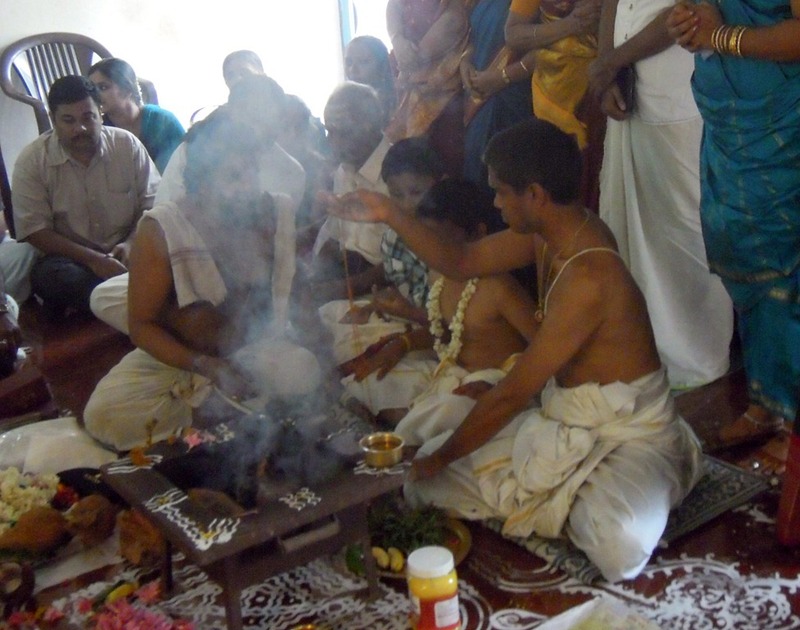 The meditation that “I am the Supreme Brahman.” The power that wears the three strands of the three guna-s (qualities), which constitute the world, is the offering of the sacred thread to the linga of the Supreme Self. 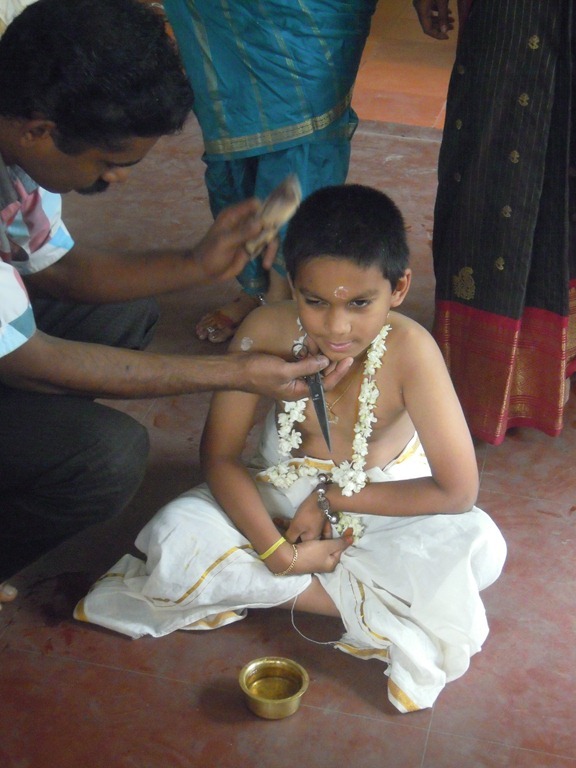 Yajñopavītam Dhaaranam – the wearing of sacred thread by the young boy. 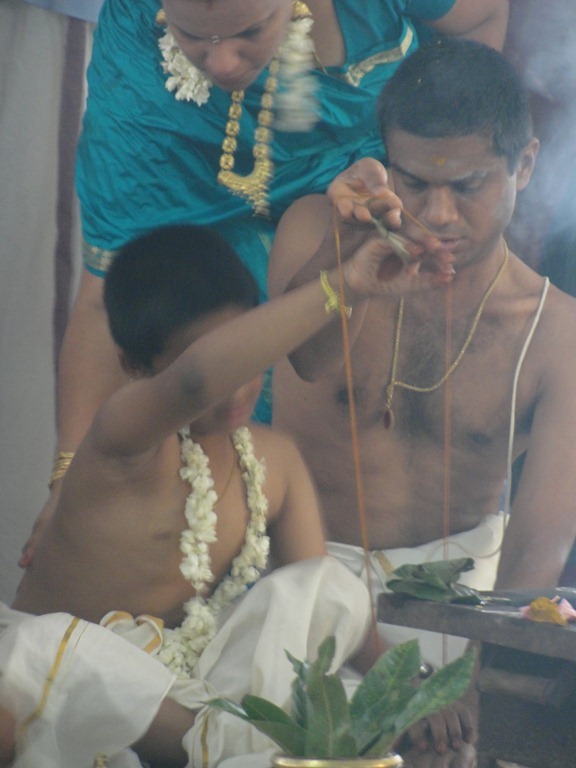 The priest takes the Yajñopavītam, and spreads it out into a loop. The thread is colored with turmeric. 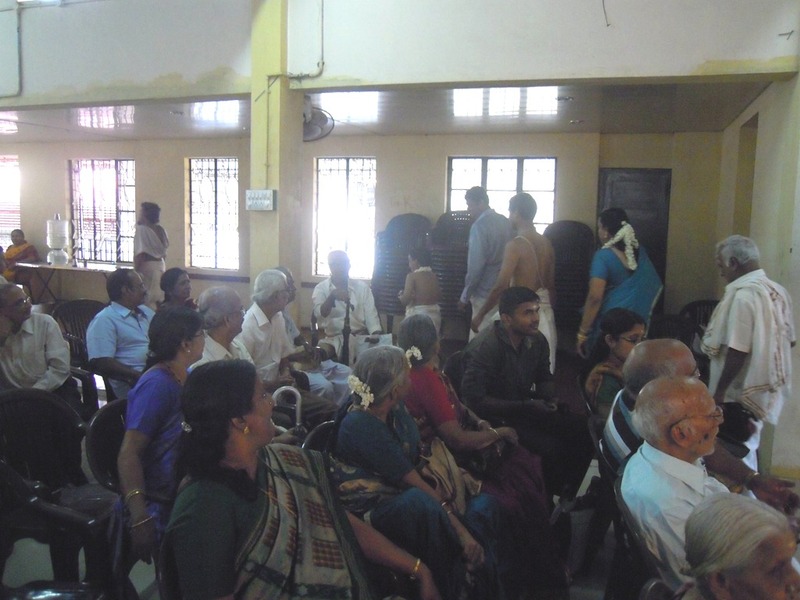 Hari, Advait’s maternal uncle, “mama” in Tamil, stands behind in a blue shirt. He will play several important parts in this ceremony. 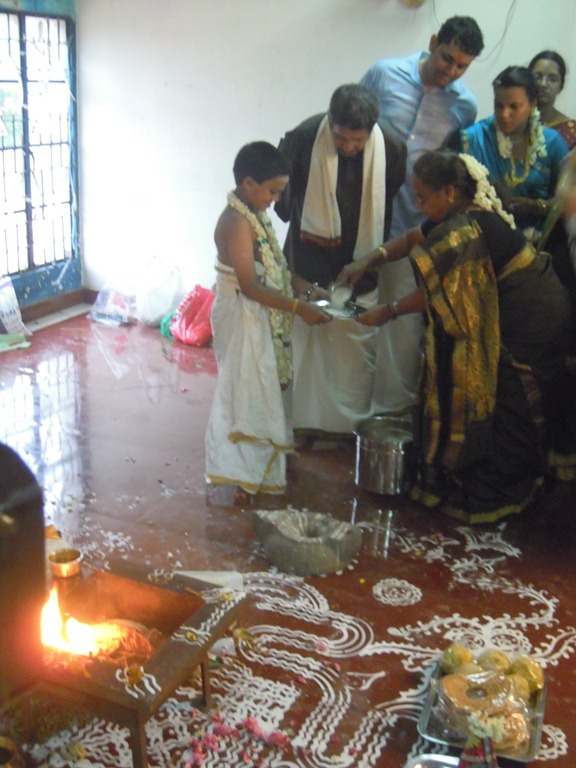 The relatives are gathering behind the boy at this point in the ritual. 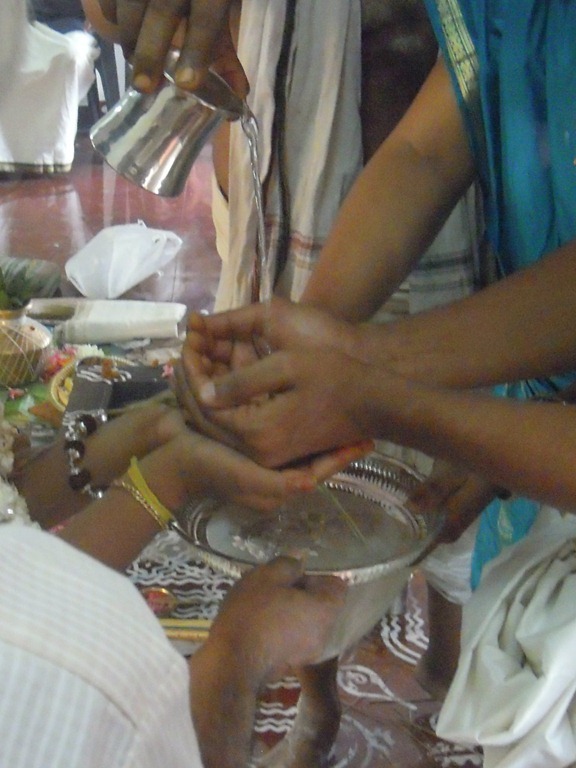 The priest puts the Yajñopavītam on a plate. 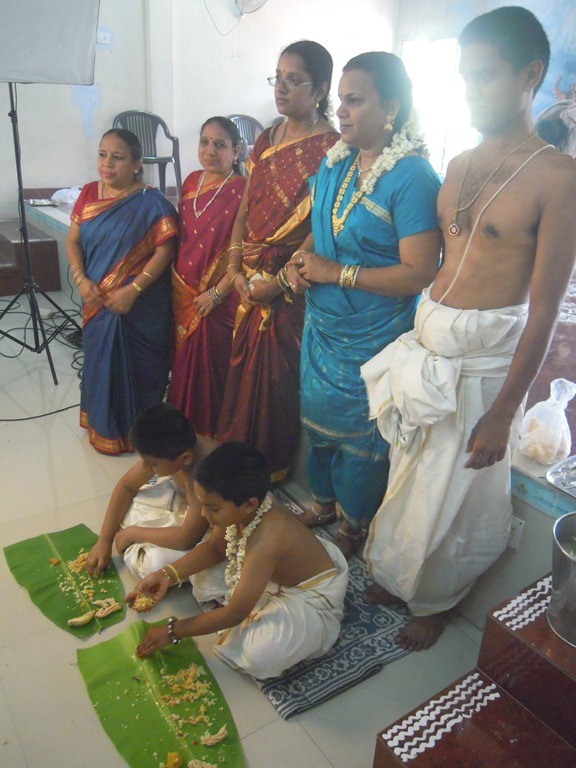 Ganesh’s elder brother, Jayaram, has joined the group for this, upper left. His son, Sriram, in the blue and white plaid shirt, stays near Advait for most of the ceremony today. 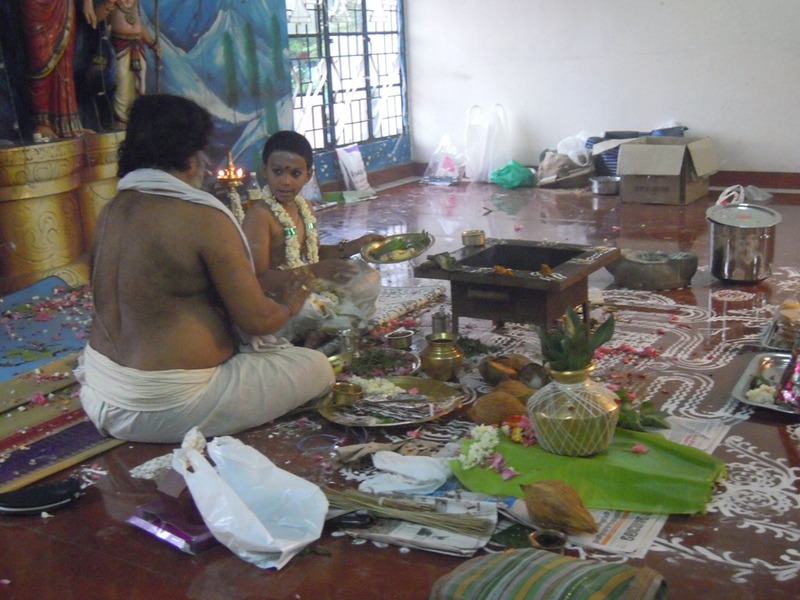 The priest has added more items to the plate with the Yajñopavītam, and is passing it to the paternal grandfather, Sadasivan, for a blessing. 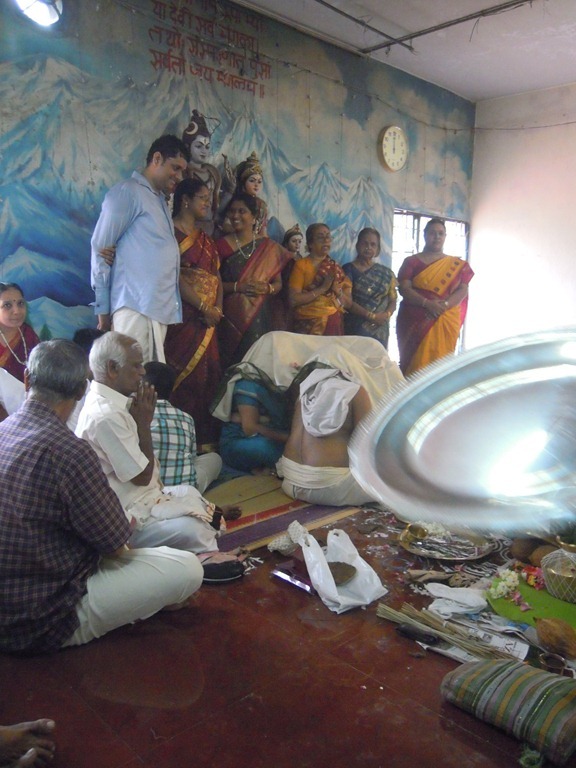 Now the plate with the sacred thread is being offered for other blessings. 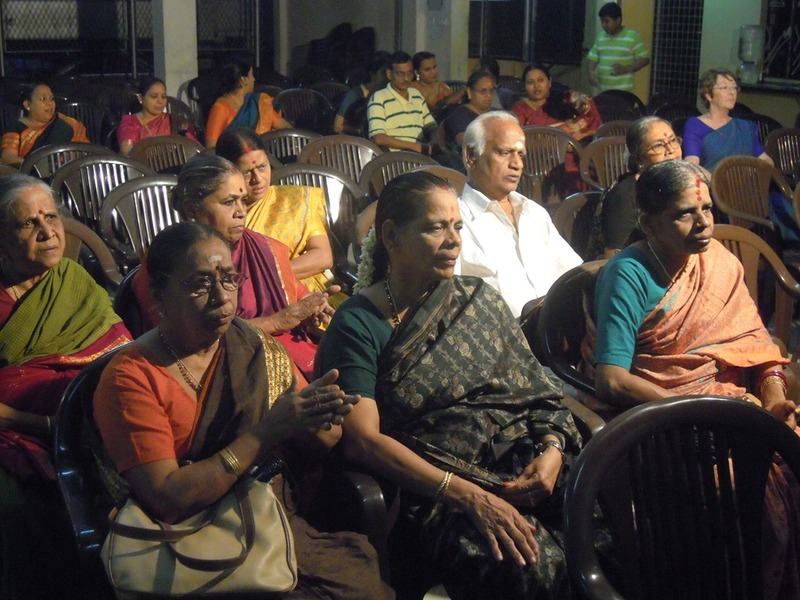 Next are the maternal and paternal grandmothers. Now all of the family seems to be on stage. 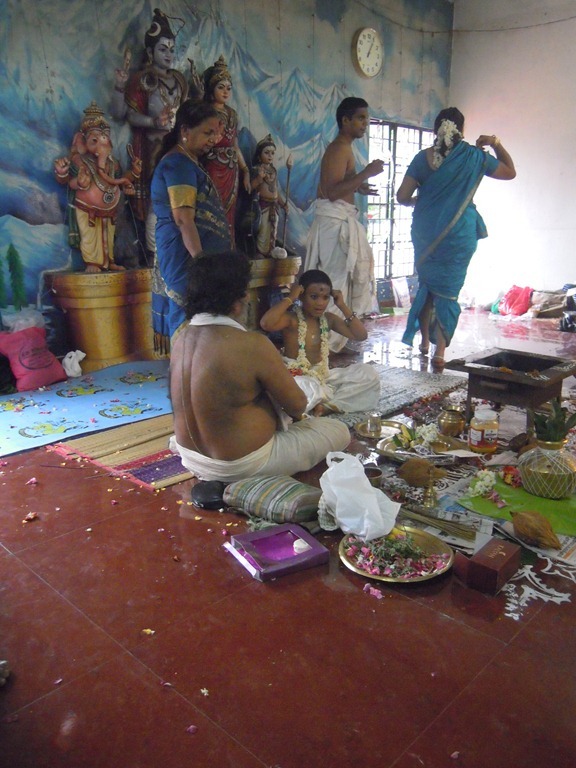 Ganesh has the plate with the sacred thread, and Dhanya is purifying it with holy water. and holds it up in front of Advait. 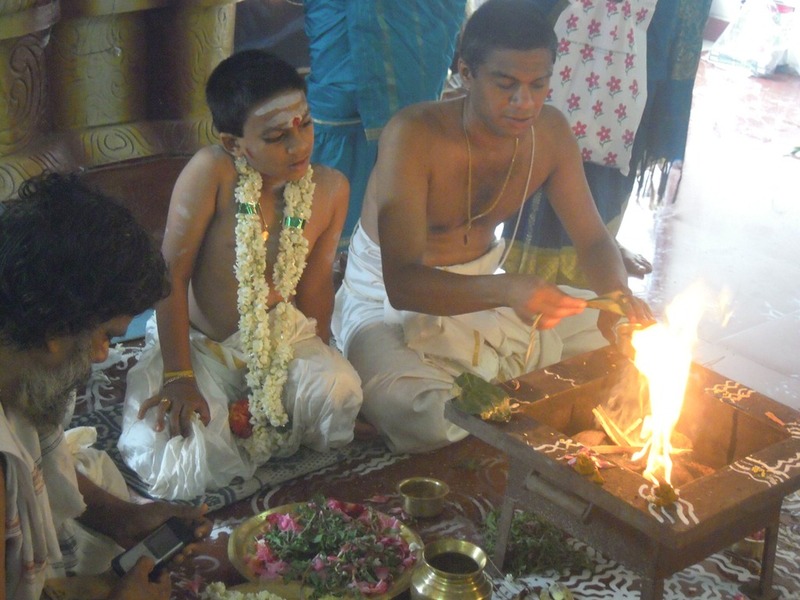 Advait wears his thread, and all pranam to the sacred fire. Here is a happy boy, Advait. The family stands behind the boy. Ganesh and Advait rise, ready to move on to the next step. 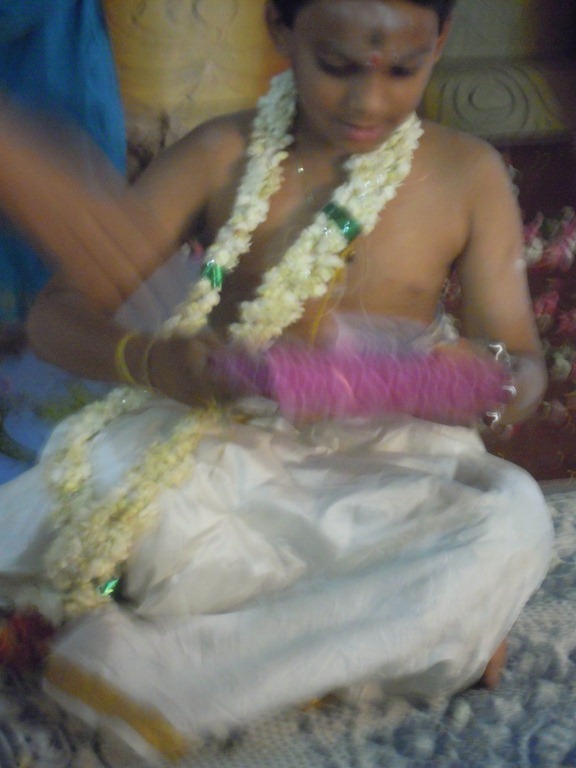 Here is Advait wearing his Yajñopavītam. 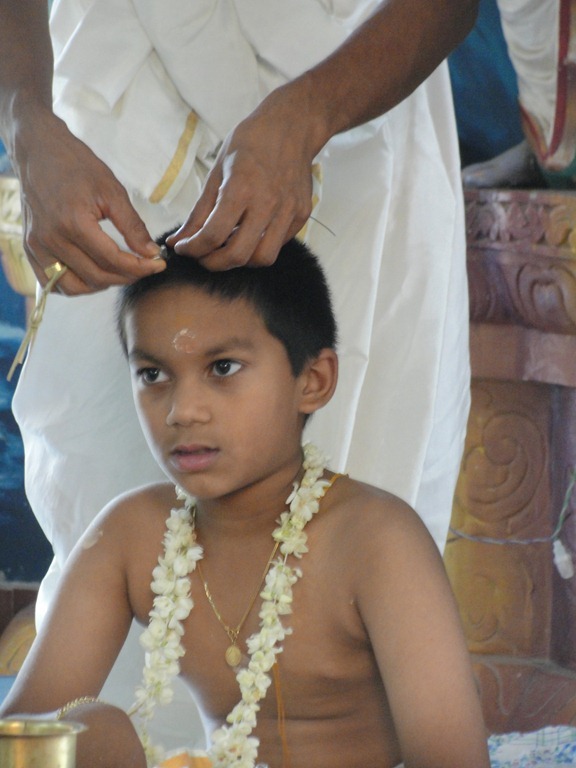 Placing dharbha on the boy’s head and clip out parts of it after reciting some mantra. Wear new clothes, worship in the temple below. 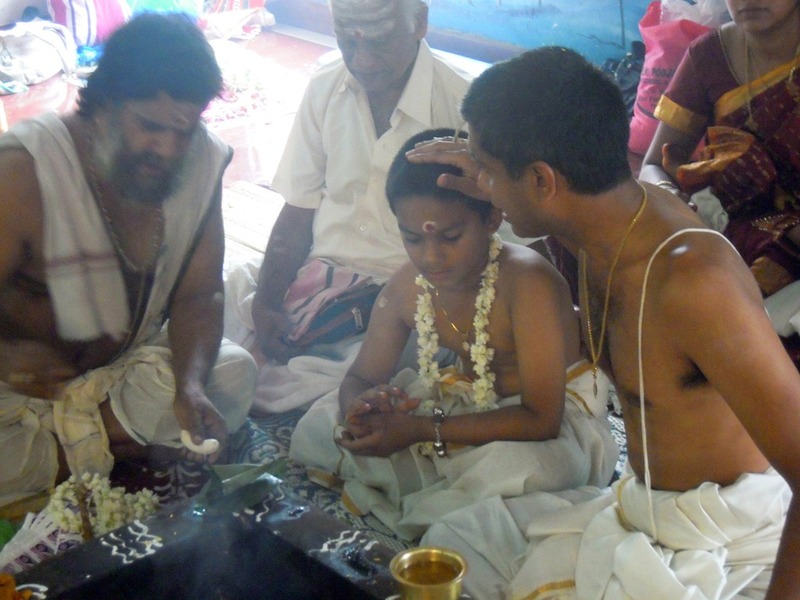 Paridanam – The father entrusts the boy to the care and protection of various deities. 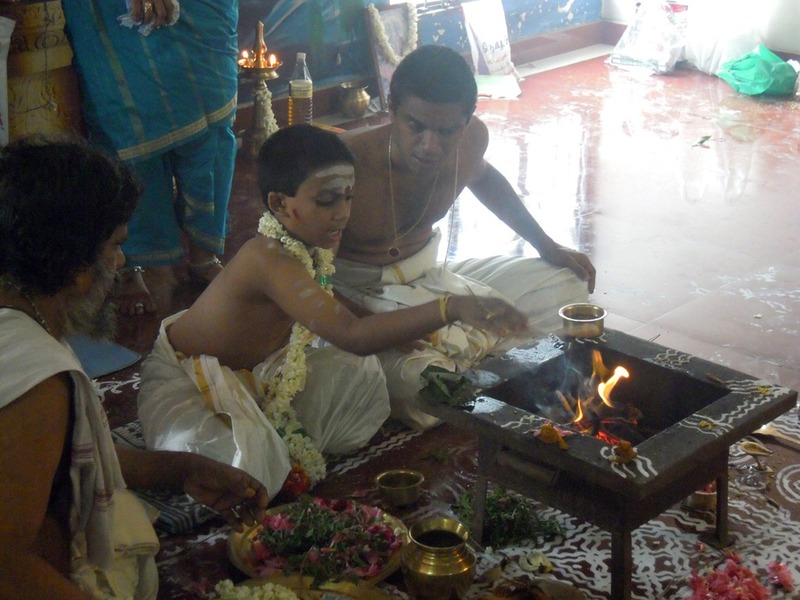 Upanayana Homam – Homa done by the boy, now a Brahmachari. 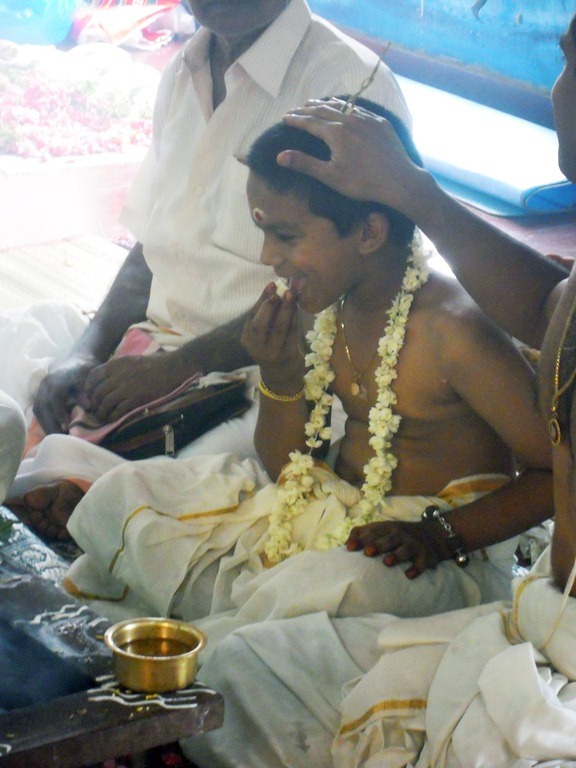 The boy is fed along with other boys who have already been inducted into brahmacharya (an even number of boys will eat, usually 2, 4 or 6). This is to teach the new boy about the preliminaries involved before taking food and the concluding actions that are to be done immediately on finishing food. The idea is that these things discipline people. It is not just taking food as soon as it is served, as soon as we see it, just like animals consuming. We first offer our gratitude to whatever invisible thing that was responsible for us to get the food. Food prepared should be without salt and chilies. 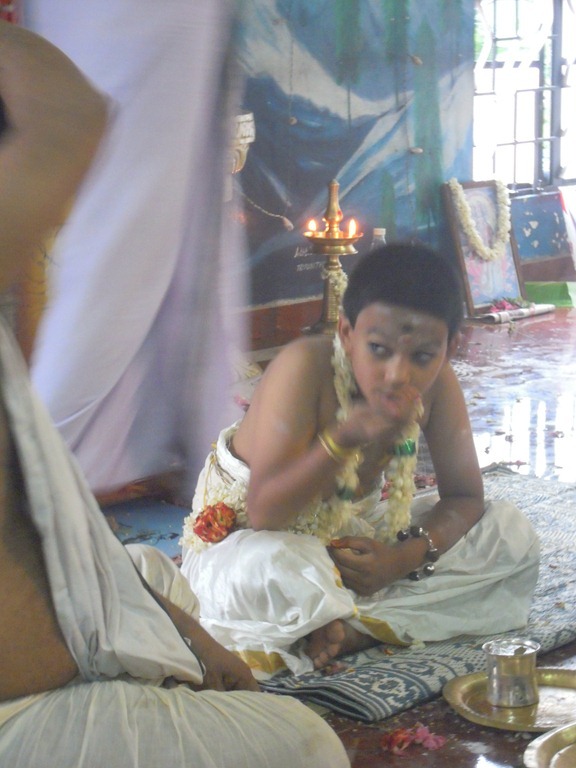 So, when the boy , after Upanayanam, at age 7, has to leave for Gurukula, the mother, with all love and affection, feeds him for one last time. She will also have food along with him, so he remembers her all the time and does not make a mistake. Leaf plates are set out for the two boys. 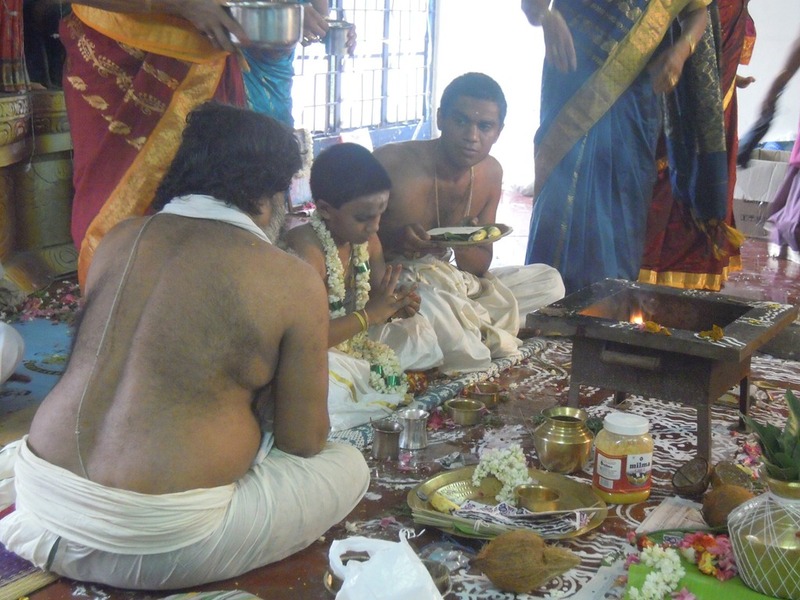 Sriram will participate in the ritual meal with Advait. Women relatives serve different dishes. 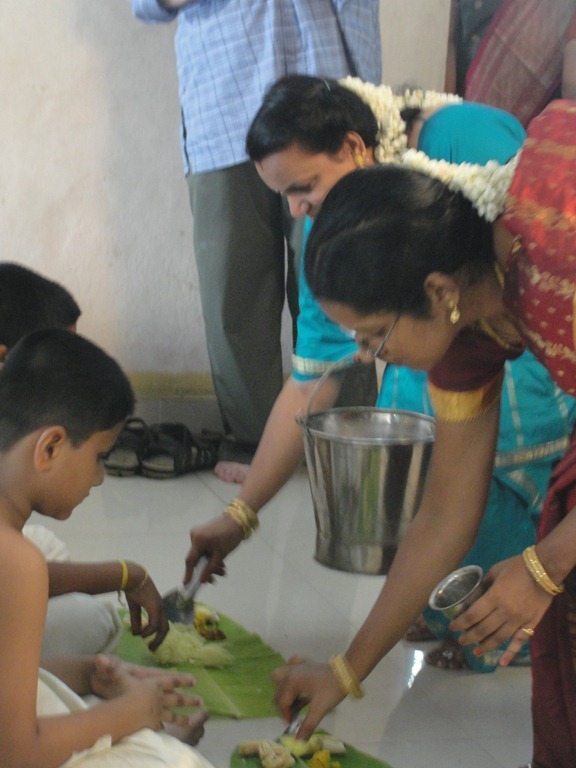 The most important dishes, like rice, below, are served by the Advait’s mother, Dhanya. Ganesh gets into the act, too. Here he gives a spoonful of water to each boy, holy water, I think. They drink it, sipping from their right hands. 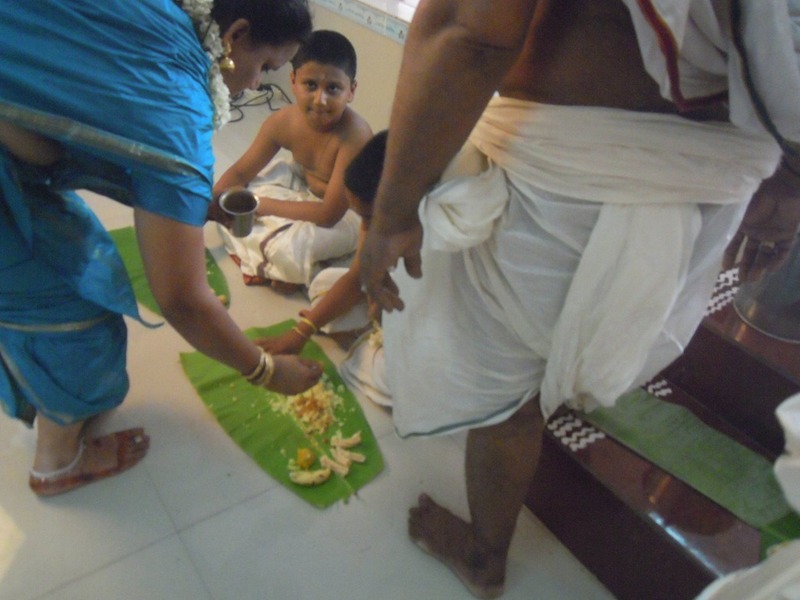 Dhanya serves sambar, and another auntie gives more food. 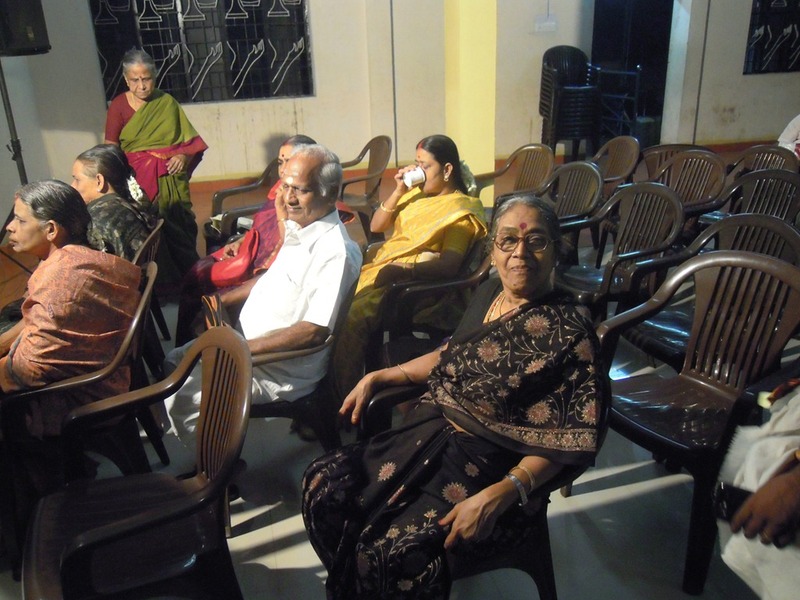 The relatives who served the food stand behind the boys. 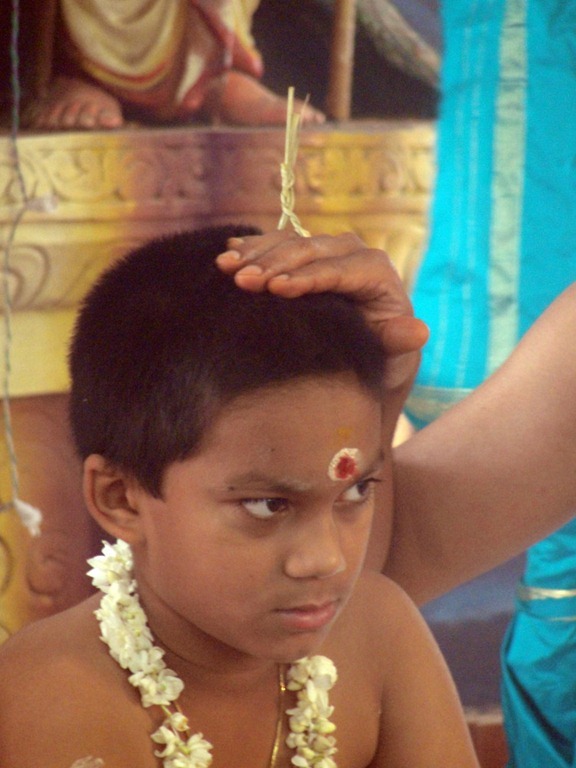 Placing Dharbha grass on the boy’s head, chanting mantra. Ganesh now places the sacred Dharbha grass on the Advait’s head. I am not sure why this is done. Does anyone know, and know of the name of this act? A mantra is being chanted (what one?). Priest does (I think) a purification with a sheath of Dharbha grass. It looks like Ganesh is holding a silver ring on top of Advait’s head. 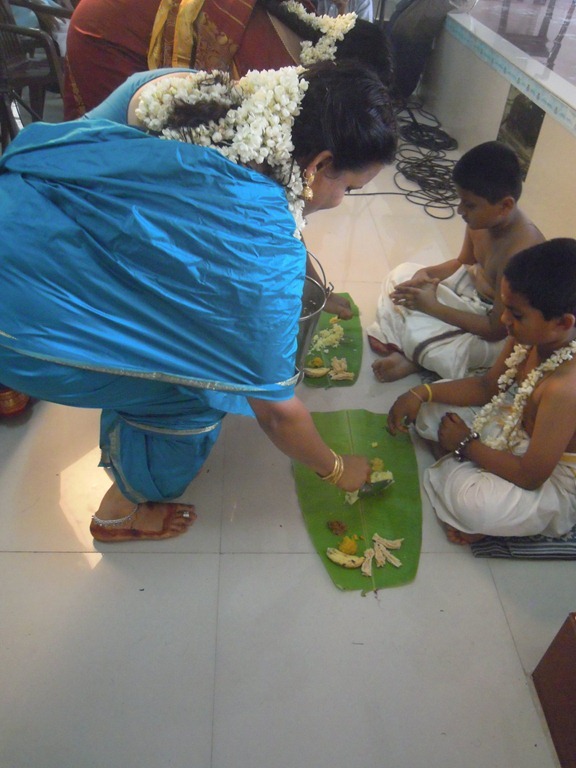 Dhanya gives something on a banana leaf plate. 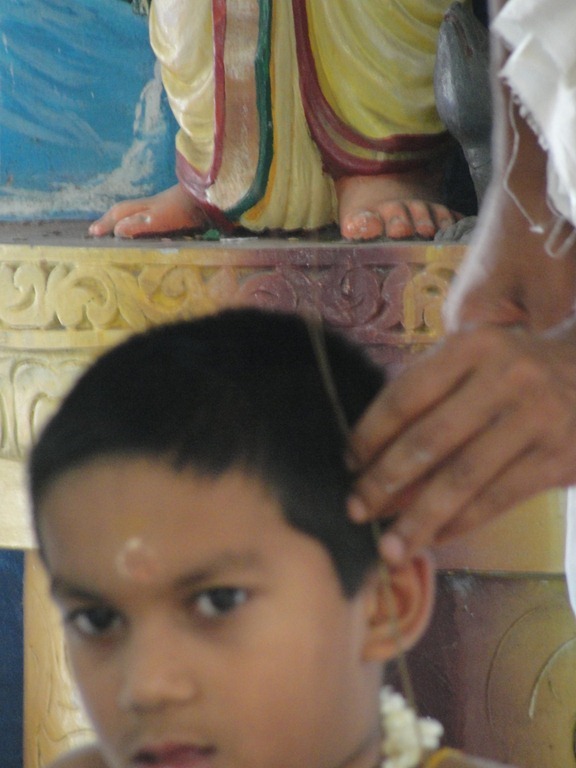 Ganesh holds Dharbha grass to the left side of Advait’s head. 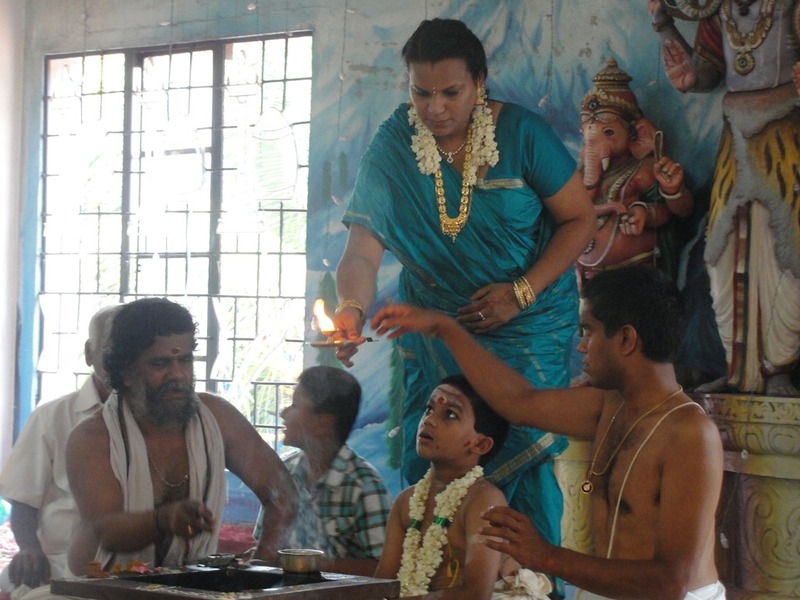 Ganesh receives a cup of sacred water from Dhanya, then gives it to Advait. 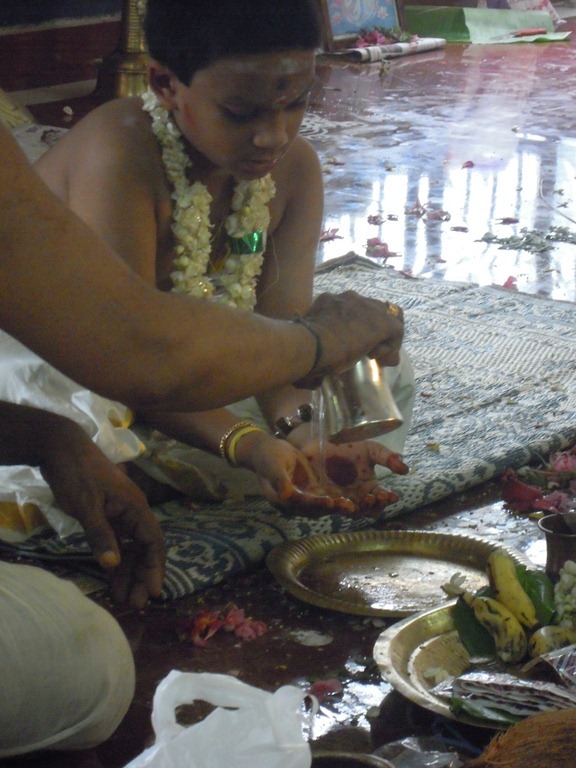 Advait walks from the stage, holding the cup of sacred water. He walks to the other side of the hall and sits, still holding the cup of water. He is ready for his special hair cut. The water is used, I think, to lubricate the haircut. The boy’s hair is cut on the four sides of the cardinal directions. The proud mother and father (and western “auntie”) look on. Advait gives presents to the barber: money and new clothes. 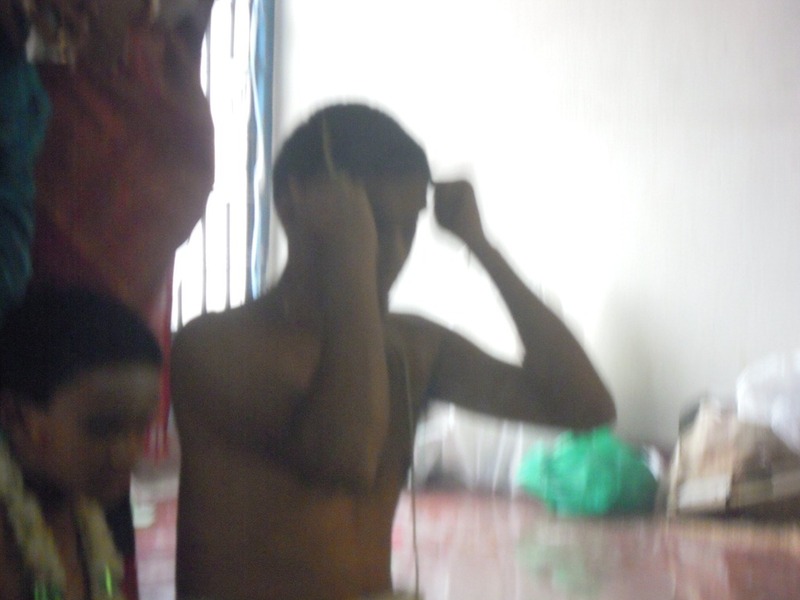 Advait then disappears for a bath. In India it is usual to have a bath immediately after a haircut, since usually a barber is an untouchable, and one should wash after being touched by an untouchable. 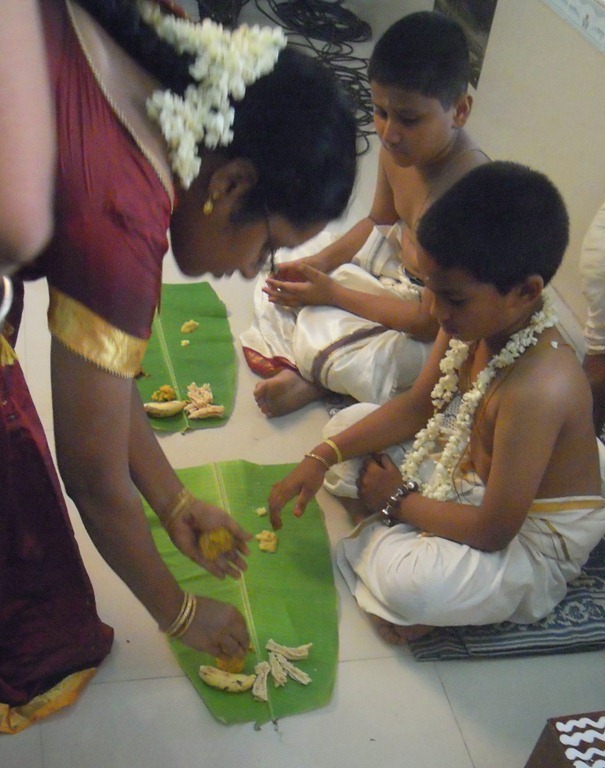 This tradition is deep enough that it is a standard part of the Upanayanam ceremony. His mama (maternal uncle) dresses him, one of several roles played today by this uncle. 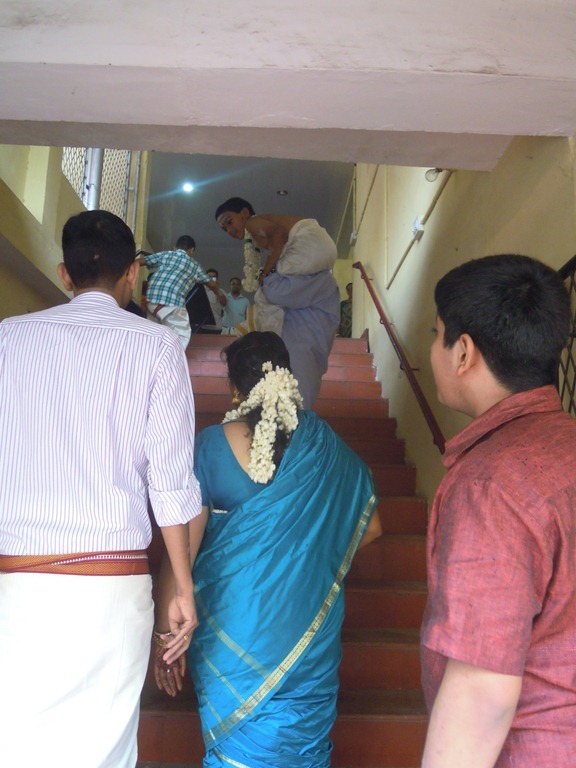 Ganesh and Dhanya take care of final details. 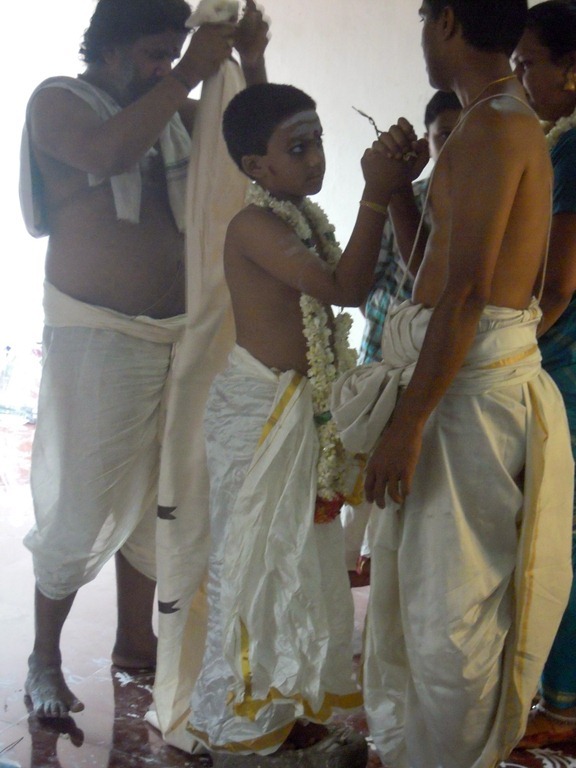 Uncle then applies vibhuti stripes to Advait, a part of the traditional dress. 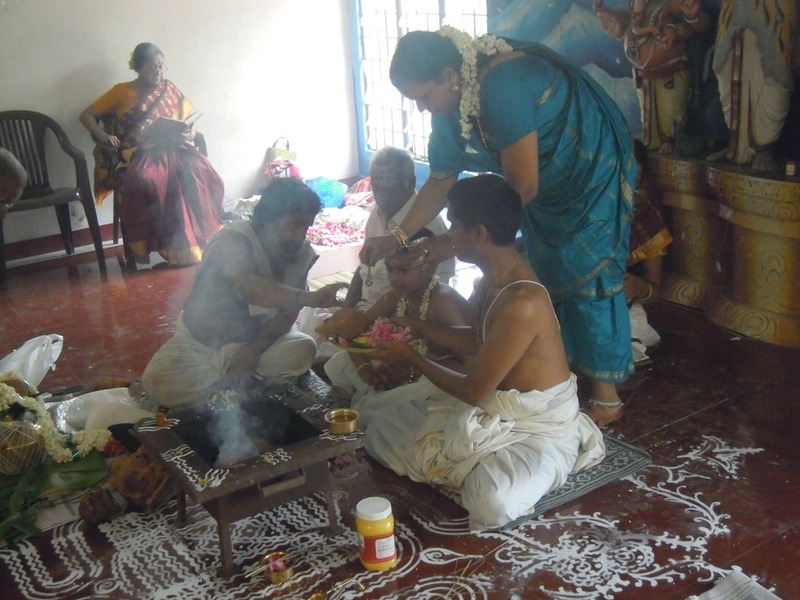 …which is the application of red kumkum and black kohl by Grandmother. Finally Uncle puts a flower mala around Advait’s neck. 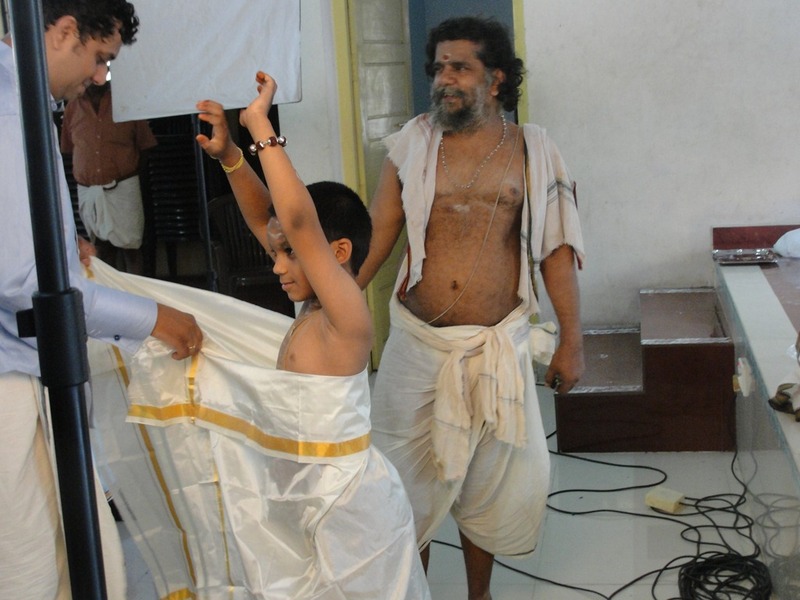 Advait stands in his new dress, with a smiling father standing behind him. A procession then starts, with Advait leading Uncle, Father, and Mother. We climb down a flight of stairs. 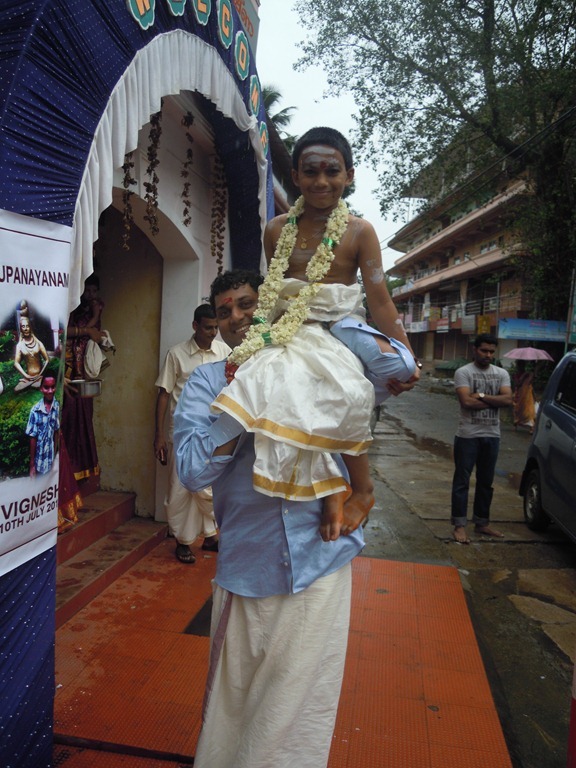 Advait is being carried by Mama. 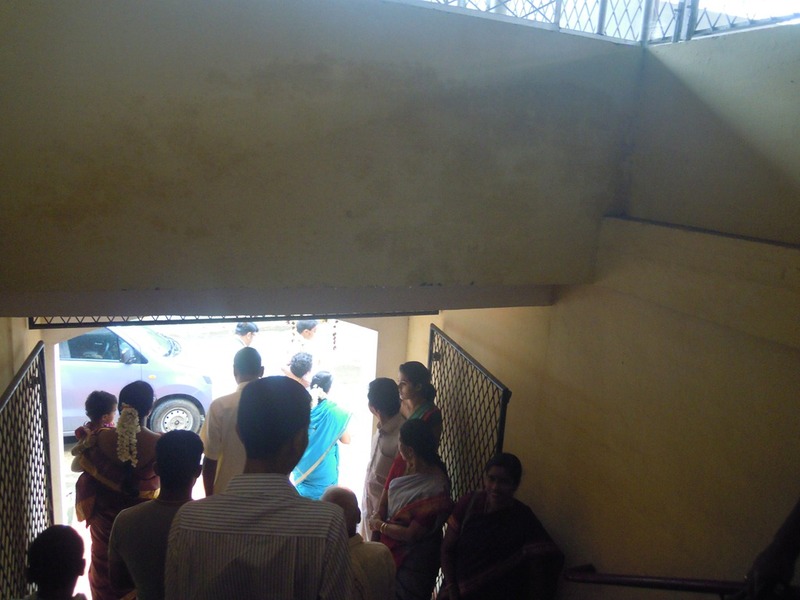 They enter the temple, with other close family members, below the hall. 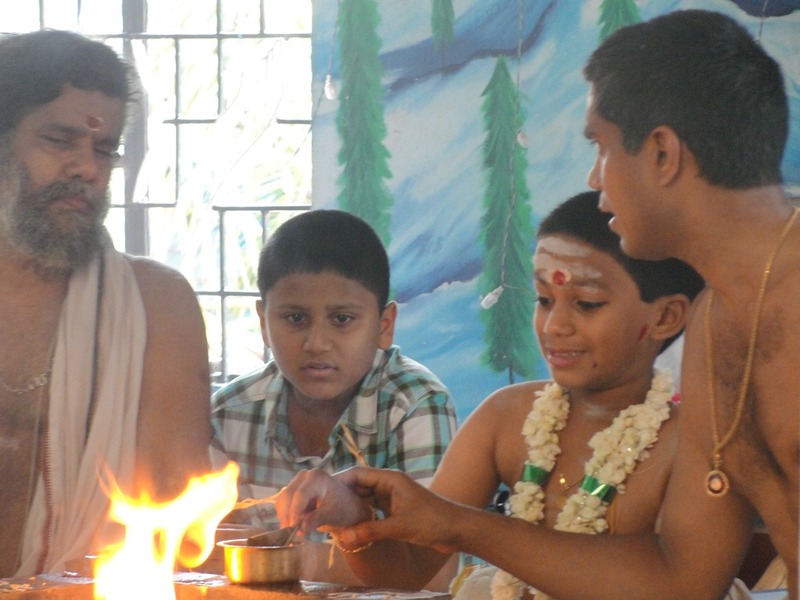 The priest performs a pooja. 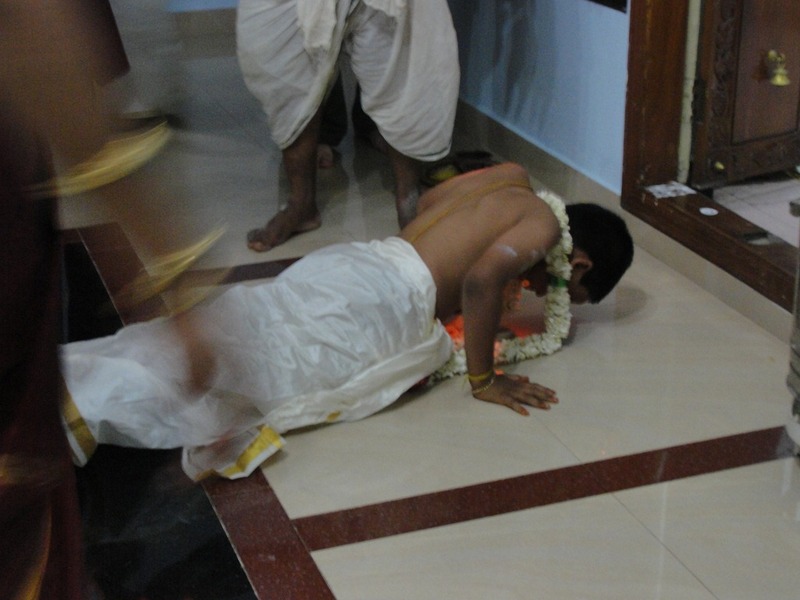 Advait does a full-body pranam to the god of the temple. 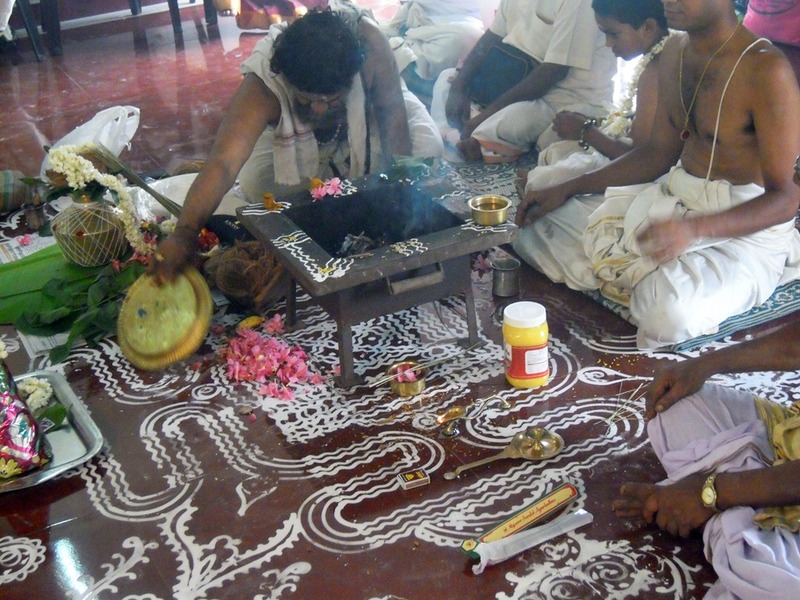 Notice the elaborate rice-flour kolam on the floor. 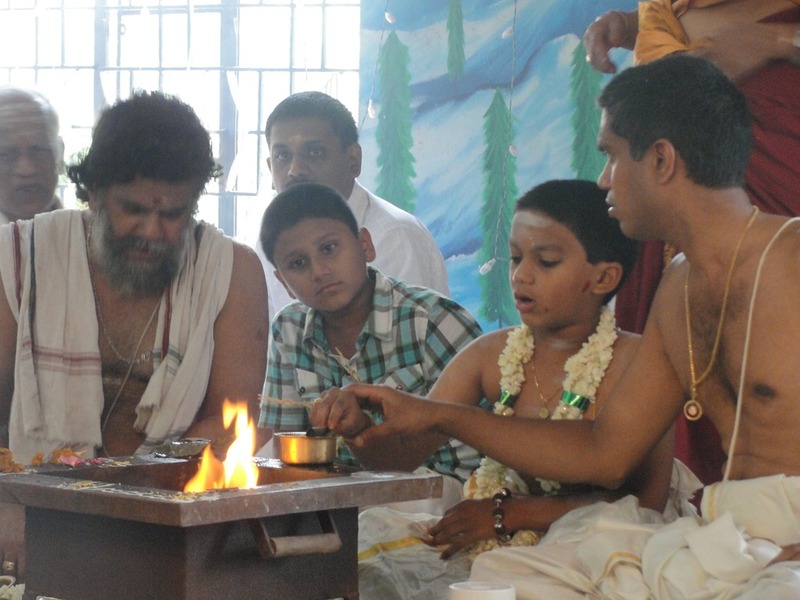 Advait takes the light from the camphor flame and blesses himself with it. Ganesh then also does a full-body pranam. And Advait offers one more, too. 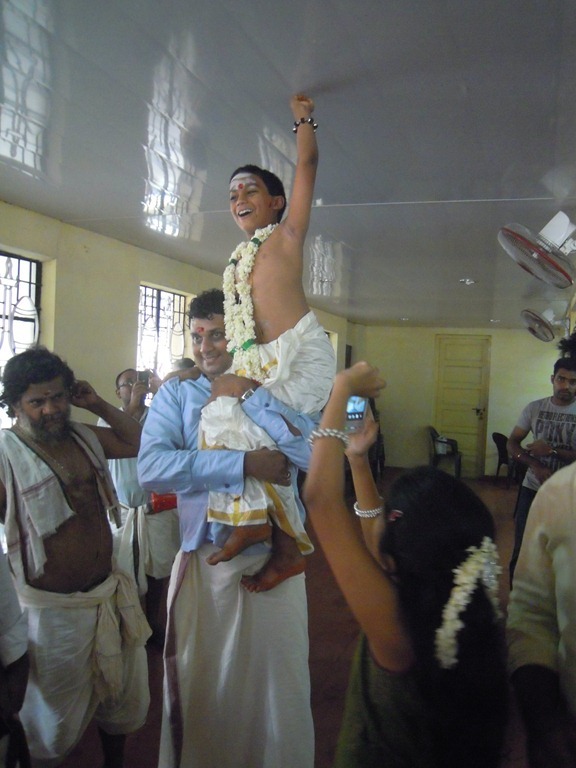 Then Advait is carried by Uncle back out of the temple. Advait can touch the ceiling. Triumphant! Samidh is sacred wood. 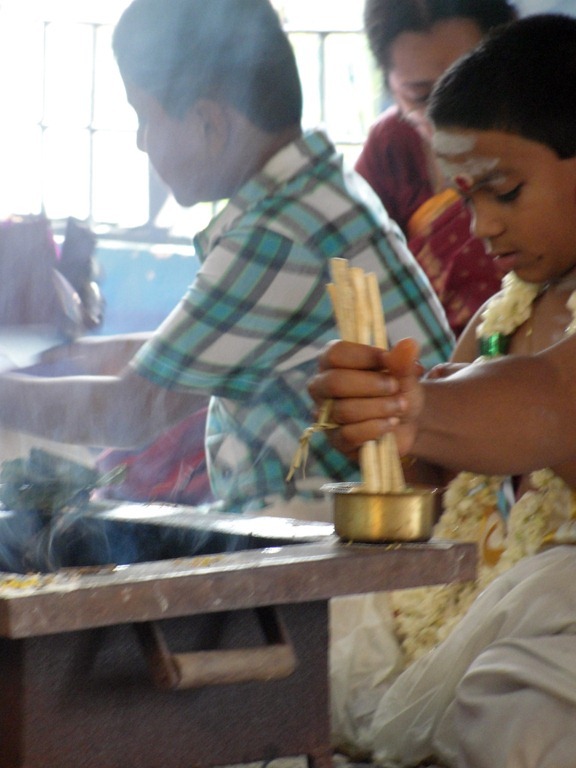 Adhanam means “placing.” Now the Advait, the new brahmachari, places sticks of sacred wood into the holy fire. Ganesh dips their ends into ghee, so they will easily ignite. 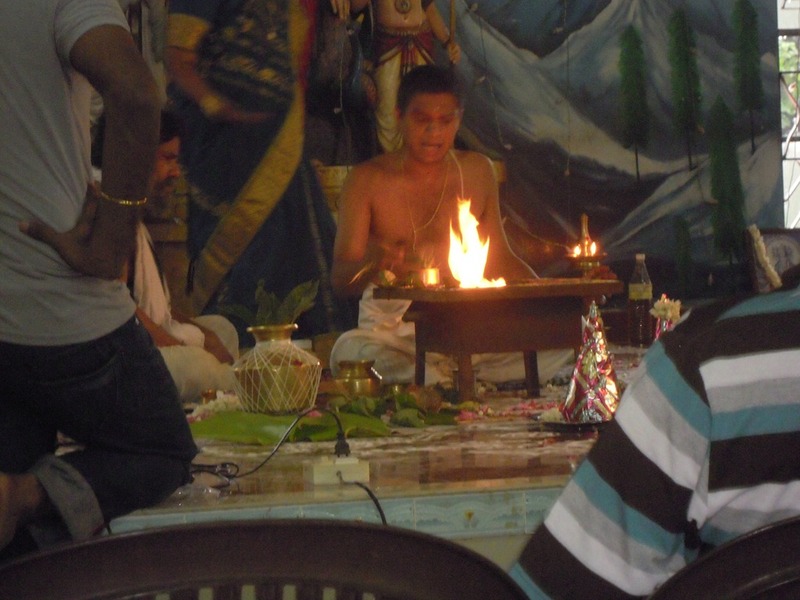 Ganesh is feeding the fire, so it is ready. 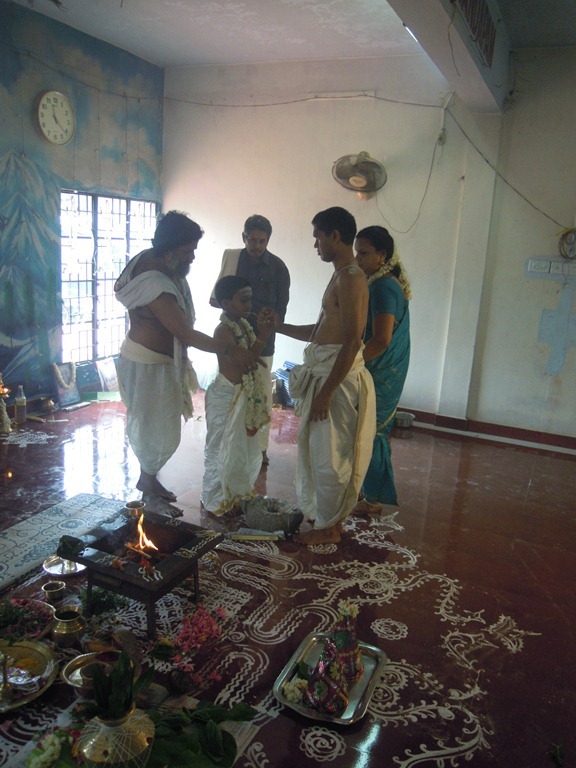 And now Advait is guided through some of the rituals of worship. He is, I think, hitting his head to activate his nadis, spiritual channels of energy. He is getting himself ready. There is a hand ritual done, interlocking of fingers. Advait is now wearing a silver ring, given to him previously in the ceremony. 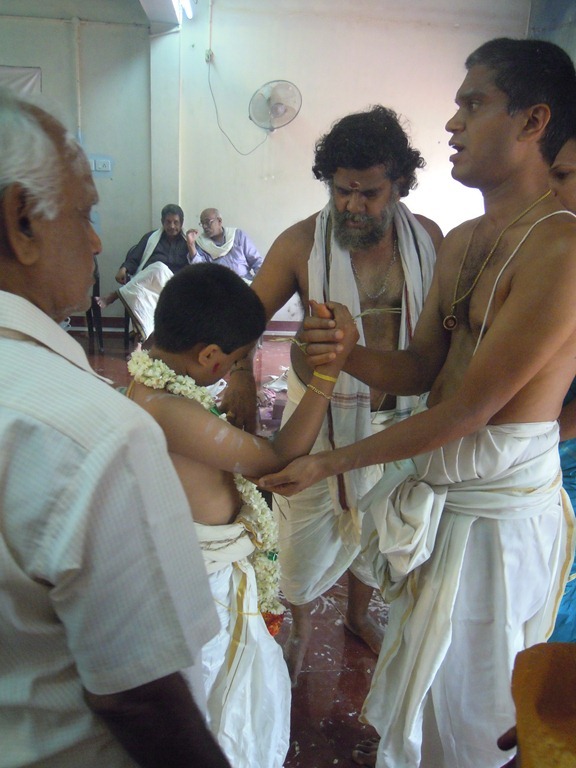 Advait is holding the Samidh while his father holds his hands and instructs him. 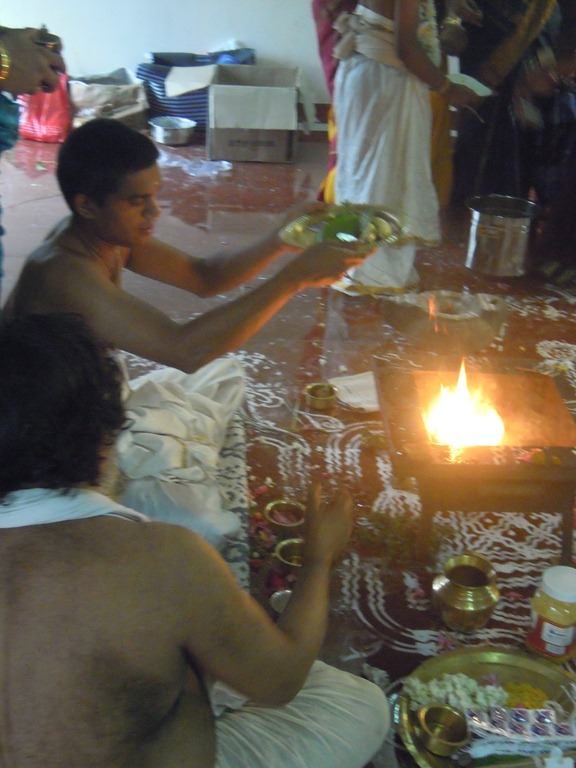 Advait is placing the one Samidh into the sacred fire. 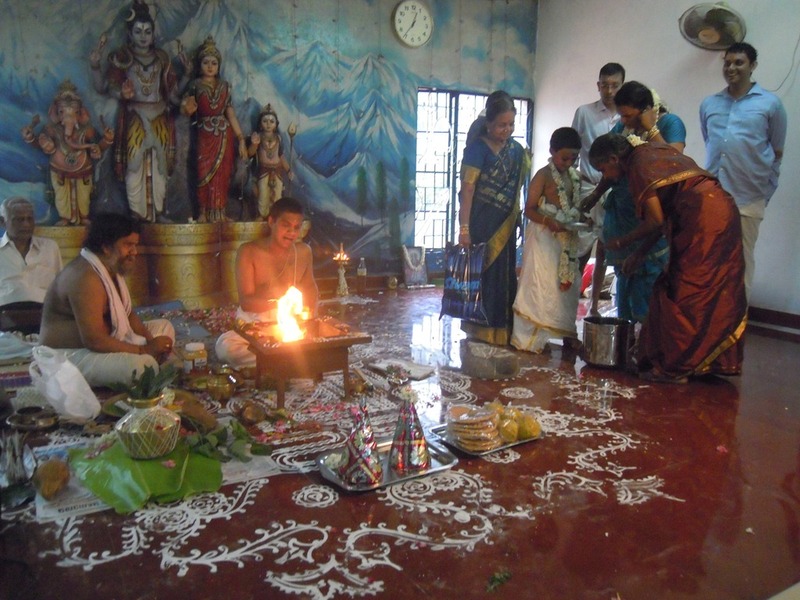 Then the Asmarohanam – standing on the stone – ceremony is performed. The boy is made to place his right foot on a piece of rock so that his will power will be like a rock and he can face anything with determination. 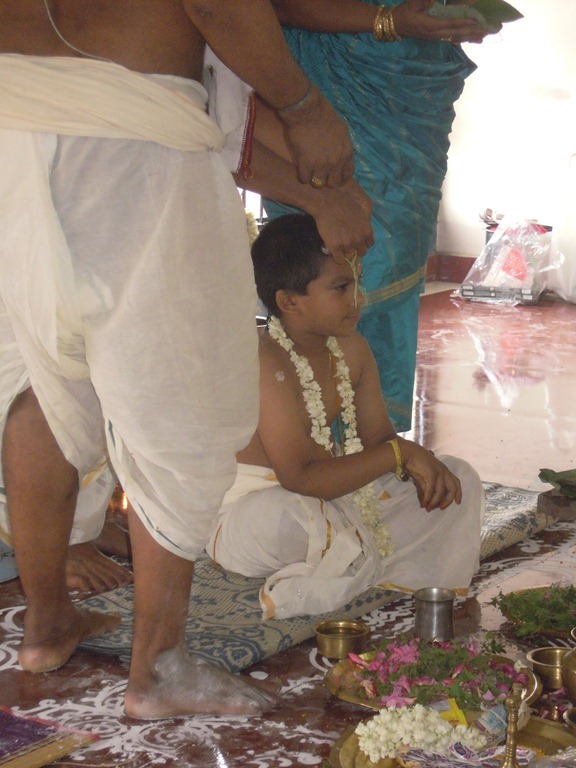 The teacher asks the boy to recite the following mantra – “be firm and strong like this stone.” (Note that a grinding stone was used in this ceremony. This kind of stone is also used in a Hindu wedding.) 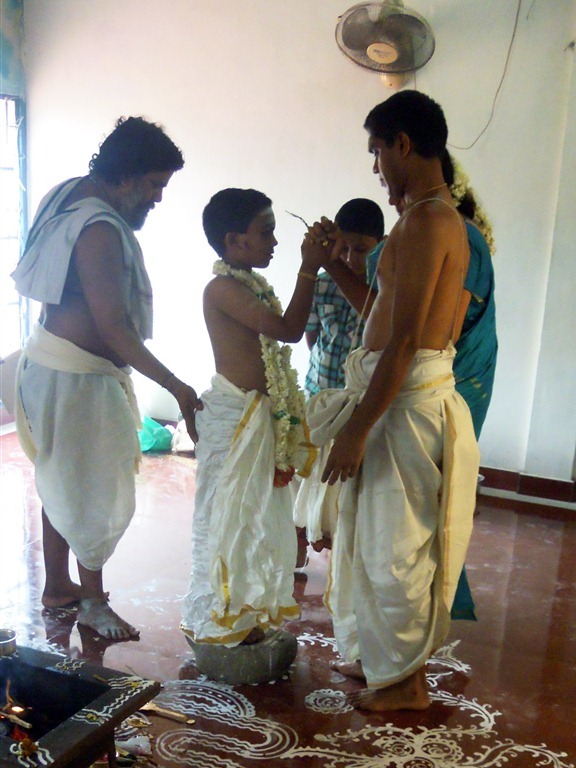 While standing on the stone, the teacher prays for his well being. The stone stands for strength and the ability to withstand anything. 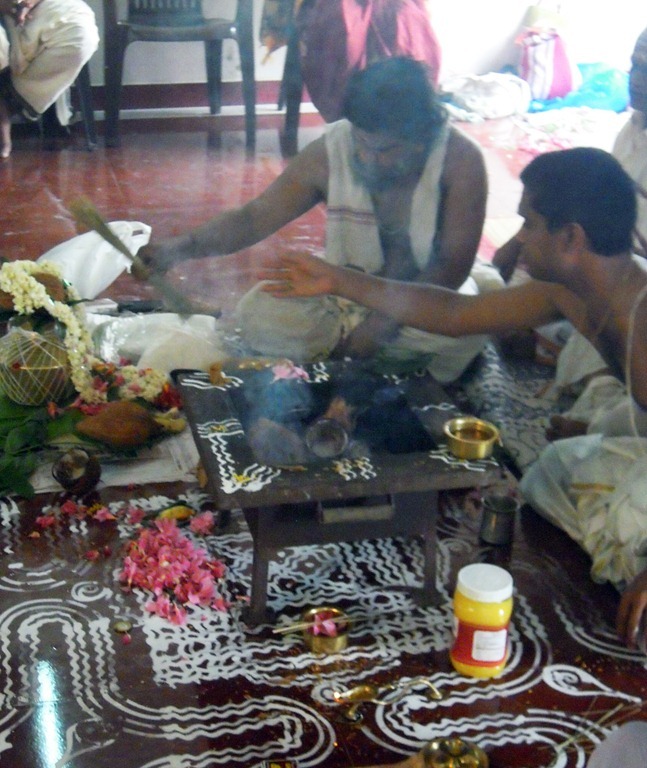 The ritual is symbolic of not being affected by the problems of life and to win over all internal enemies. Ganesh guides Advait onto the stone. 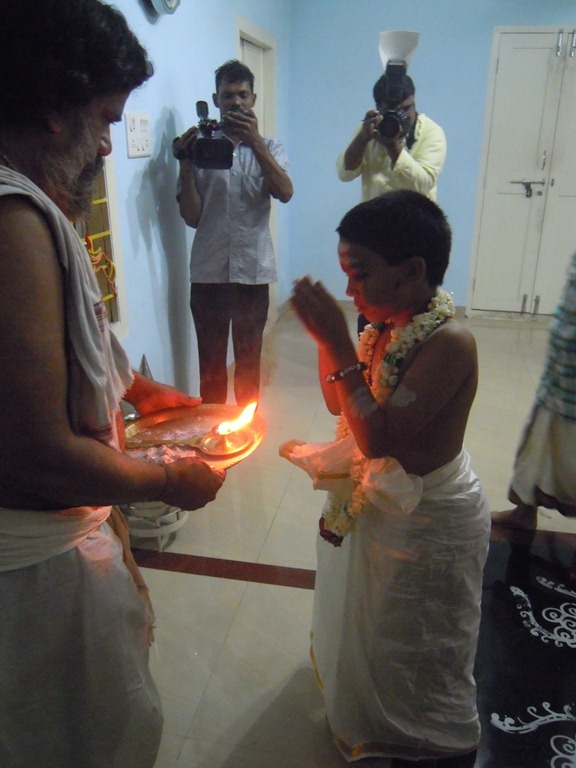 Mantras are chanted for Advait’s well-being. 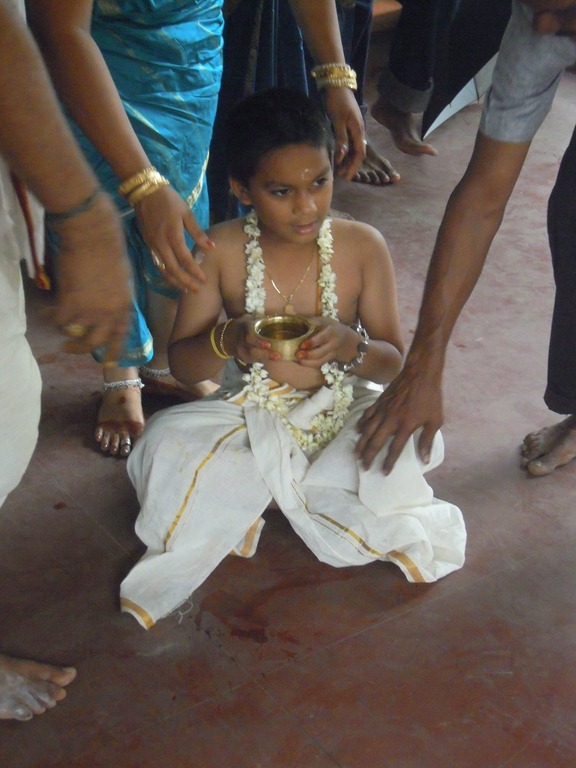 First, the Peetha Vastram. 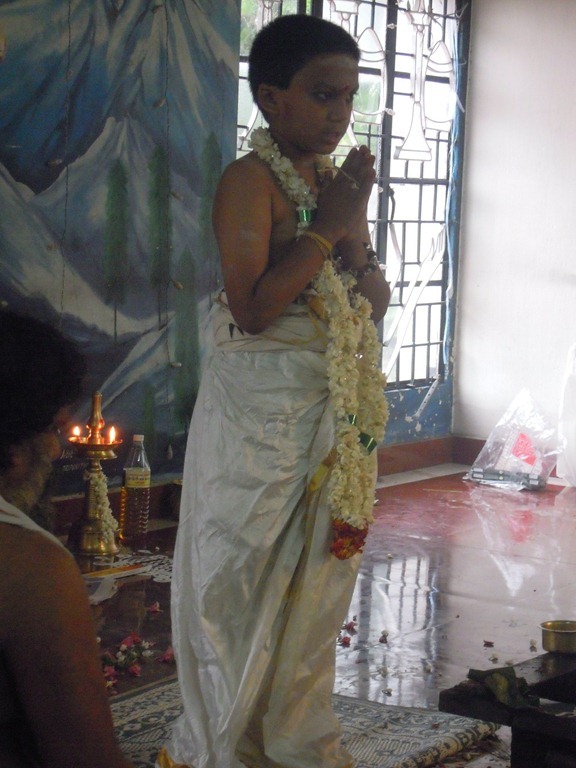 A white cotton dhoti is soaked in turmeric water and dried before the ceremony. All Hindus use turmeric daily in one form or other. …and winds it around Advait’s waist. 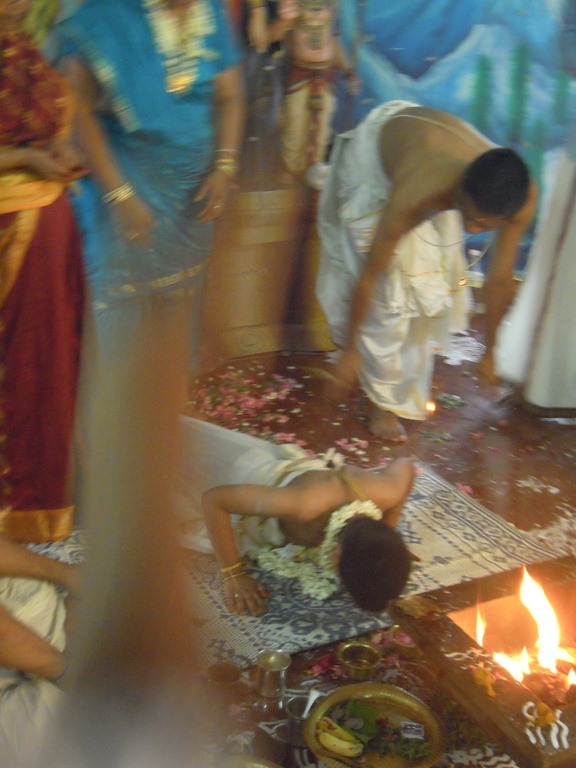 This being done, Dharba grass (as a Mounji) for purification of body, is wound thrice around the Brahmachari as a girdle (or belt). 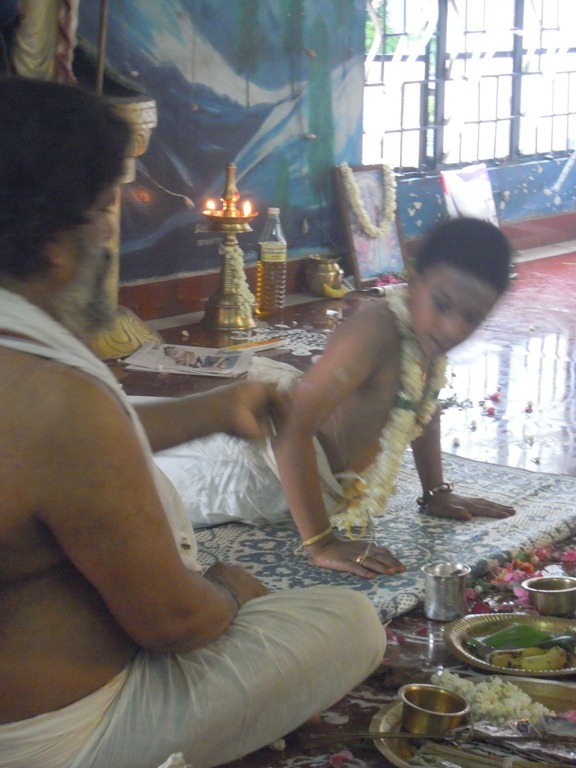 Next, Ganesh, attaches a piece of deer skin to Advait’s Poonal. This deer skin is a traditional part of the Brahmachari attire. 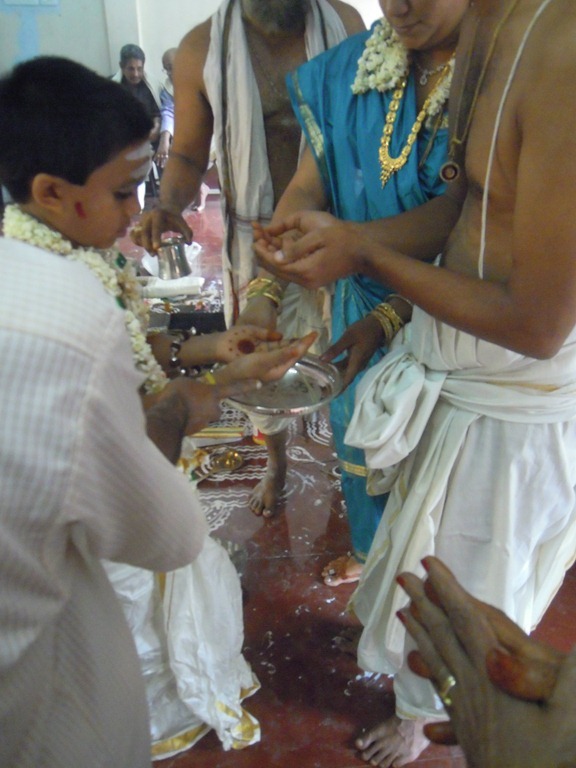 Drops of water are poured on Advait’s hands to bring immortality. This involves the father and grandfather, too. 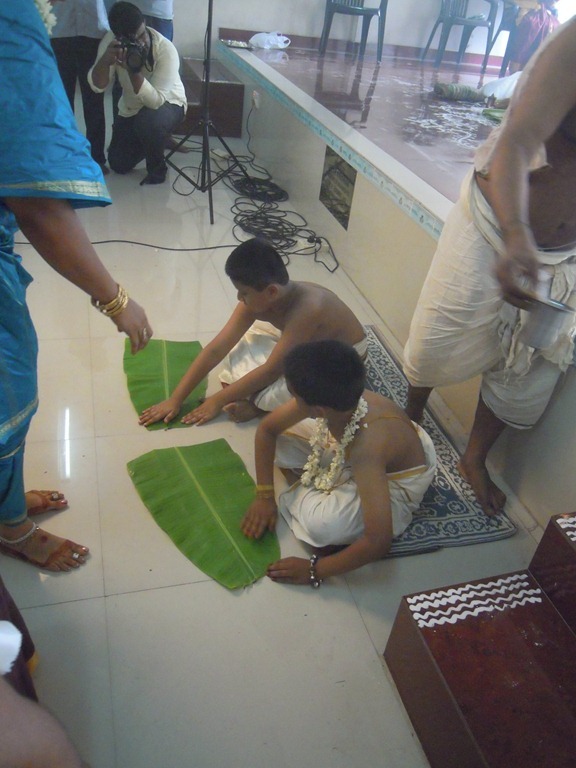 The water will first be poured through Ganesh’s hands, then Advait’s, then caught on a plate held by Dhanya. Here is the pouring of the water, and purification. 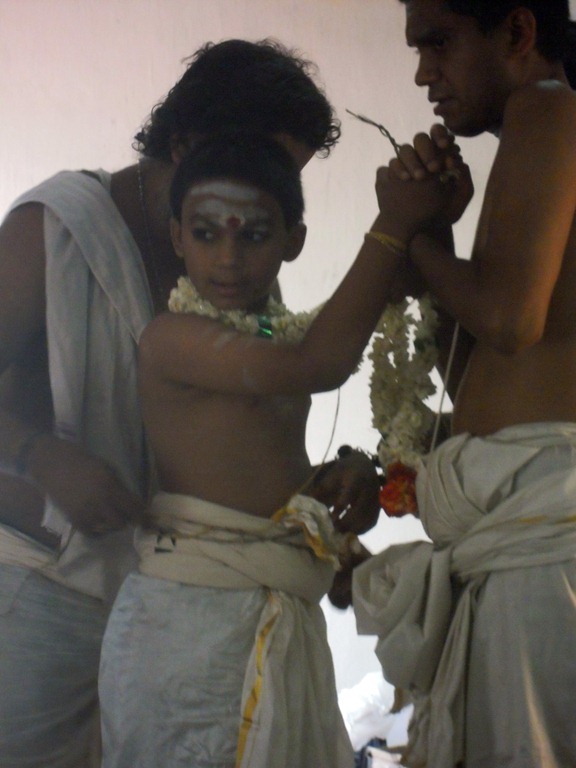 The father entrusts the boy to the care and protection of various deities. Ganesh chants, Advait responds. 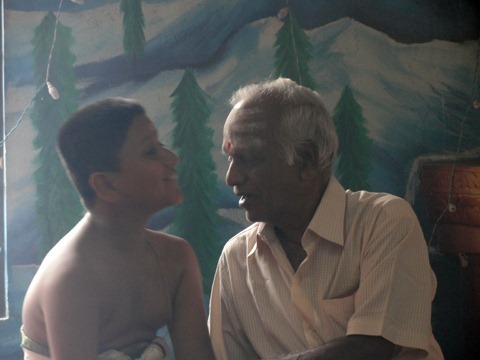 Grandfather Sadisivan whispers in Advait’s ear to insure the correct response. 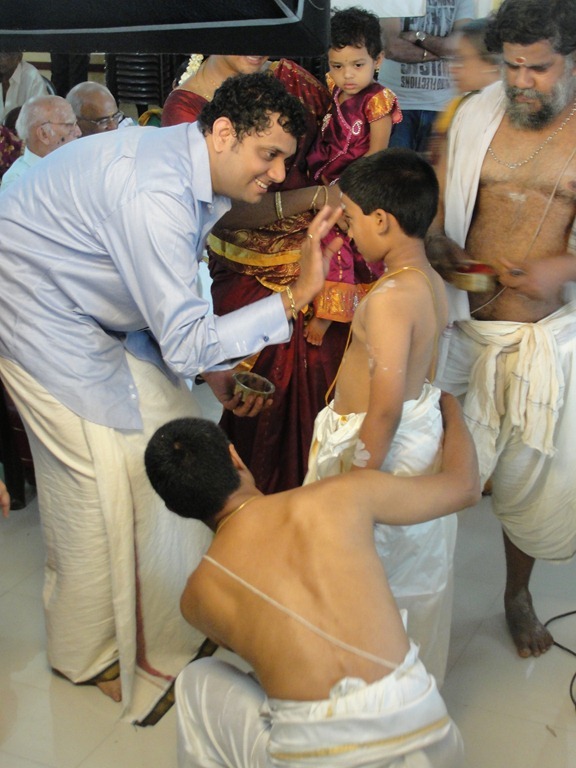 Uncle then puts gold and silver strands around Advait’s neck. Advait puts one over his head. Required for this is the boy’s sincerity and submission. By now, the hall has filled with friends of the families to watch this ceremony. The father is speaking to the boy. The father imparts instructions, meant only for the boy to hear. He speaks them into the boy’s right ear. 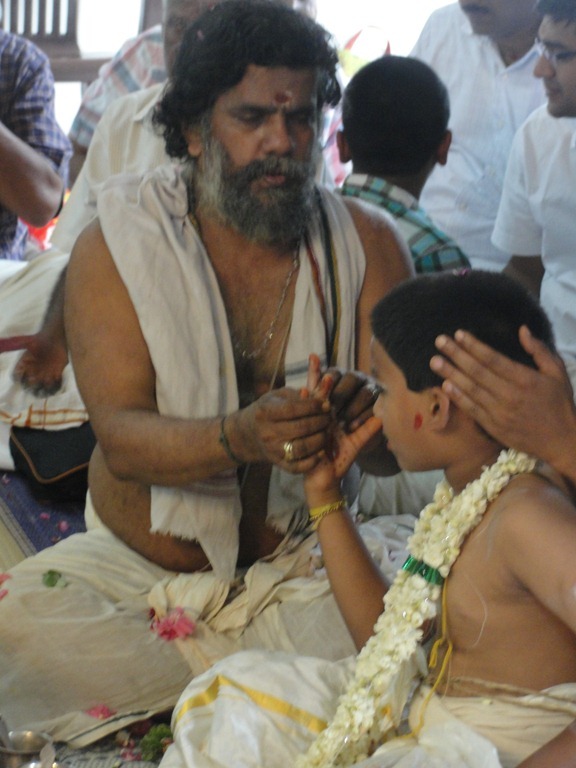 Here the father accepts the boy into his care and instruction. 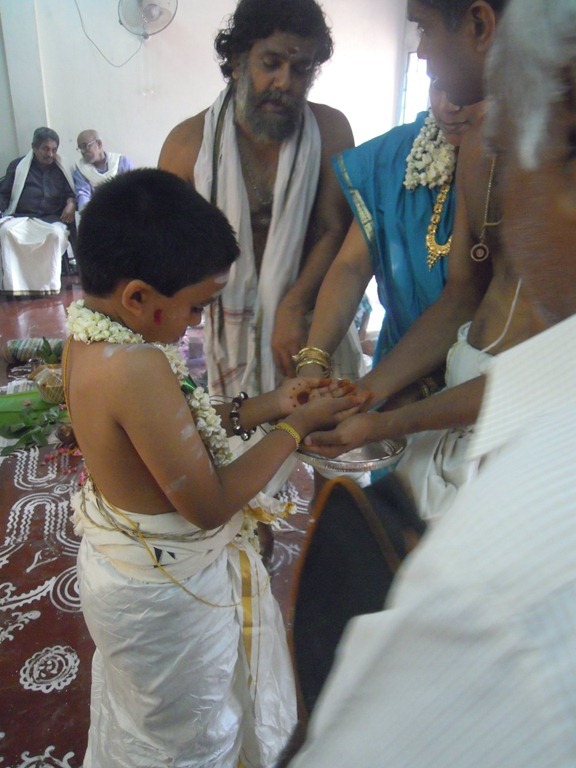 Prayers done by the boy, prayers to various deities. Dhanya is aiding, by passing fire to Ganesh. 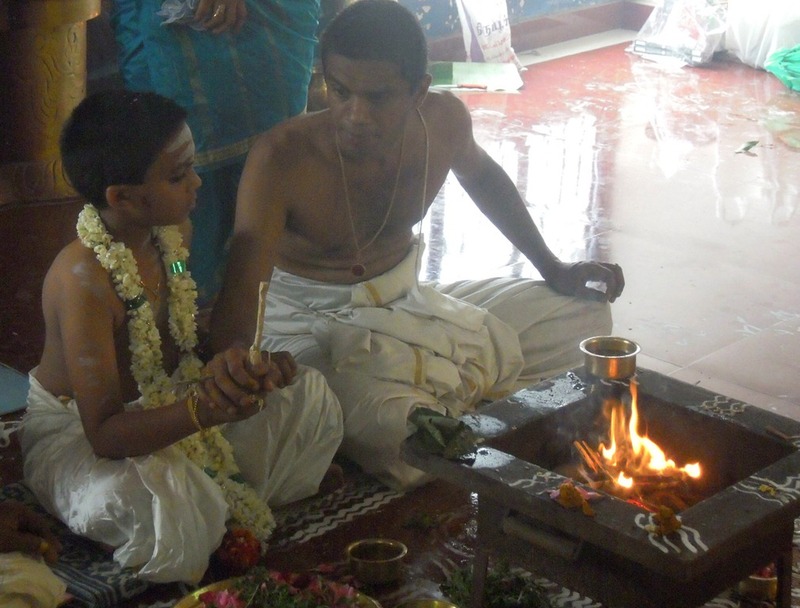 The priest is instructing Advait. 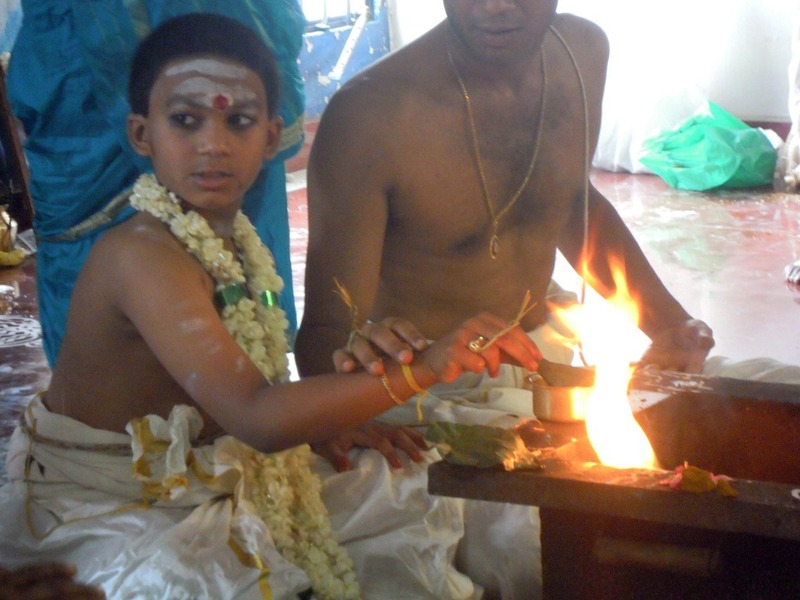 Advait makes a fire offering, guided by his father. There are six homas done. Prayers to Indra to be his friend and remove any obstacles during the Vratha. 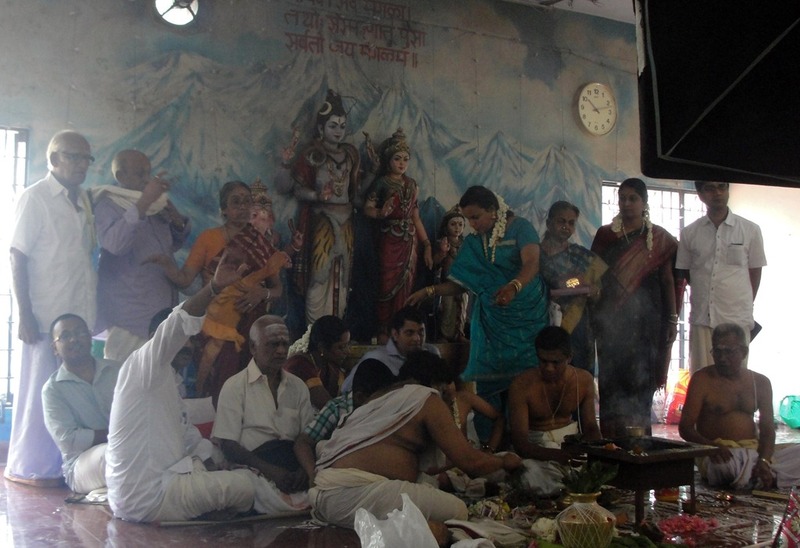 Prayers to Agni for longevity and will power. 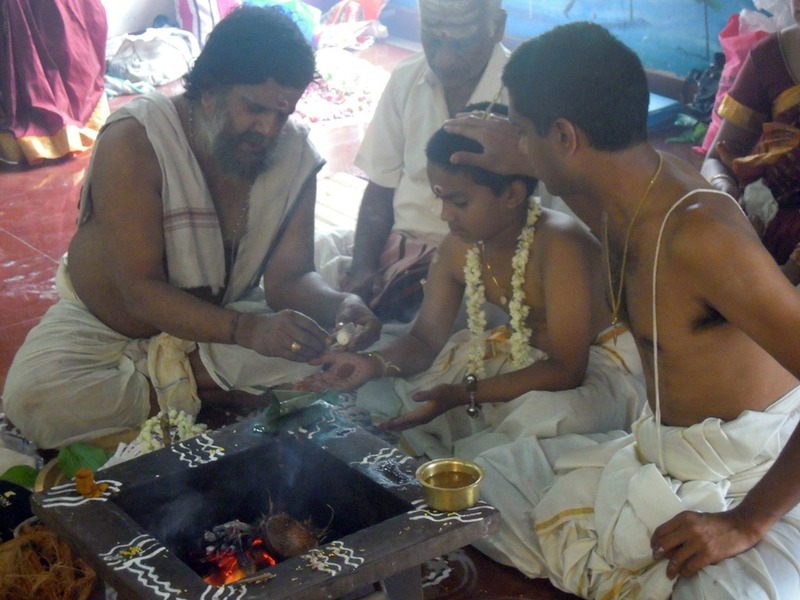 Prayers that Mrithyu should not come in the way for 100 years during the period in which he is son and father of his son. Prayers to Agni for health and mental stability. Prayers to Angiras and others for mental sharpness, grasping power, presence of mind, etc. Prayers to Apsaras and other Devatas for good IQ, humility, pleasing manners etc., to attract others and make him a praiseworthy disciple. 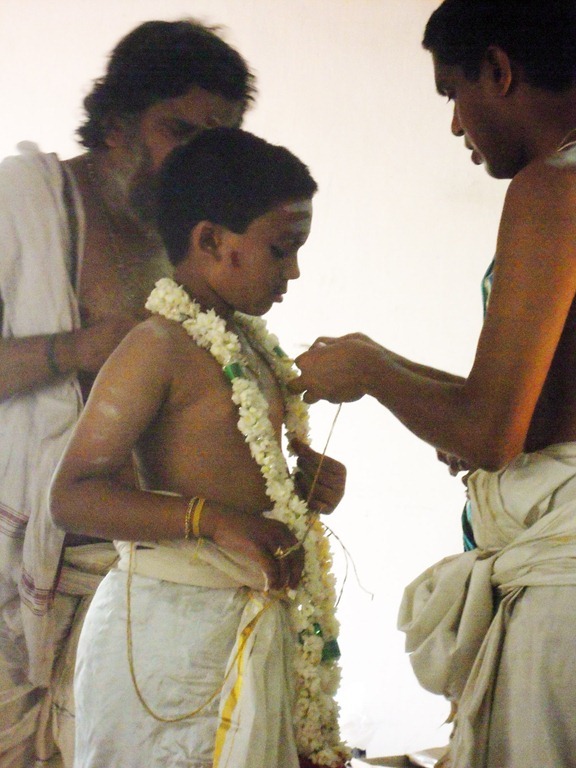 The boy takes a vow that he would become capable of performing his duties and responsibilities. 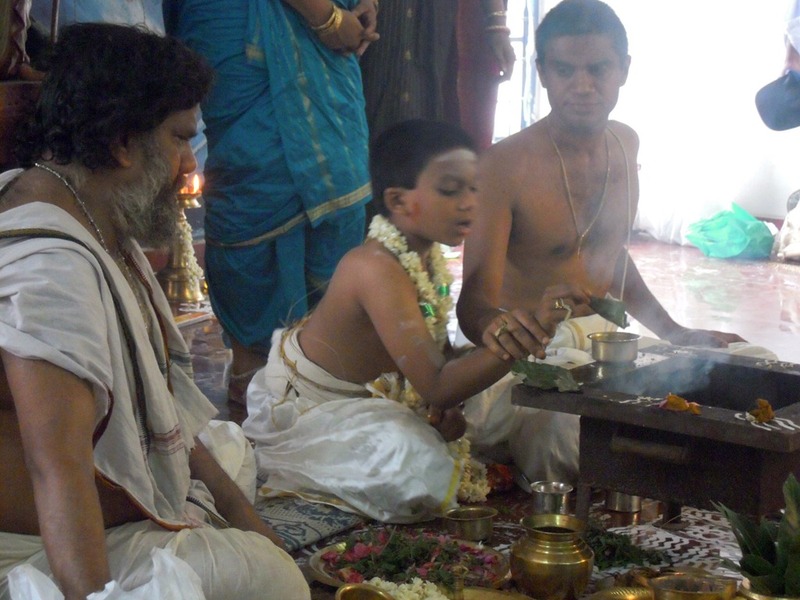 During this, he makes an offering to his father’s feet. 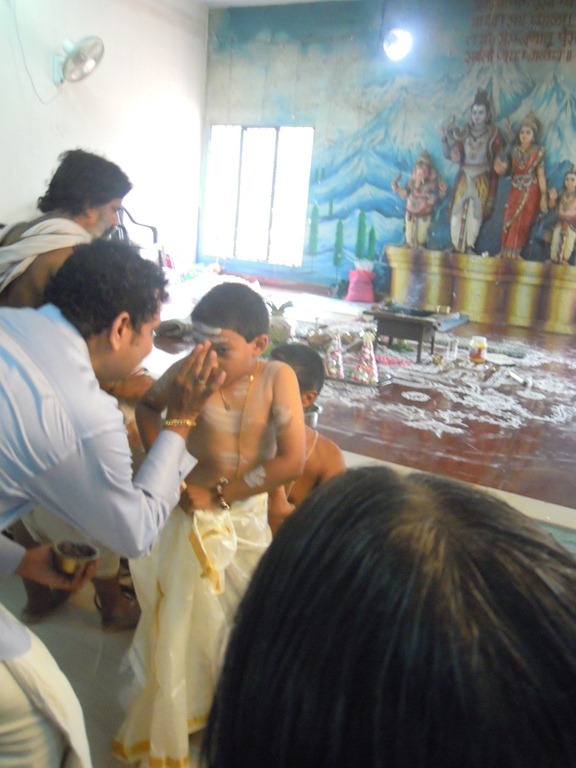 The priest gives Advait a blessing. 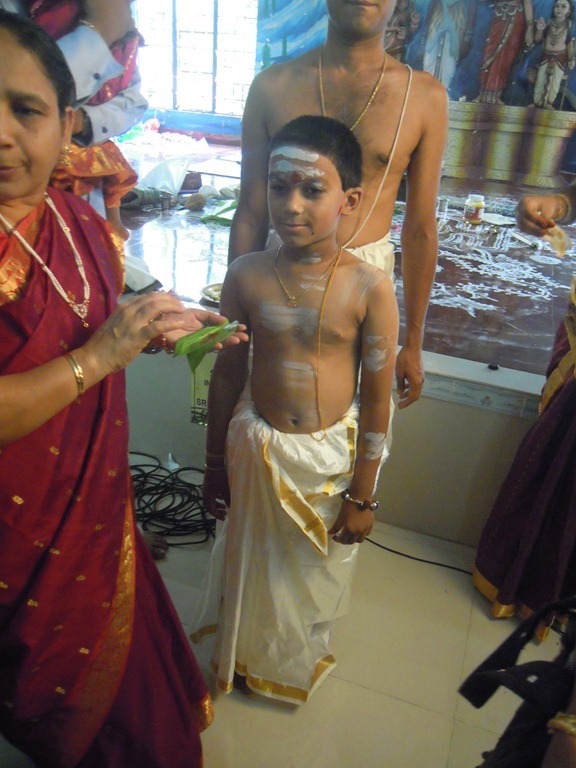 As a part of this, the boy wears the sacred thread declaring that this is the purest of all that gives knowledge and power, happening from the time of creation, and he would now get accustomed to it. This is a symbolic teaching, one mantra is taught – the GayatrI mantra – with the mantra recited in the right ear of the child. The mother, father, child, and priest all sit close together, and a cloth is pulled over them. The family stands behind during this key part of the ceremony. 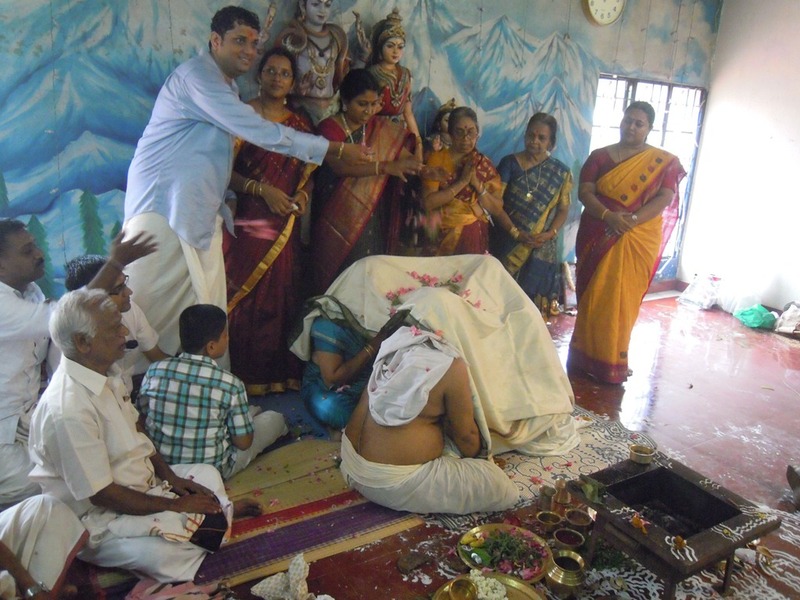 At the end, flowers are tossed onto the cloth that covers the group of four. All of the family gets involved in this flower tossing. Taking up the Phalasa Danda. This is a pledge to protect the Vedas and disciplines of Brahmachari. He is led to see the Sun. 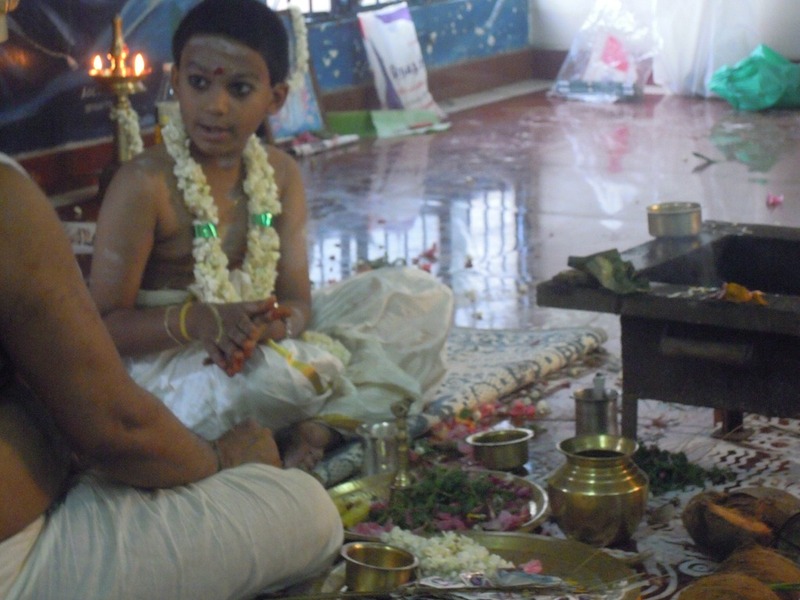 Here Advait is listening intently to the priest as instructions are given. He is led through a series of practices intended to energize his spiritual channels of energy. 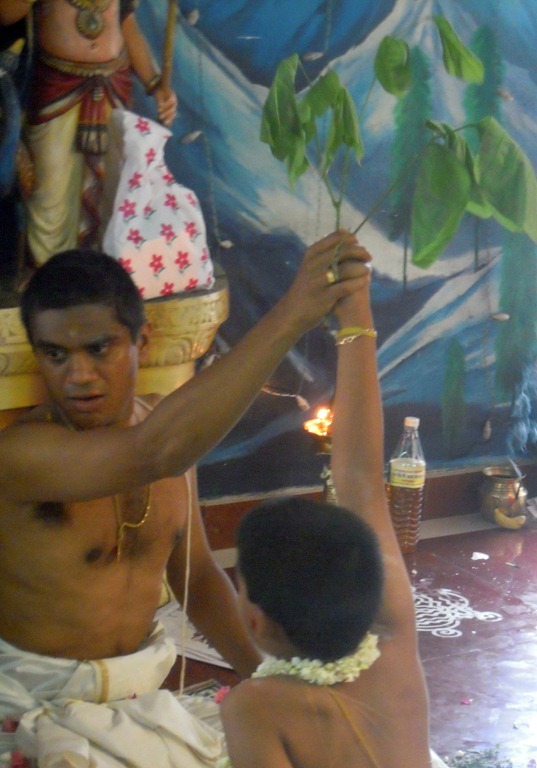 Advait is given a branch from a sacred tree. 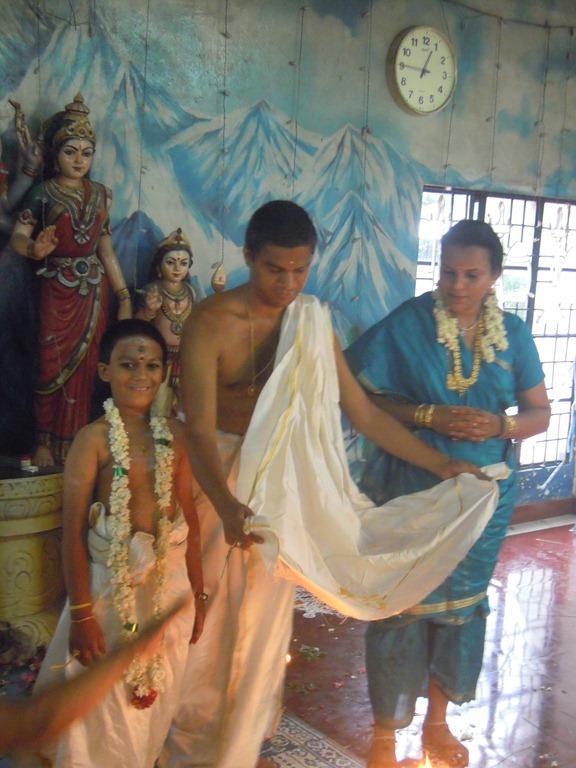 This ends with a procession of the boy and his father, accompanied by the mother and the priest. The boy and his father are sitting with the priest. 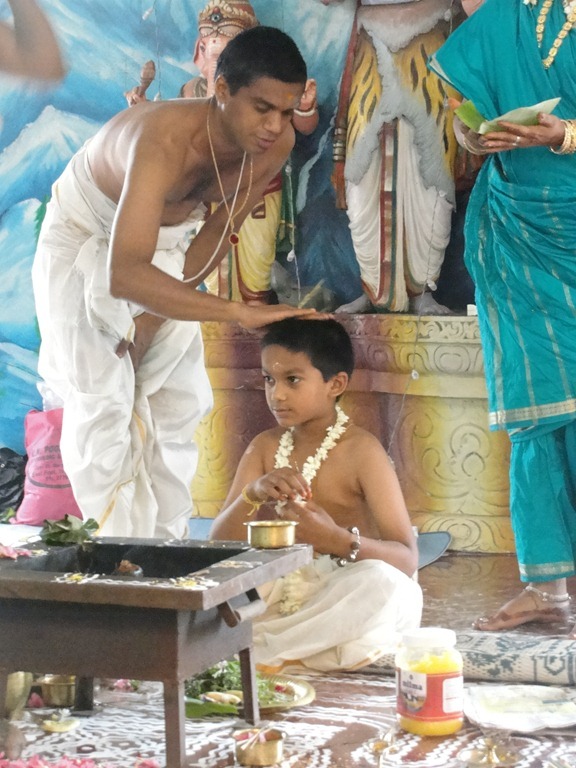 The guru formally accepts the boy as his student. 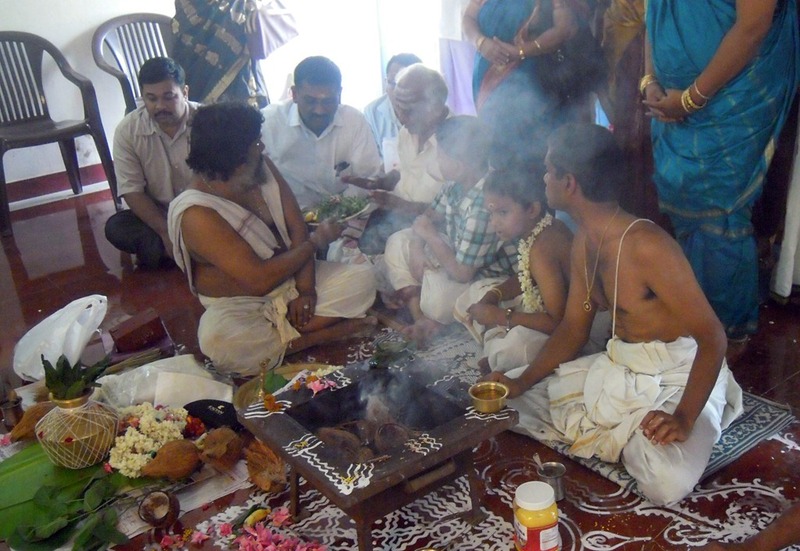 This part of the rite is done by the new Brahmachari with the priest. 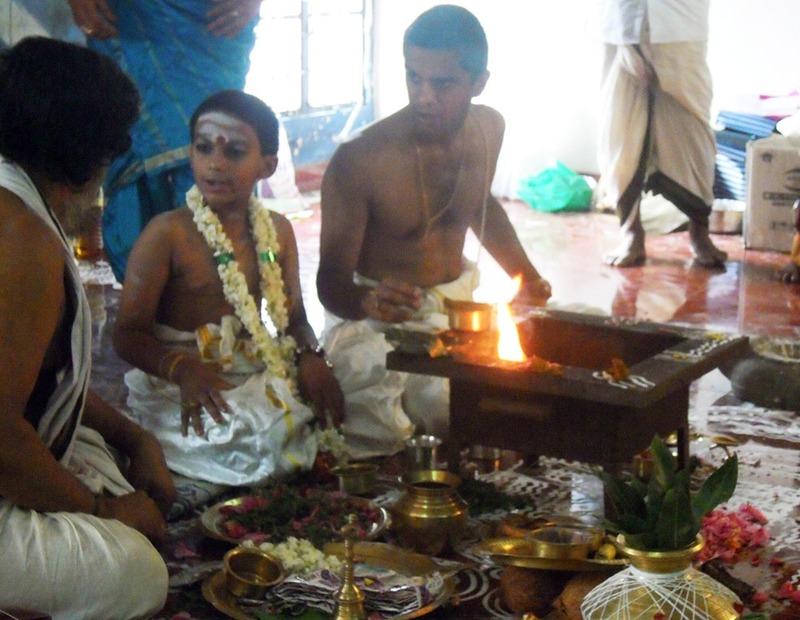 Advait is led through a series of rituals and offerings. It is just him and the priest. 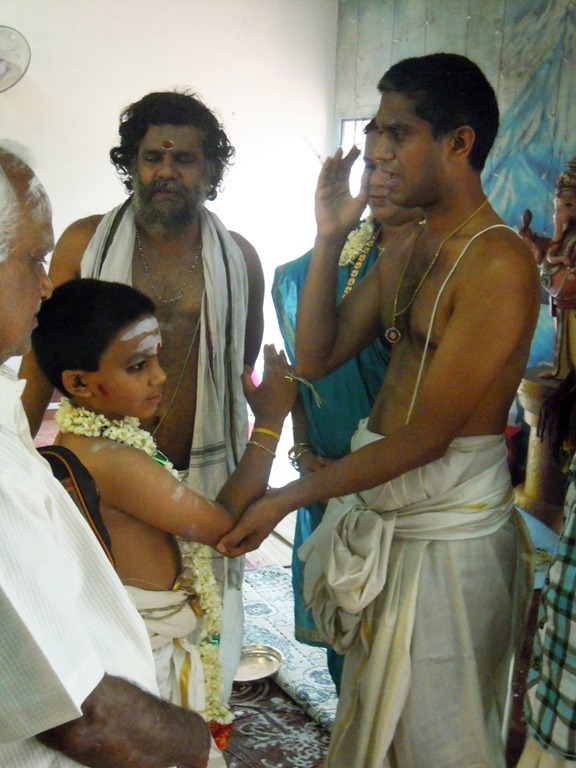 Advait is now a Bramachari, and no longer needs his father to be with him while he takes instructions and worships. Making prayers to the sacred fire. During this it seems that the crowd is not paying attention. They are chatting among themselves. Another fire offering is made. 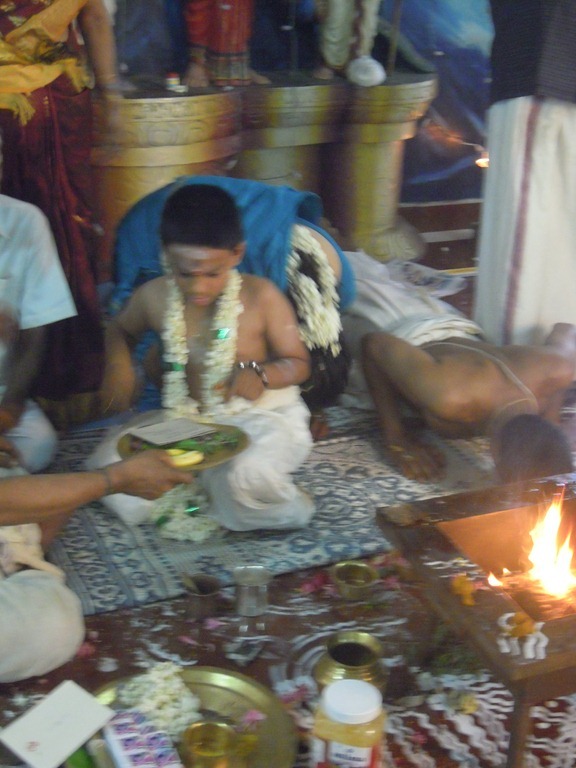 …and makes his pledge to Agni. 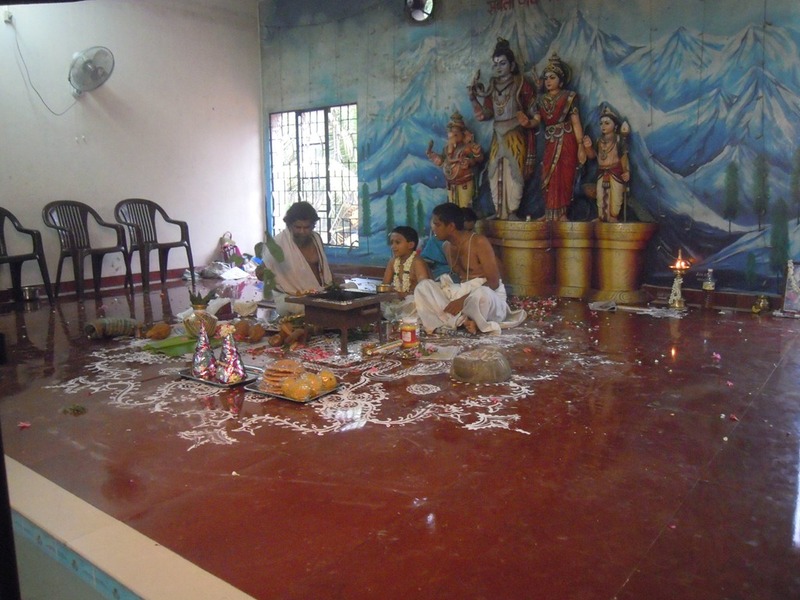 This is practice of the Teaching, specifically, symbolic begging for alms. 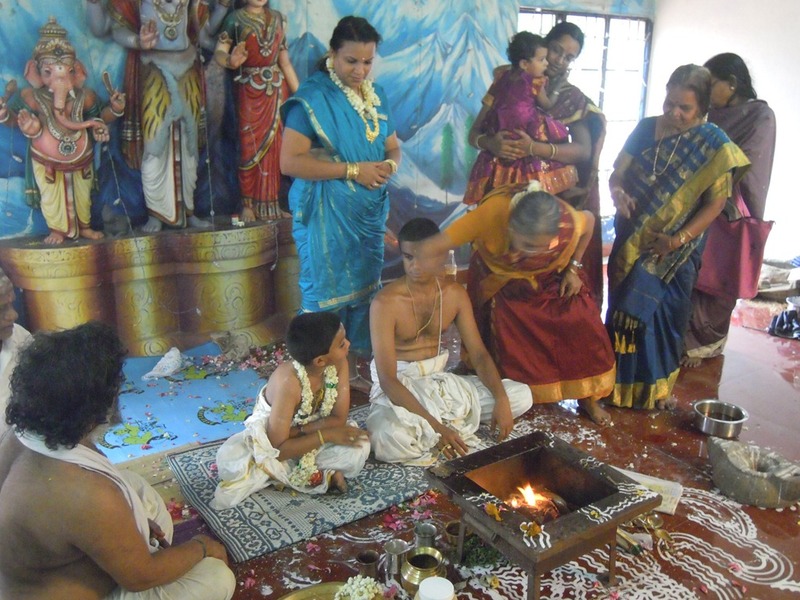 The family gathers by the sacrificial fire. Then Advait holds out a plate and takes a gift of rice. This starts with his mother and then his maternal grandmother. He does this again and again, I think from each female relative, grandmothers and aunties. 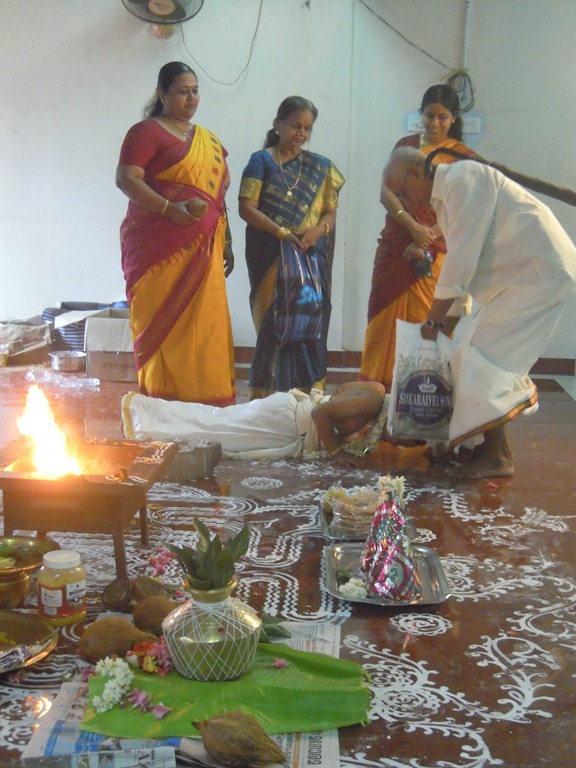 …making prayers and offerings to Agni. Then there are benedictions from elders. Ganesh stands with Dhanya and Advait. 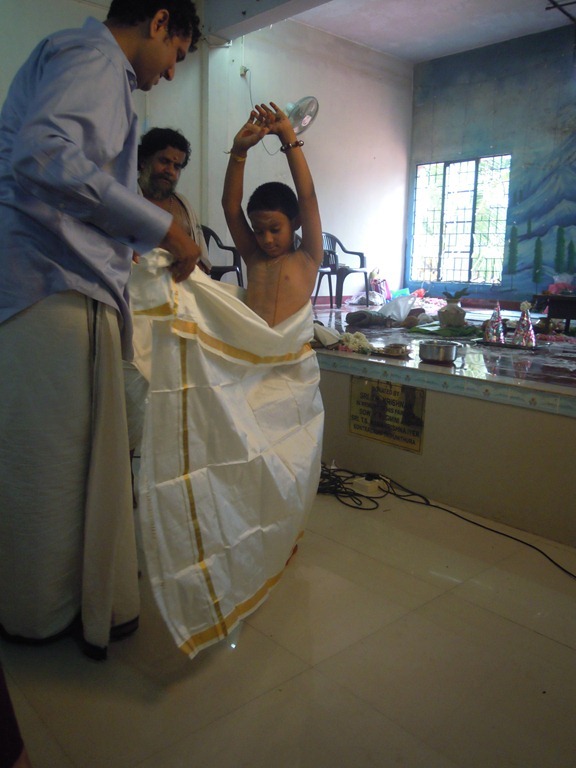 Ganesh holds out an open cloth. 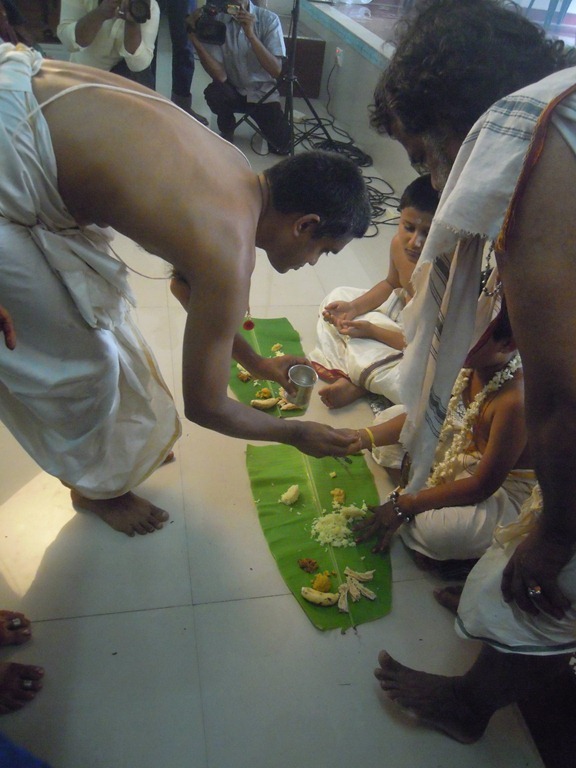 And everybody tosses rice grains into the open cloth, as a blessing. Then there are gifts to the boy. Most people give their gifts first to the priest. He then gives them to Advait. Who in turn passes them to his father. 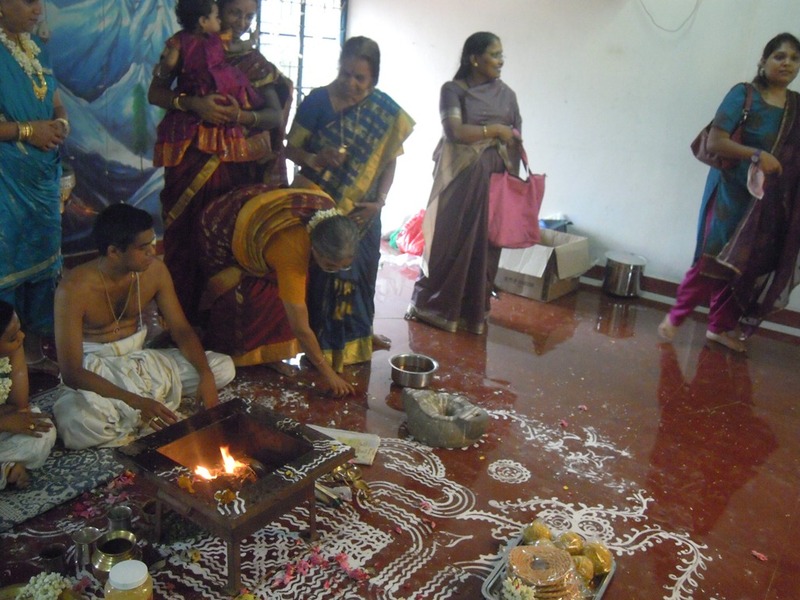 At the end of this, a plate with water and kumkum is brought out by the grandmothers. They pour a pool of it onto the floor. Then dot it onto the forehead of Advait. Then the relatives leave the stage. And the last part of the ceremony begins. This is just with the priest and Advait. These are prayers to the gods and the commitment of the boy to the act of learning and to become wiser. This is the purpose of the Brahmachari. 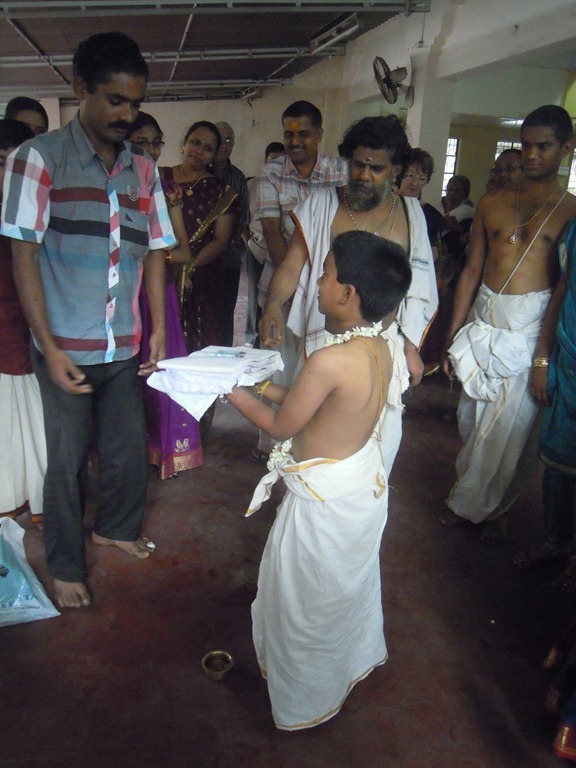 At the conclusion of this ceremony the child is ready for the educational samskaras – catvari vedavratani – the study of the Vedas. 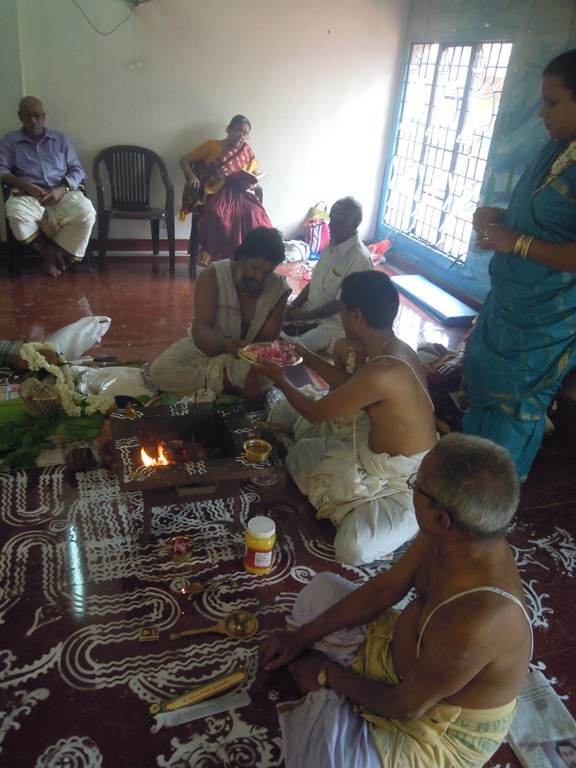 I am not sure what is actually done by Brahmins in this modern era. 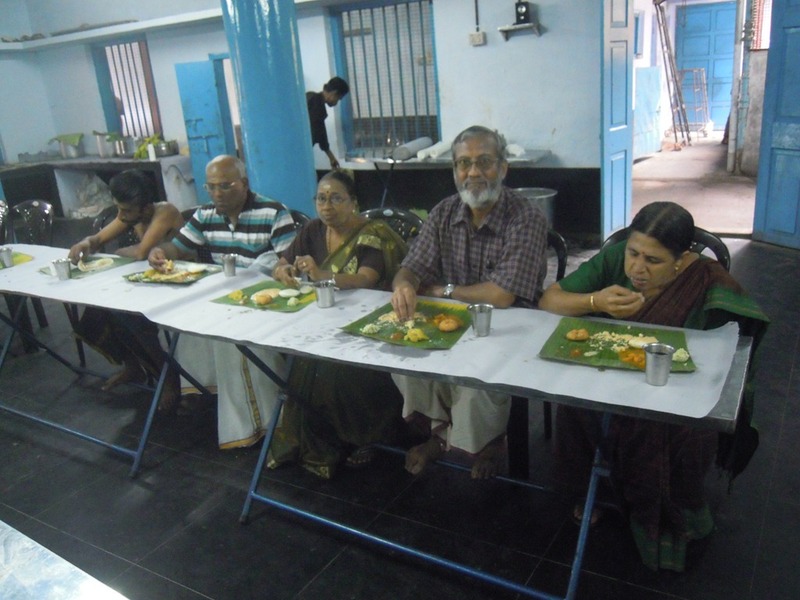 After the Upanayanam, there is a meal offered to all that attend. It was such an honor to have been invited to witness this ceremony. 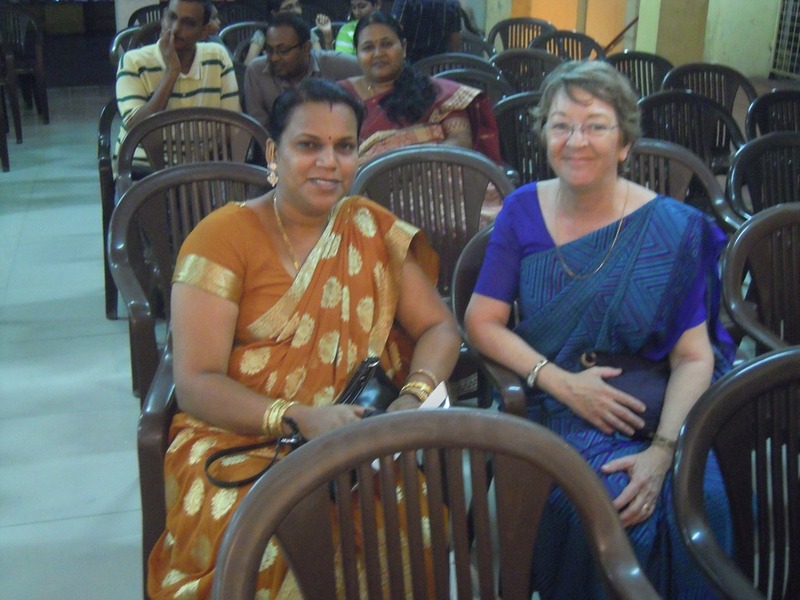 We are most grateful to Ganesh and Dhanya’s families for including us. Note: I have drawn information for this post from many sources, including from Ganesh himself. I have done my best to label what I think are the proper names and actions at the right place in the photos. If I have erred in any way, please let me know and I will correct it. I want this to be as accurate as possible. This entry was posted on August 4, 2013 at 1:12 pm and is filed under Festivals, Celebrations and Rites, Rites of Passage. You can follow any responses to this entry through the RSS 2.0 feed. You can leave a response, or trackback from your own site. Thank you. I tried my best to make this a good report. Much research was needed since I knew so little about this. Thanks for the useful explanations. That was a very detailed explanation. I myself recently decided to put the poonal (even though I’m 18), and I was curious as to what exactly the processes are about. This was very helpful. Thanks a lot! 🙂 It’s quite interesting to see this from an American point of view- I’ve only known Indians attend a poonal. Nevertheless, I loved this article. I tried to be careful and take photos of the whole process. I only began to understand it, though, in the research after the event (trying to figure out what happened). I am very glad it was useful for you. thank you for the brilliant review and for excellent grasp on the topic. Your work is fabulous.I feel either indian goverenment or USA govt should give you some cultural developer award for such good travelling and collecting important information….. Yes, each state is different. 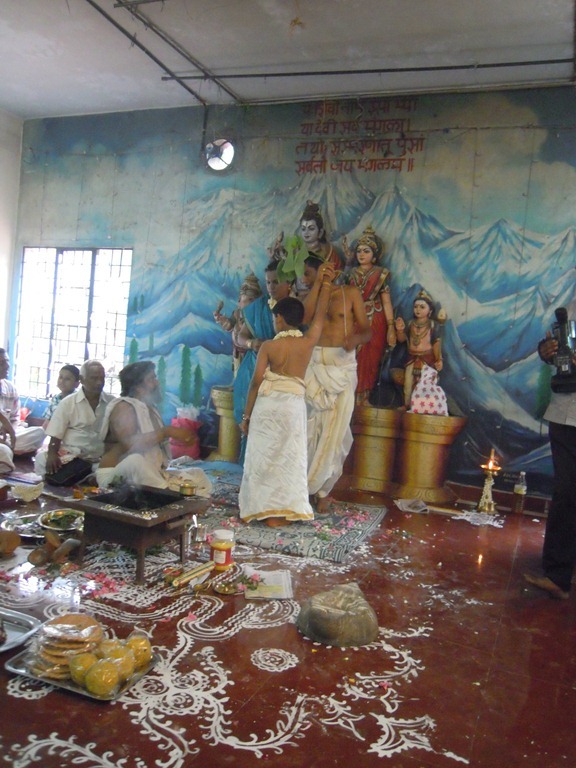 We write most about TN since that is where we live, and so know the most about. 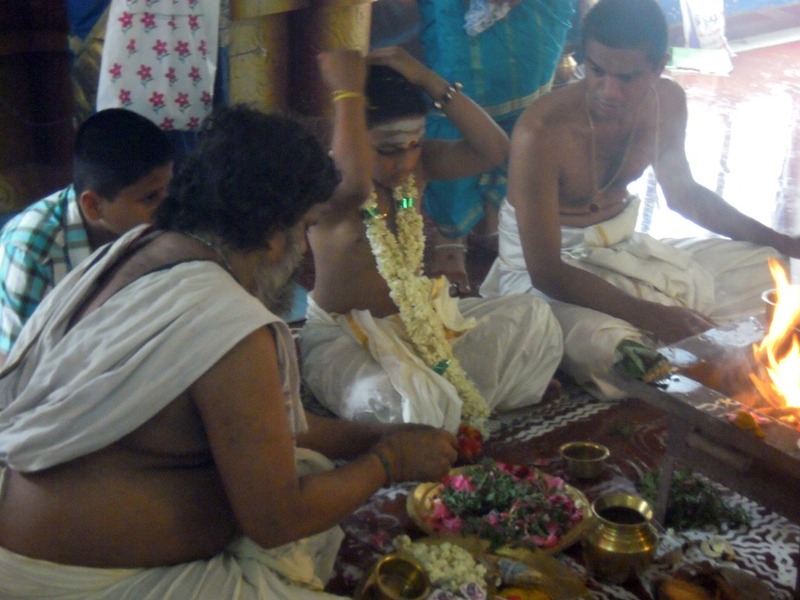 The ceremony involving 12 Brahmins on the day prior to that of Upanayana (or wedding) is called Naandhi Shraddham. 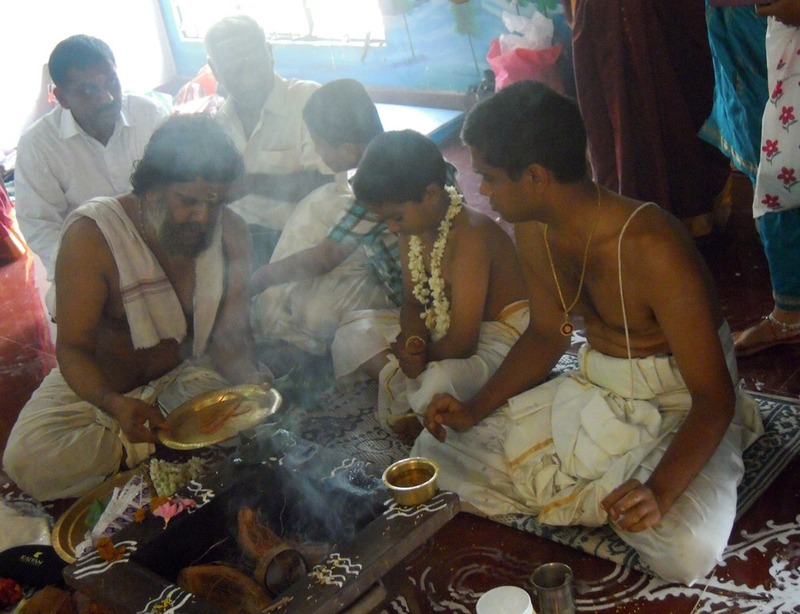 The Pitrs or forefathers to the third level on both father’s and mother’s side are represented by the 12 Brahmins. This karma is done to remember and honor the forefathers and seek their approval and blessing for conducting the ceremony to follow the next day. Certainly we Westerners see them with an entirely different cultural set of ideas. What can you expect? And since I am a Westerner, I write what I can express, though I try to study (and obviously, as shown in the photos, observe) and know more. 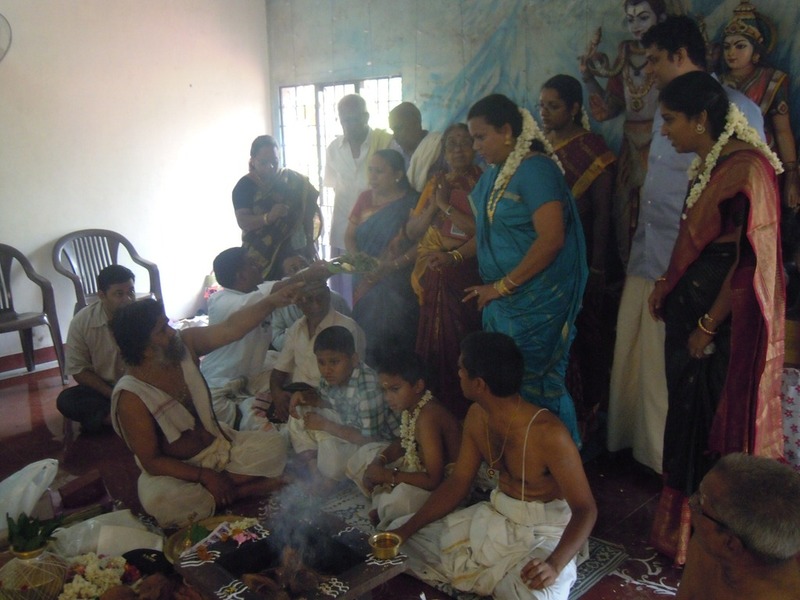 As Westerners, we may never really know what it is like to live in a family or society that has traditions that are thousands of years old. And certainly as I know more I can be a better observer the next time. 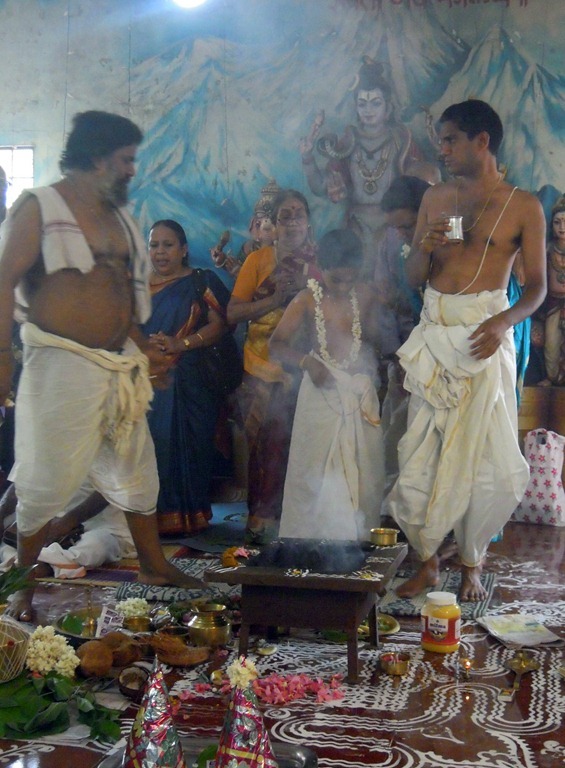 When I searched on the web I found many Indians writing detailed procedures for the Upanayanam, but found no pictorials that showed it in detail. Perhaps you should write one? If you want to, I can give you author rights on this bolg, so yoou have a place to publish it. 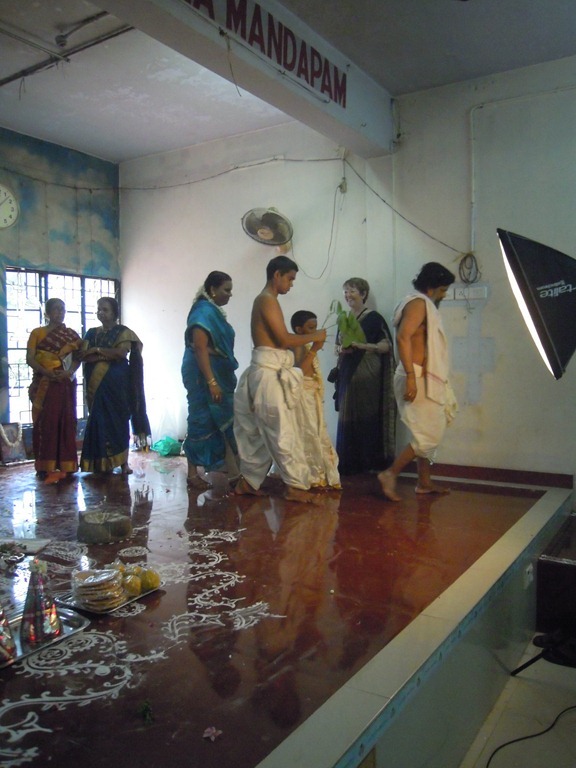 Richard’s work is commendable in the sense that it provide pictorial evidence of the most sacred ritual of the Hindu(Dwiza) rite de passage. 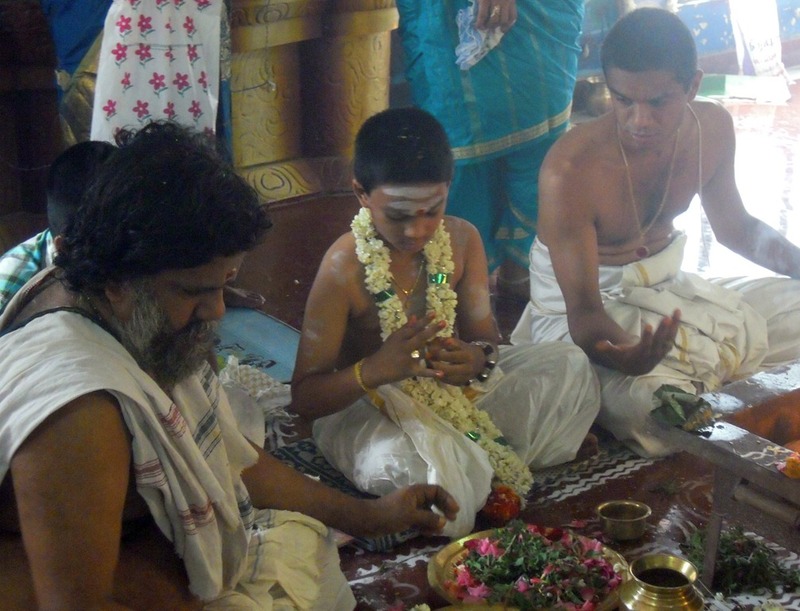 These ceremonies are not declining in North India,North Indian system is some what different than south as they are not so eleborate and rigid.The Upnayana is 8 most pracalticed samskaras out of popular 16 in north as per an anthropological study conducted under me for Doctoral degree in 1996. I congratulate him for this important document very useful for anthropologists and Indologists..
Richard,Im also a Hindu from North India but these ceremonies are decreasing day by day even among the Brahmins of North India..You have done a brilliant piece of work.Im also an anthropologist and loved the step by step coverage..Good luck. It is my sense also that these rites are on the decrease in the long term. That is why I want to take such care with articles like this. Thank you for your kind words. Another Magnum opus of yours. Your hard-work and passion is much appreciated. Being an Anthropologist I find your work on the level of ,or better ,than anything I´ve seen published in Ethnology.If you are not in this field , you should have been. Thank you for this wonderful post and amazing photos. Thank you for the kind words. I think it is important to document these rites of passage, there is so much to them, they are so deep and rich with meaning. And it is a privilege to be invited to do so by the family.